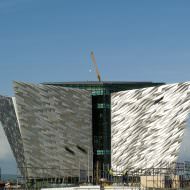 In 2003 the Northern Ireland Tourist Board’s (NITB) Strategic Framework for Action 2004 – 2007 identified five Signature Projects to enhance the tourism offering. 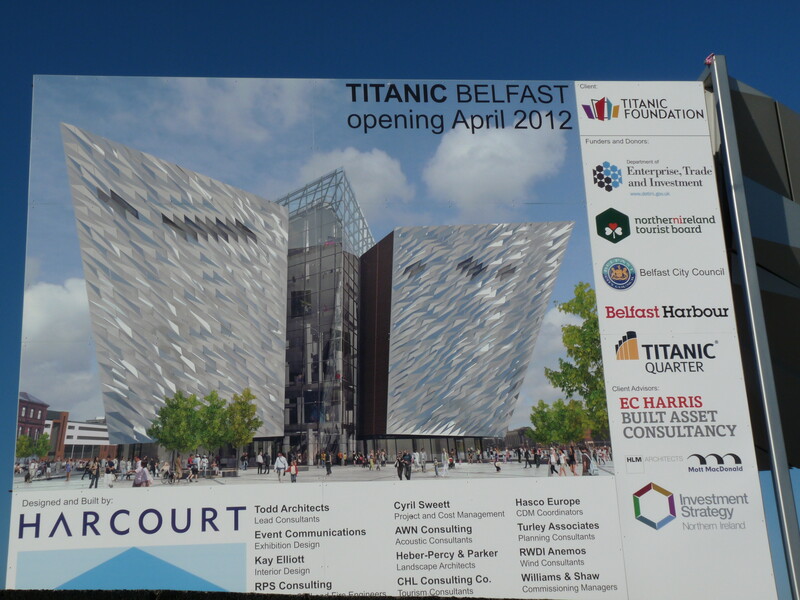 The Titanic Signature Project (TSP) was one of these projects and is based upon the Titanic and Maritime Belfast Heritage theme. 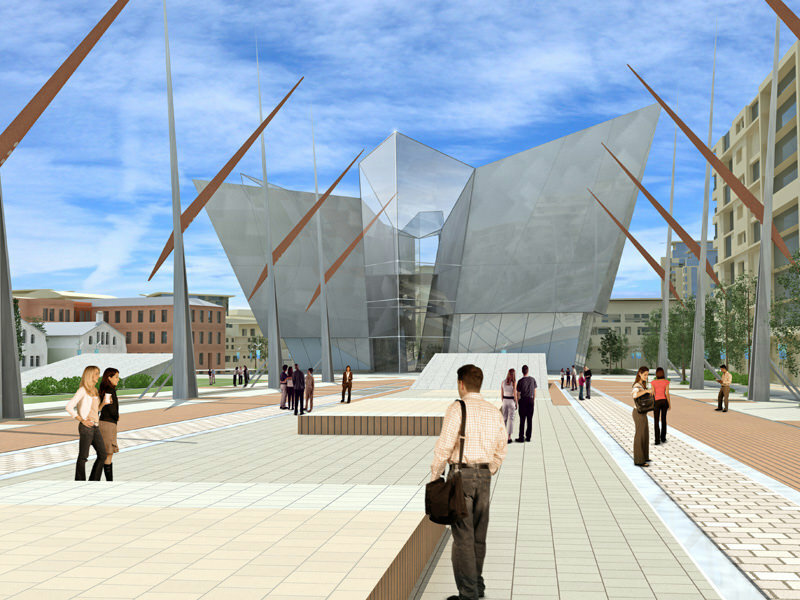 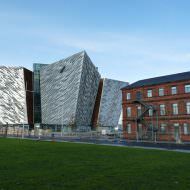 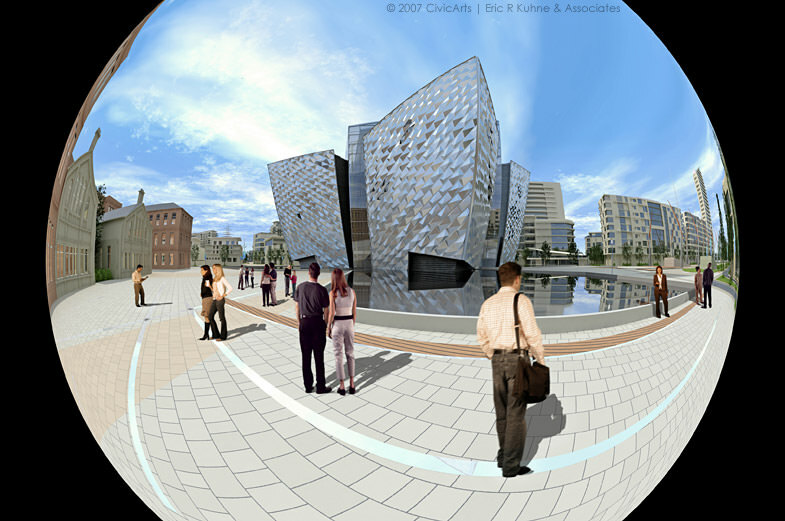 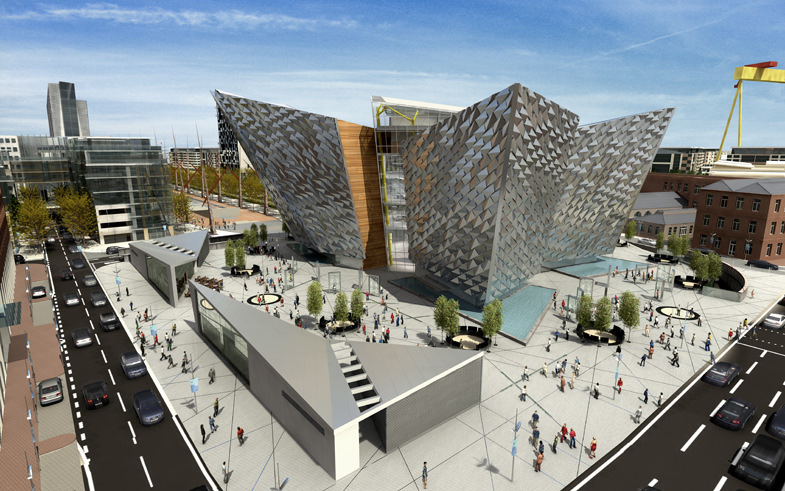 One of the objectives of the TSP was to establish a “world-class visitor attraction based on the theme of the Titanic and the wider achievement of Belfast’s shipbuilding and maritime history” and “create an innovative and original attraction of such scale, originality and innovation that it will become Northern Ireland’s largest and most successful built visitor attraction, having a significant positive impact of Belfast’s position as a tourist destination” To fulfil this objective the Titanic Signature Building was proposed as the central element within the TSP. 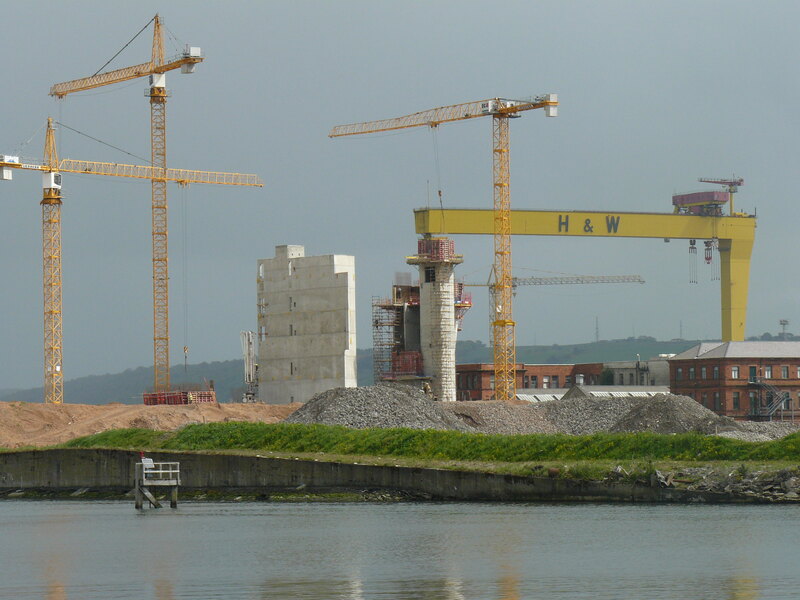 The TSP now consists of the Titanic and Olympic Slipways; the Harland and Wolff Headquarter Building and Drawing Offices; the Thompson Dock and Pump House; HMS Caroline; SS Nomadic the H & W Steam Cranes and the Titanic Signature Building. 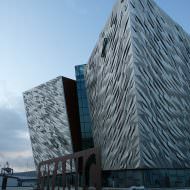 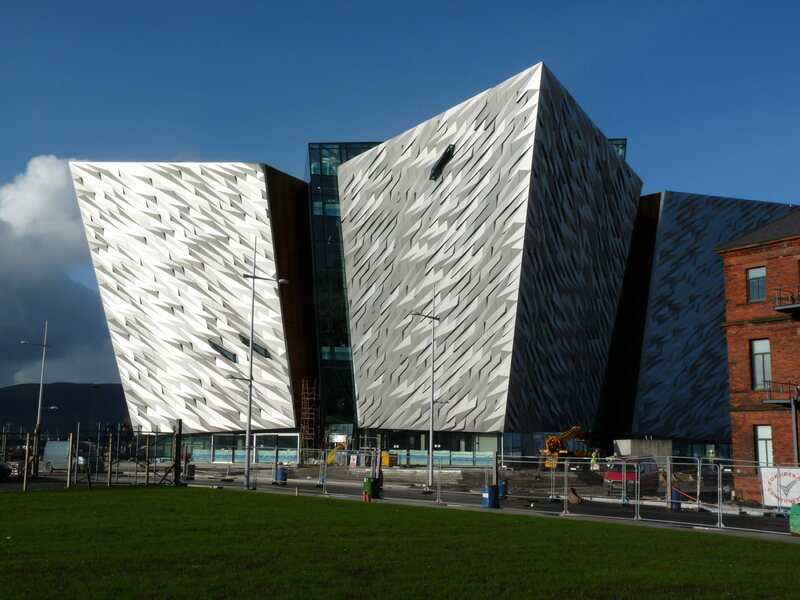 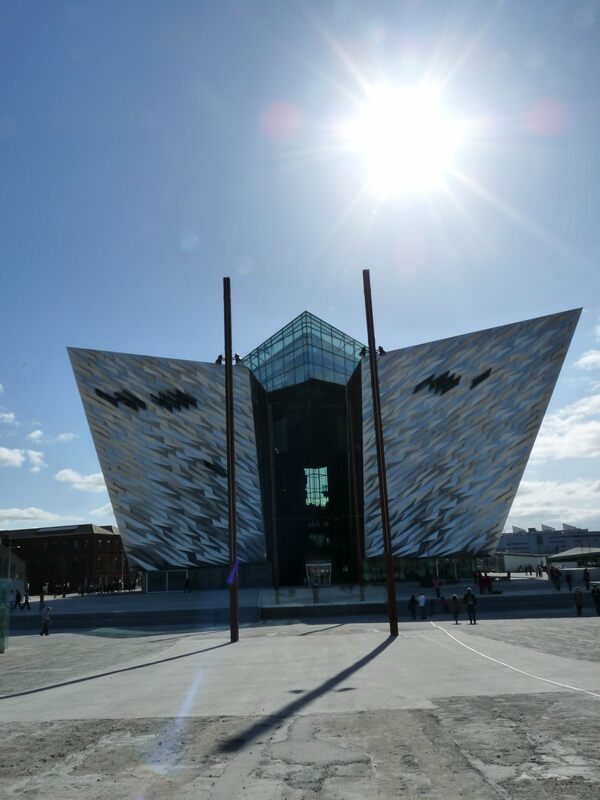 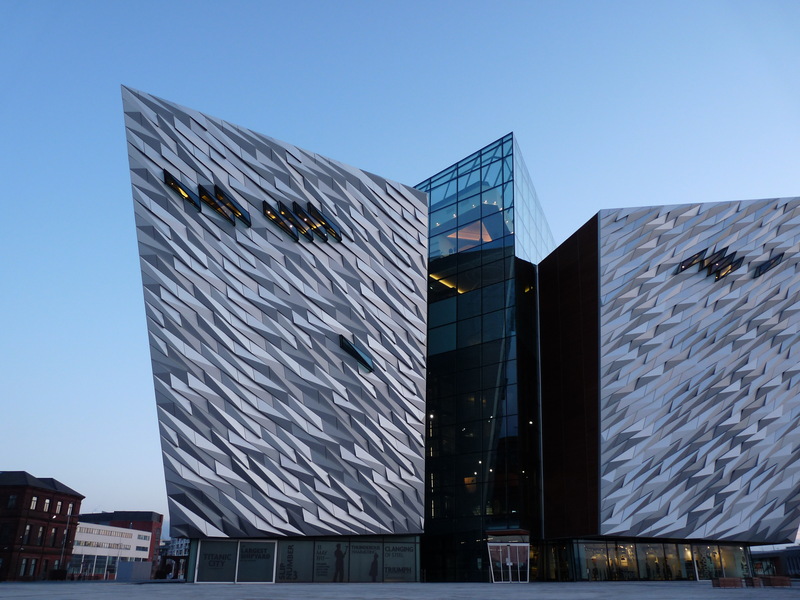 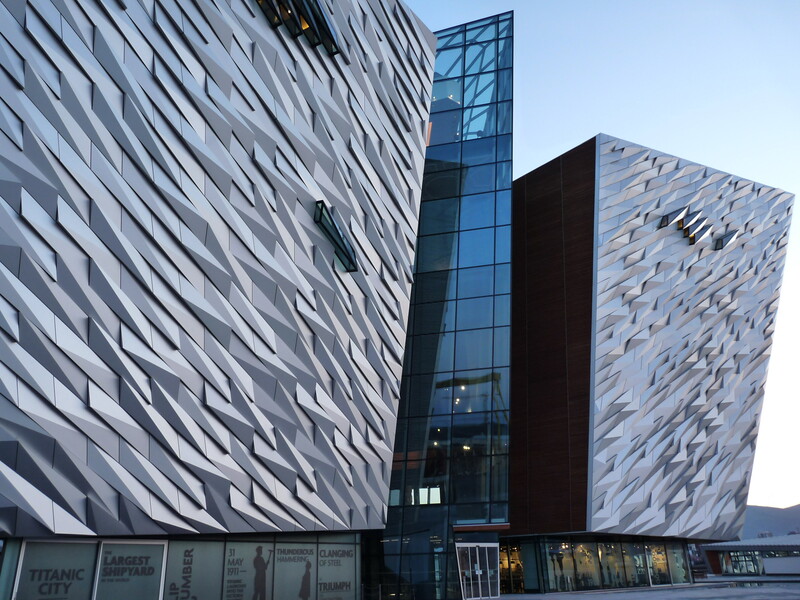 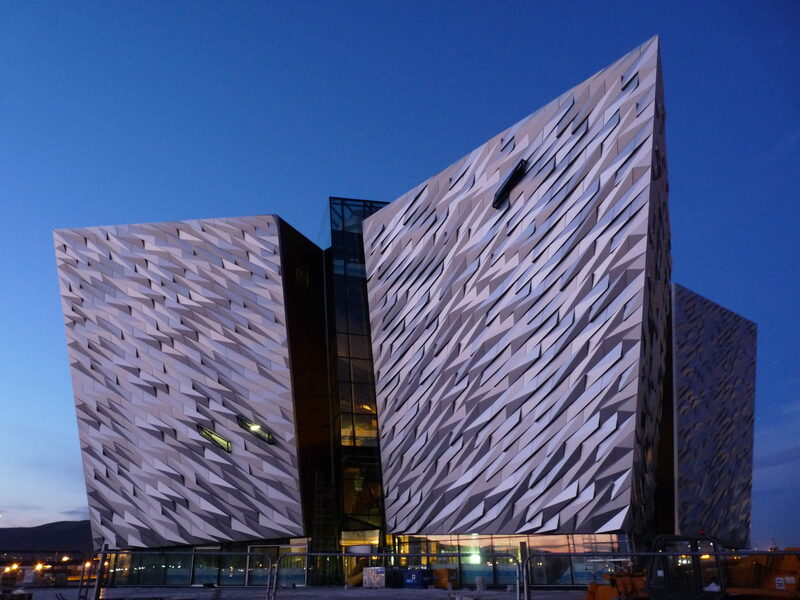 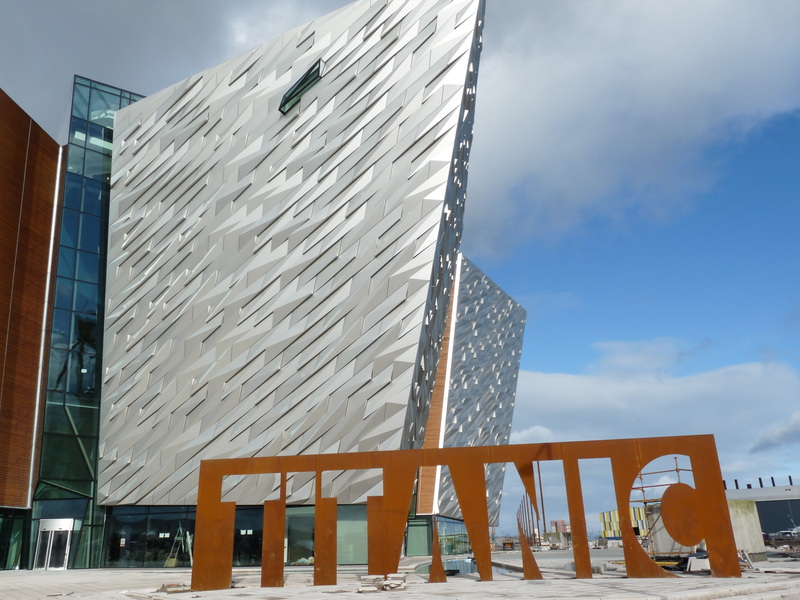 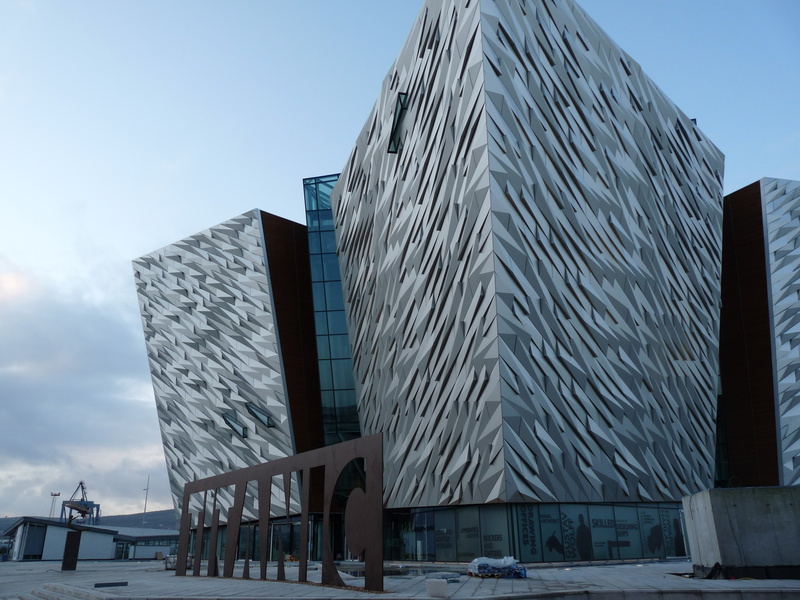 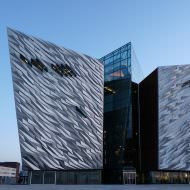 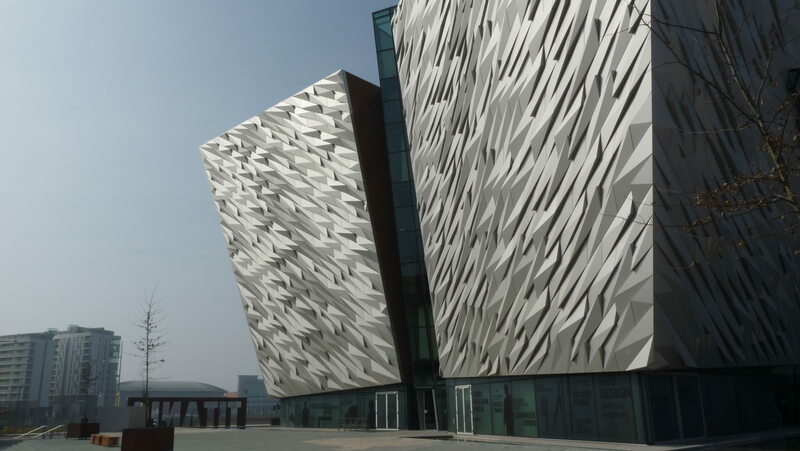 The Signature Building was named Titanic Belfast – a six storey building nine interpretive and interactive galleries that explore the story of Titanic and industrial Belfast. 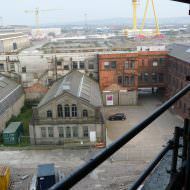 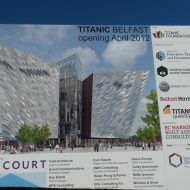 The building is owned and operated by Titanic Foundation Ltd (TFL). 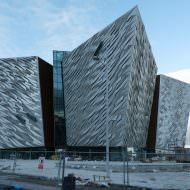 The total cost to construct Titanic Belfast was £76.9m (£97m including VAT and in kind contributions from Belfast Harbour Commissioners). 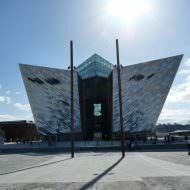 Funders included the Northern Ireland Executive (through DETI – £36.95m), Belfast City Council (£10m), Titanic Quarter Ltd (£16.35m) and Belfast Harbour Commissioners (£13.6m). 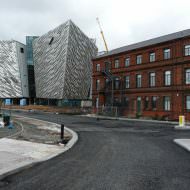 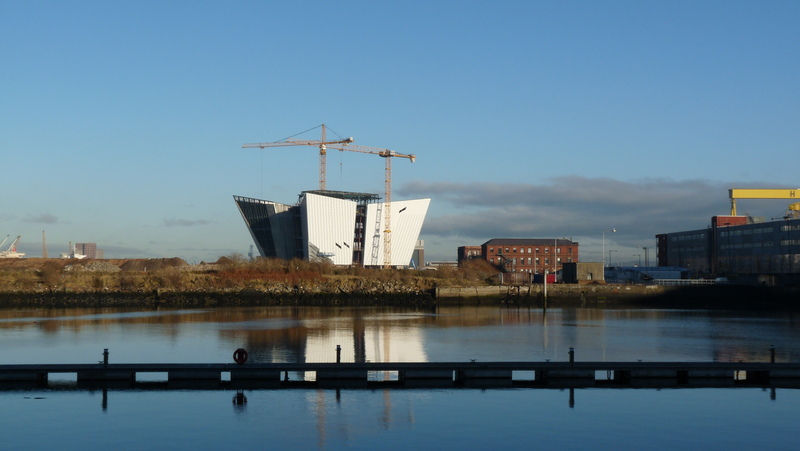 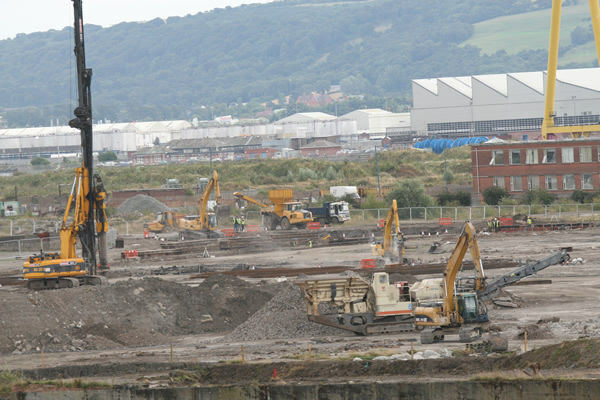 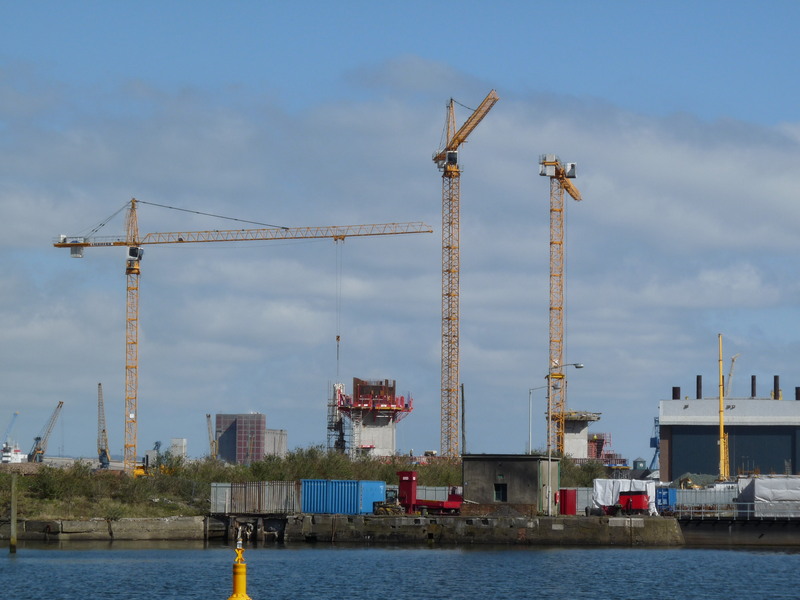 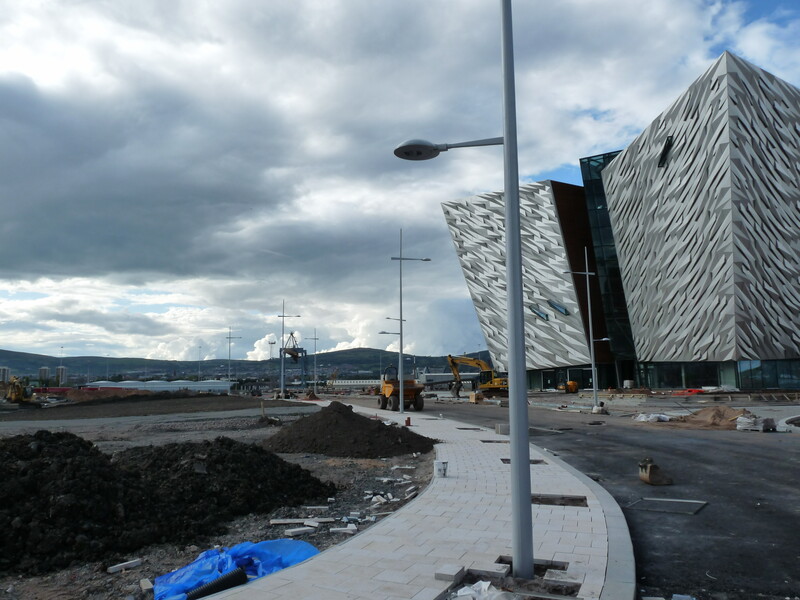 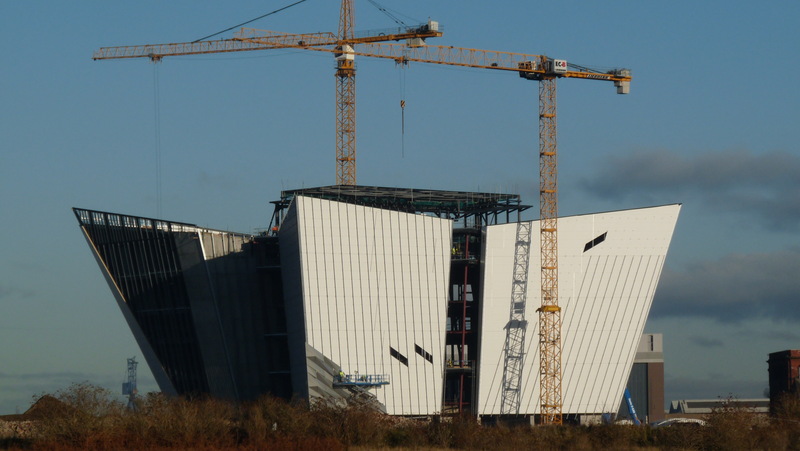 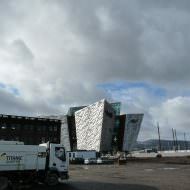 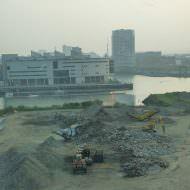 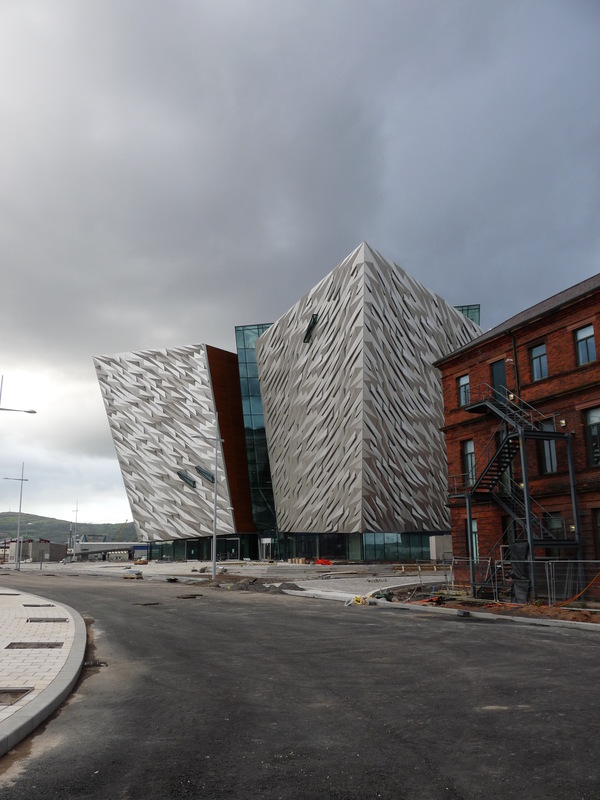 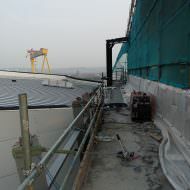 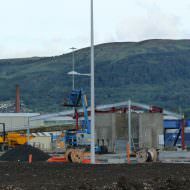 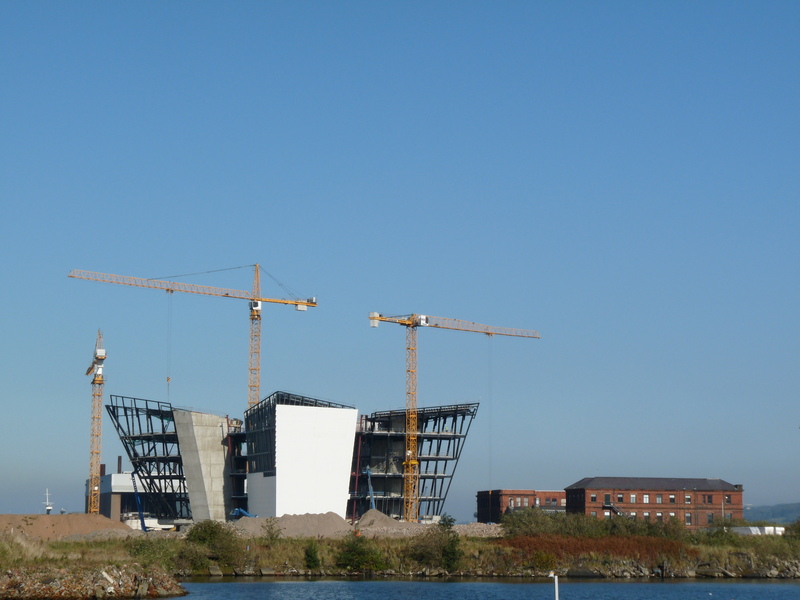 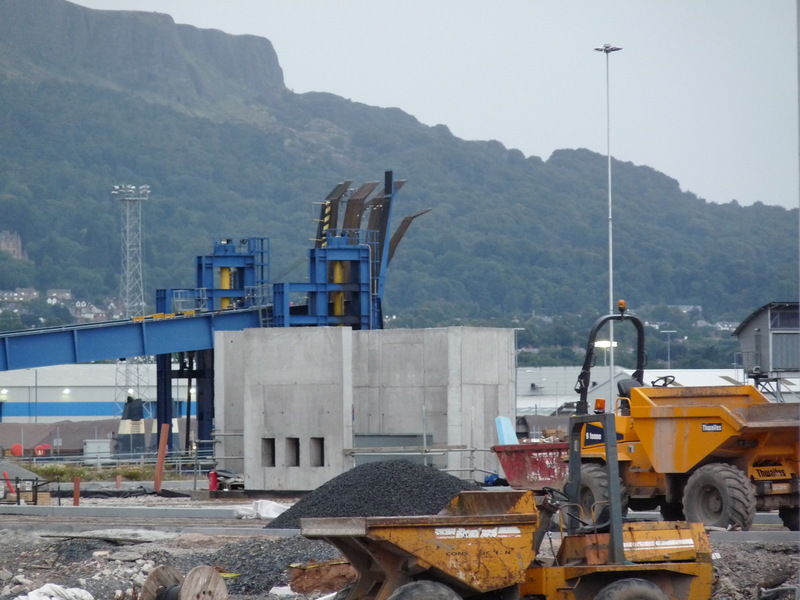 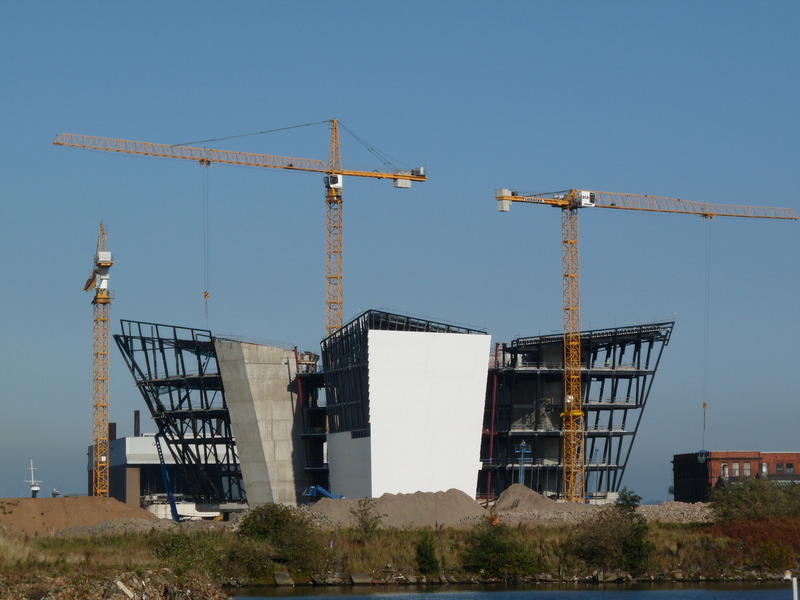 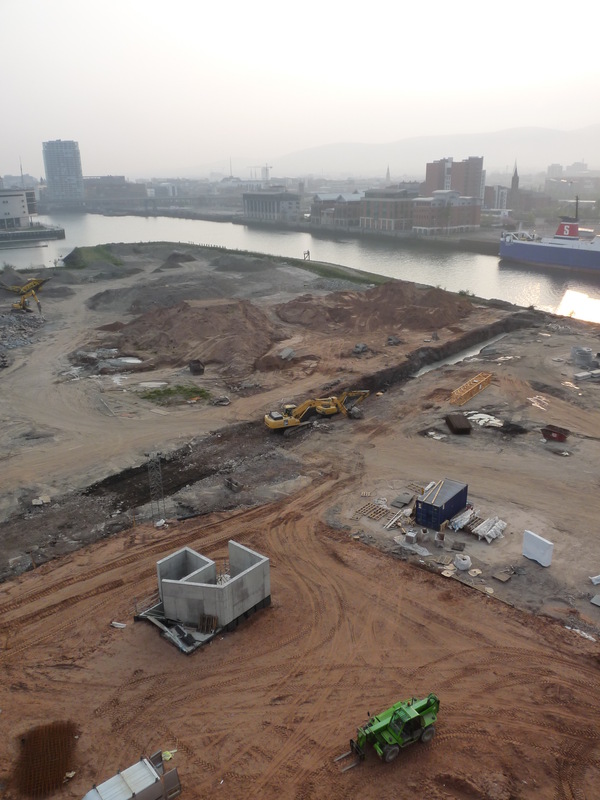 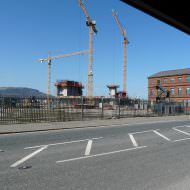 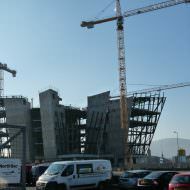 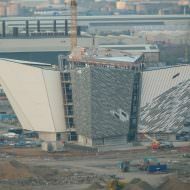 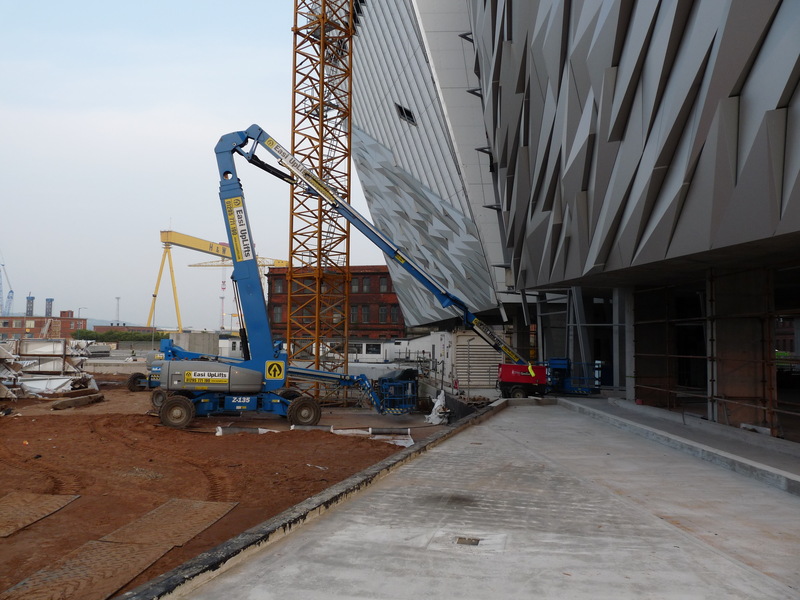 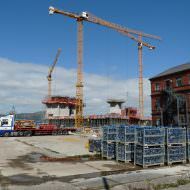 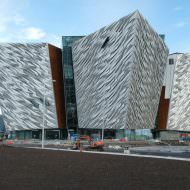 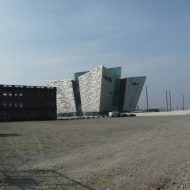 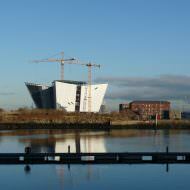 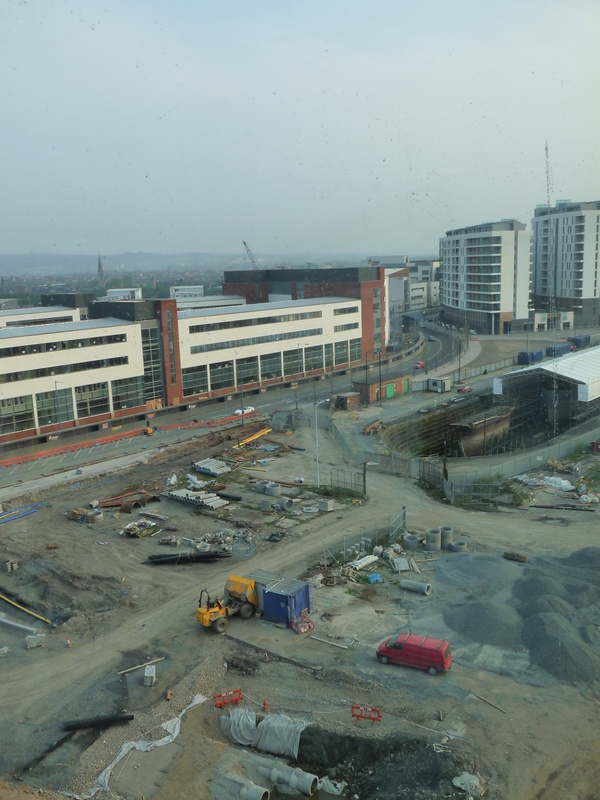 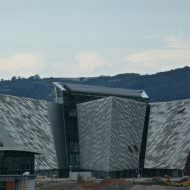 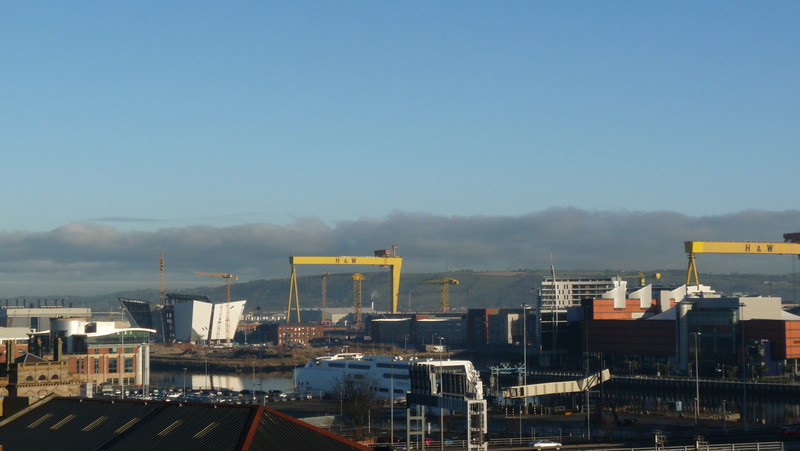 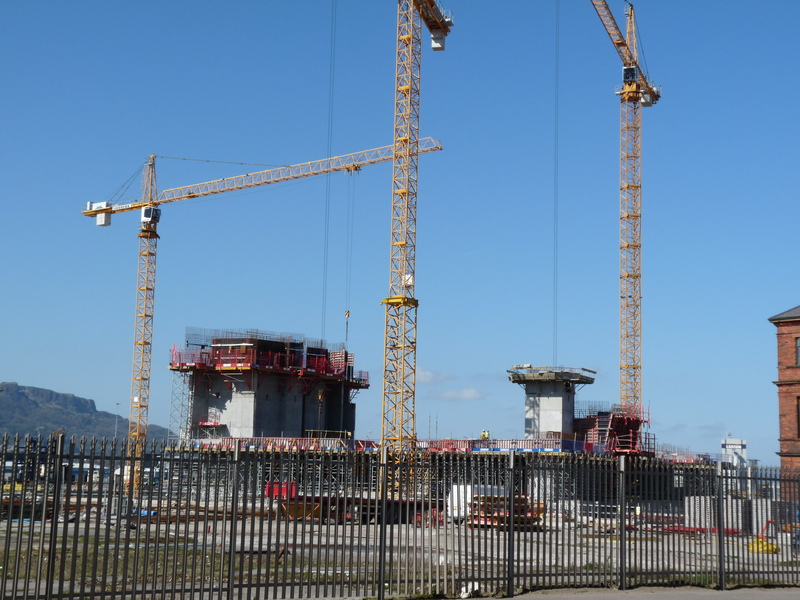 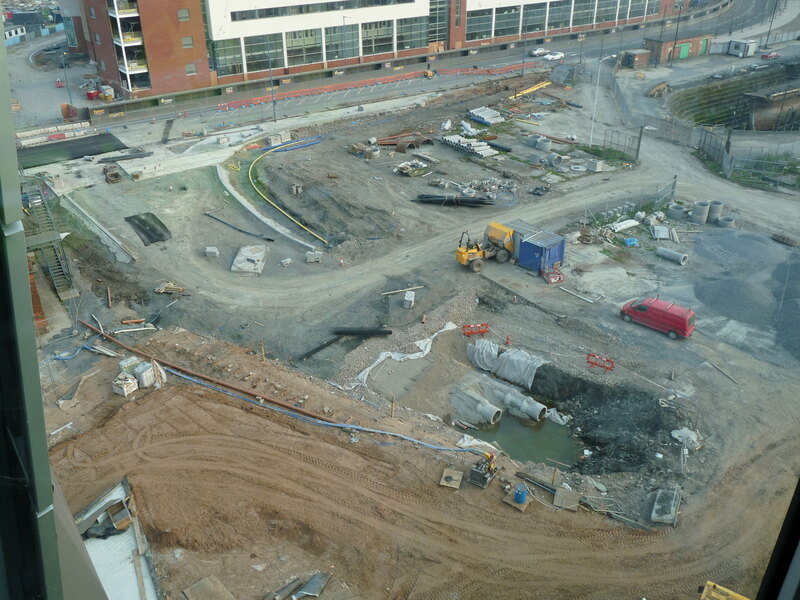 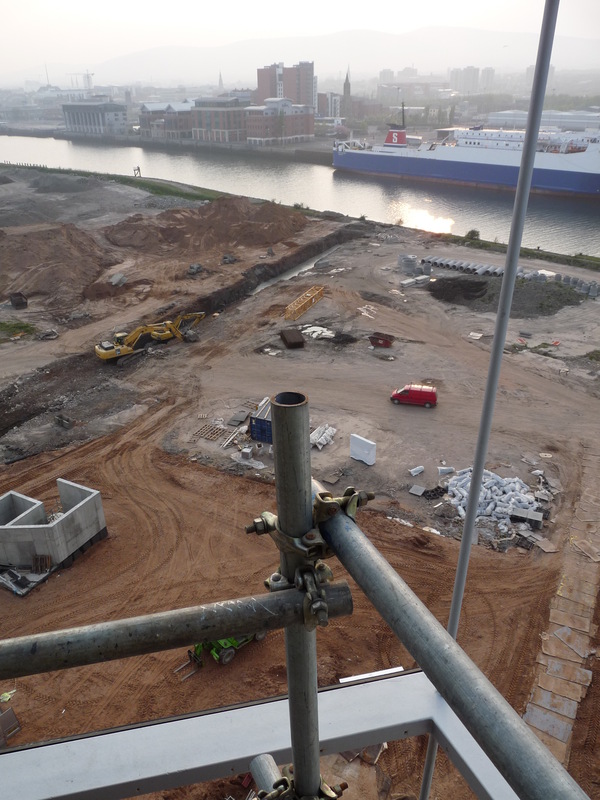 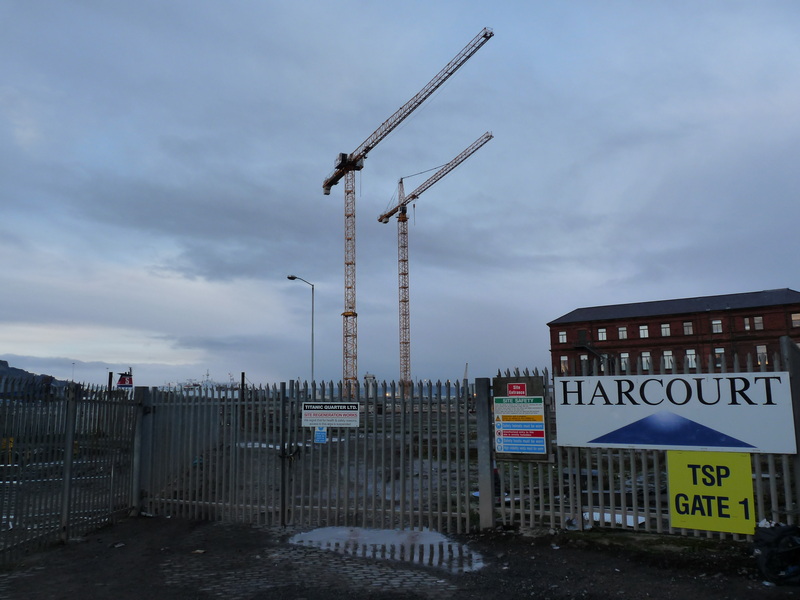 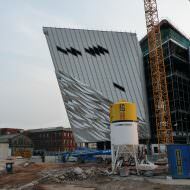 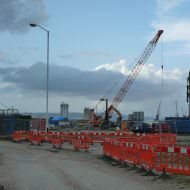 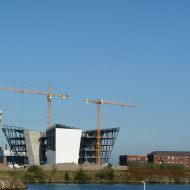 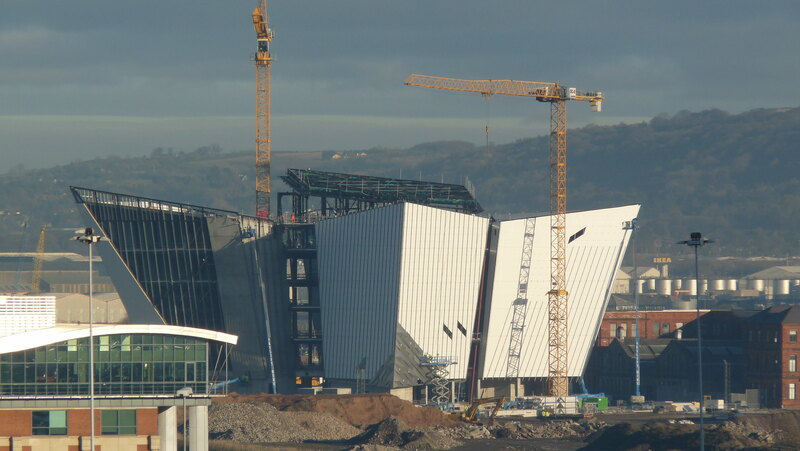 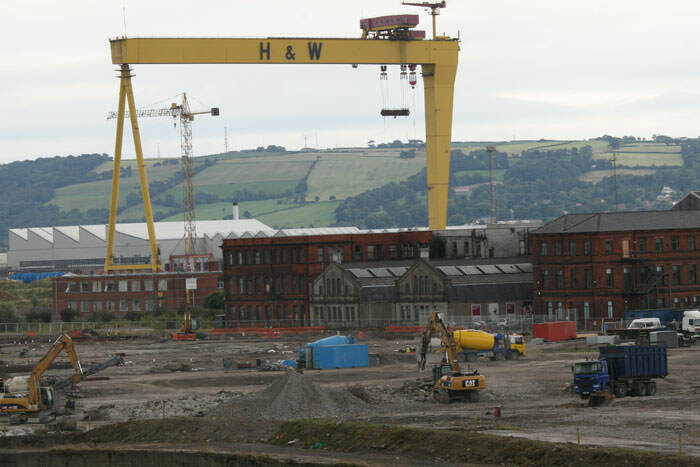 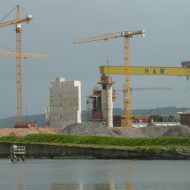 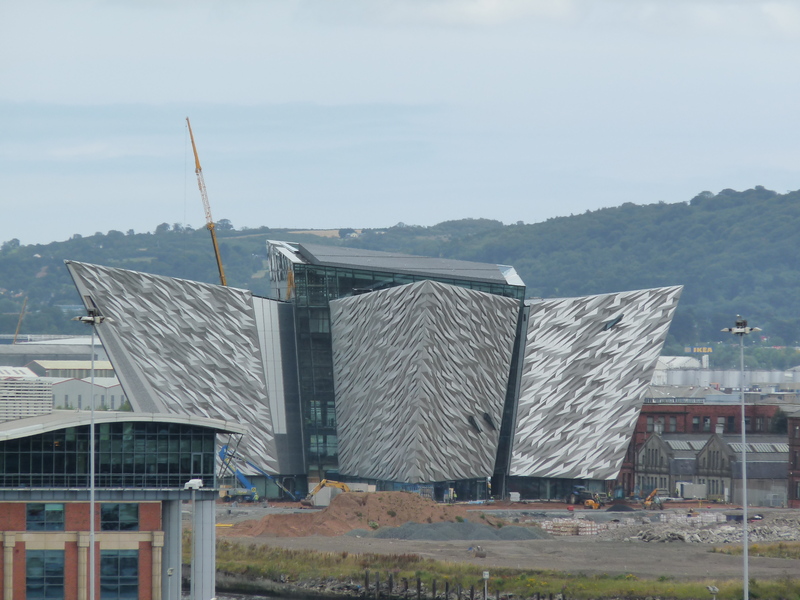 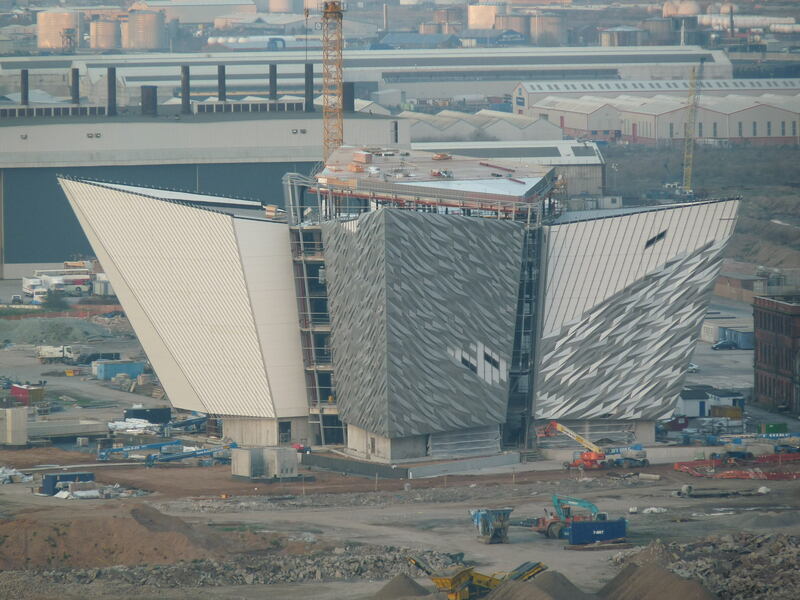 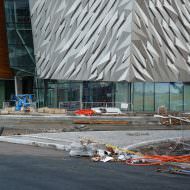 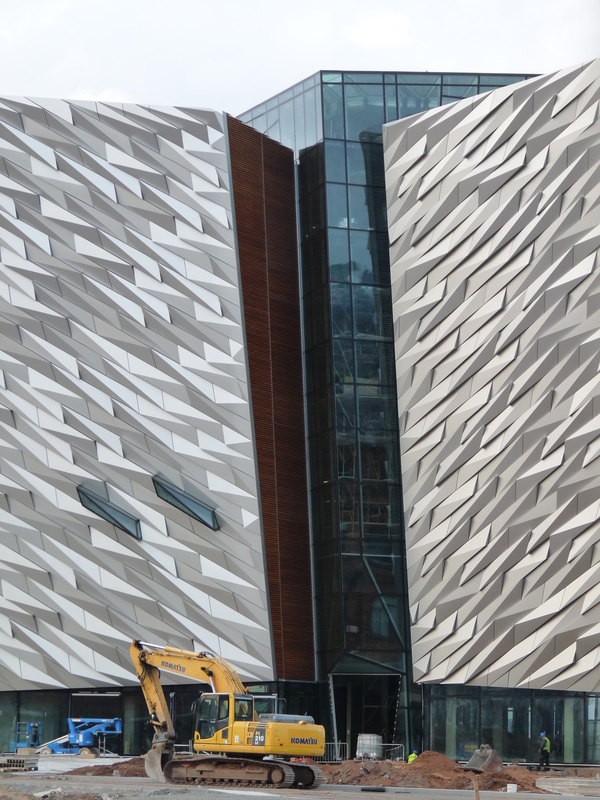 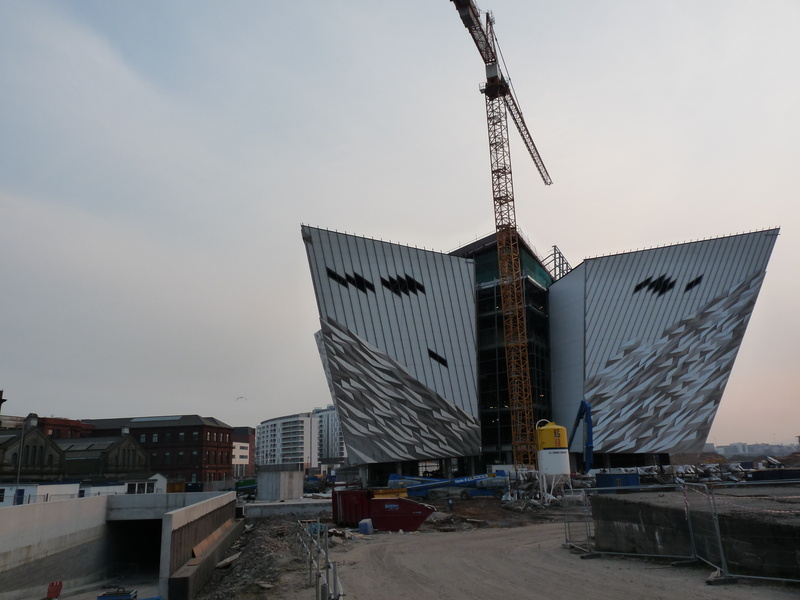 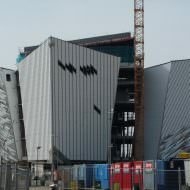 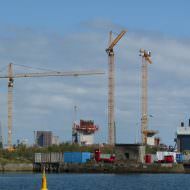 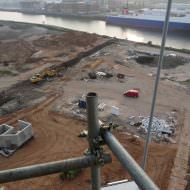 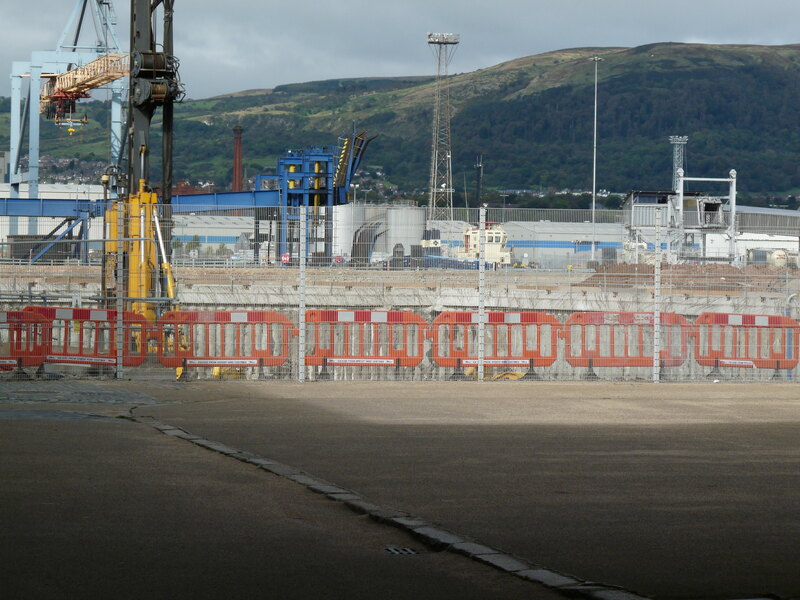 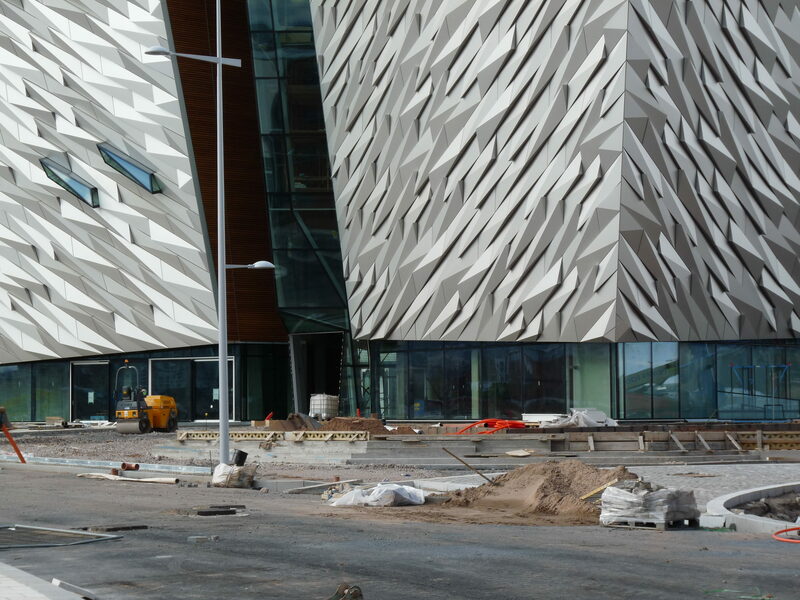 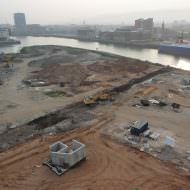 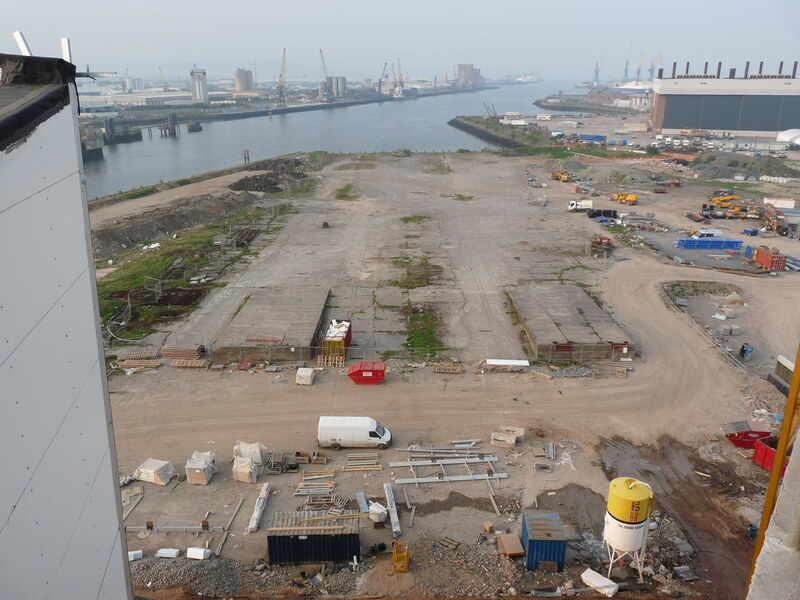 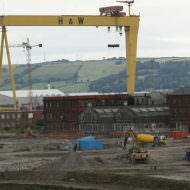 Titanic Quarter Ltd and Harcourt Construction (NI) Ltd began construction in May 2009 a number of months before the final financial arrangements were confirmed for the project. 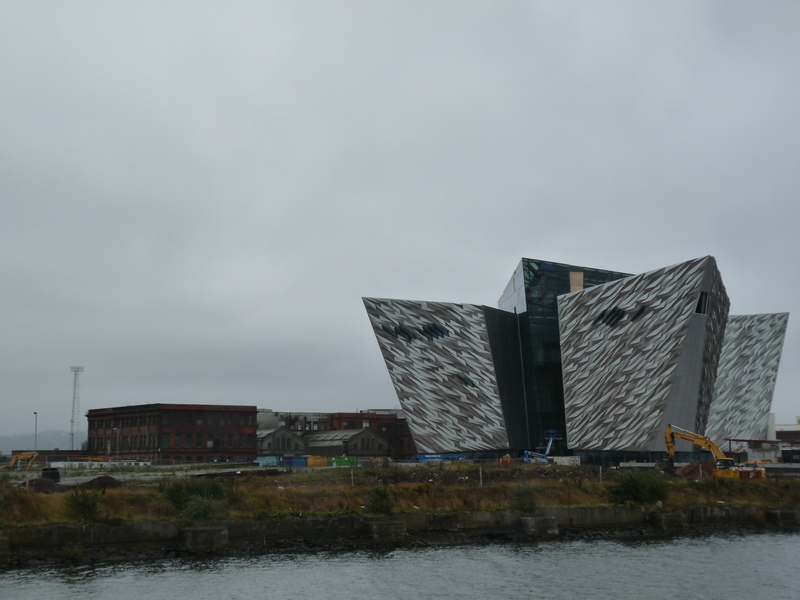 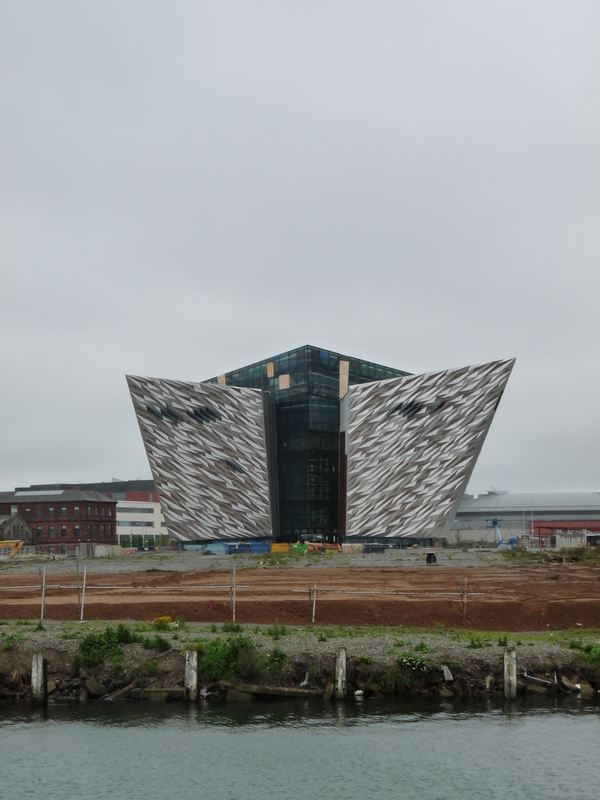 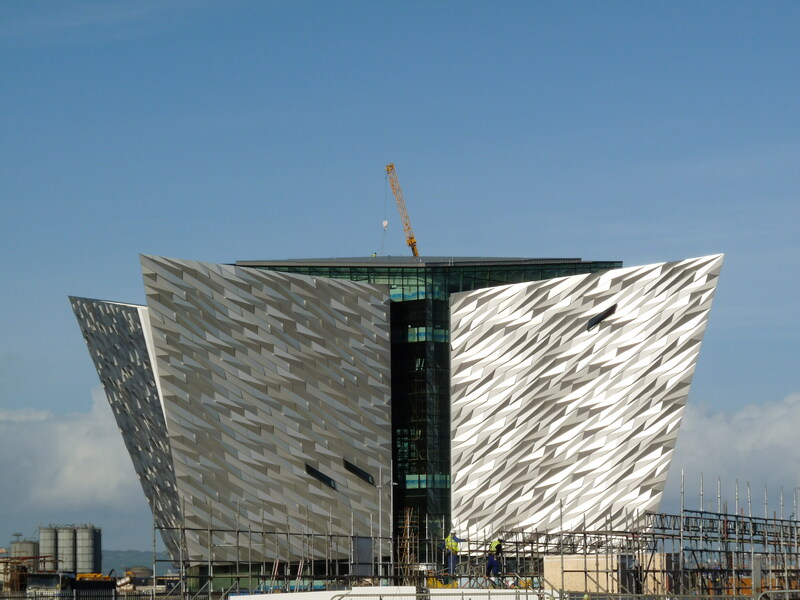 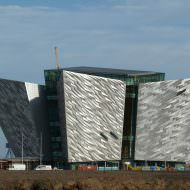 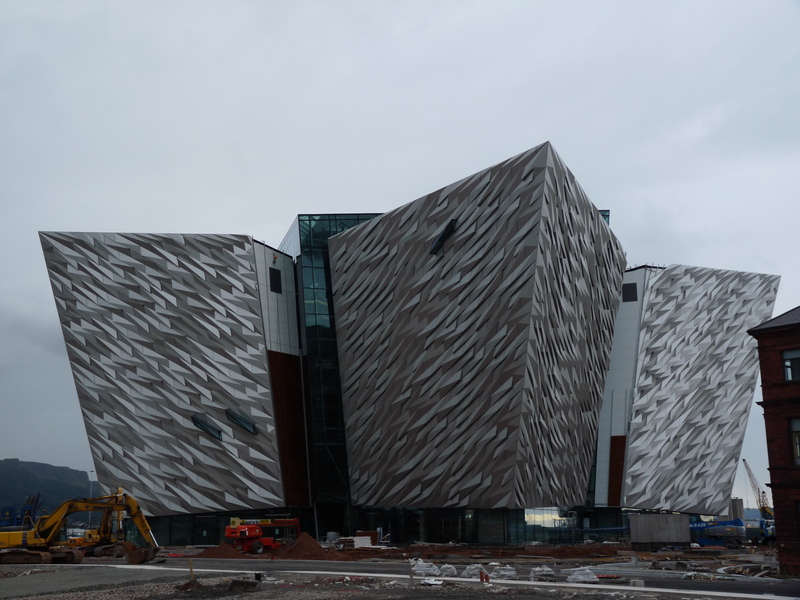 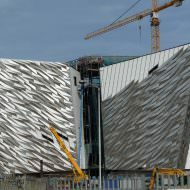 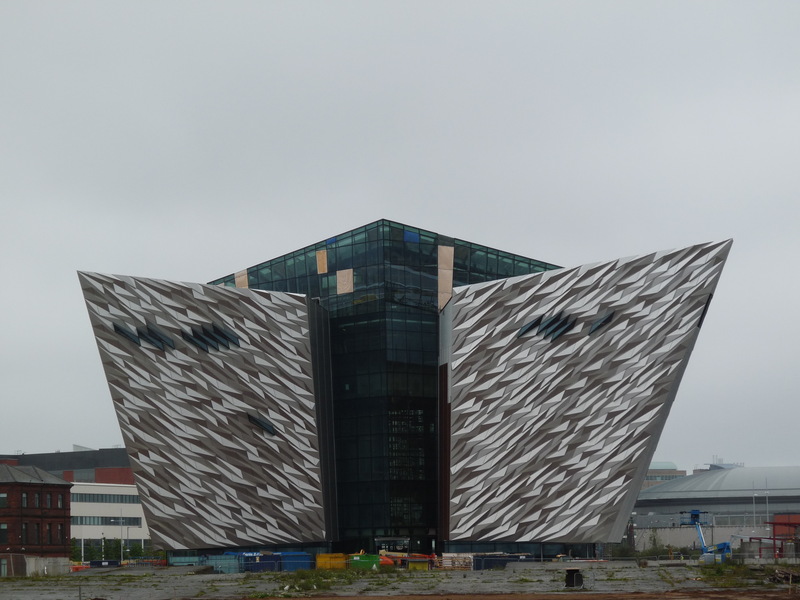 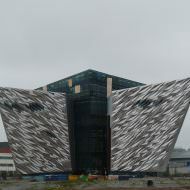 It was not until a meeting of the Northern Ireland Executive on 1st October 2009 that the Executive agreed to contribute £43.5m to the construction of Titanic Belfast. 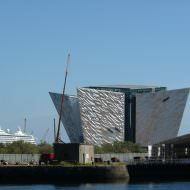 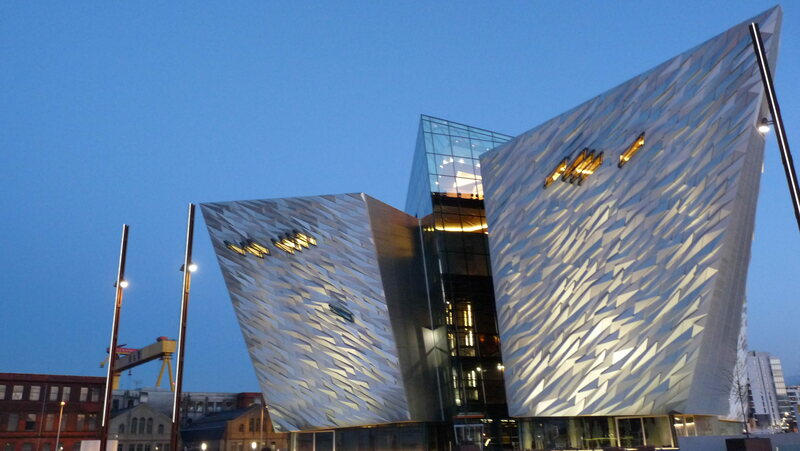 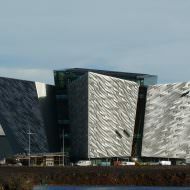 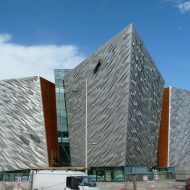 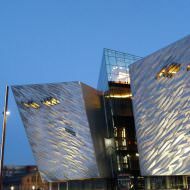 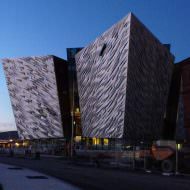 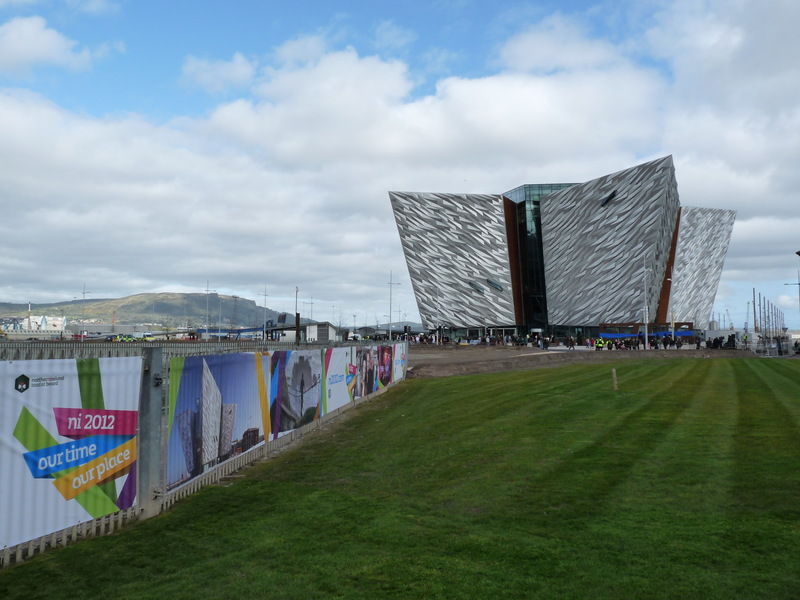 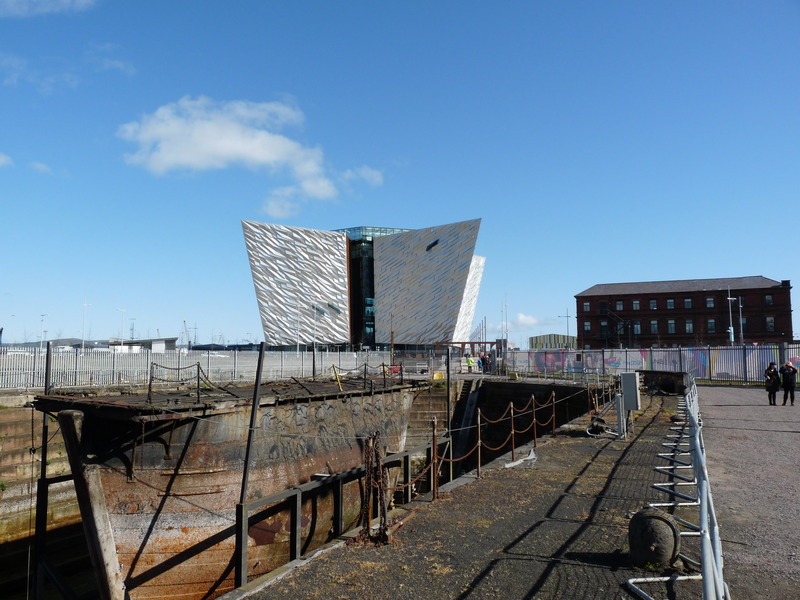 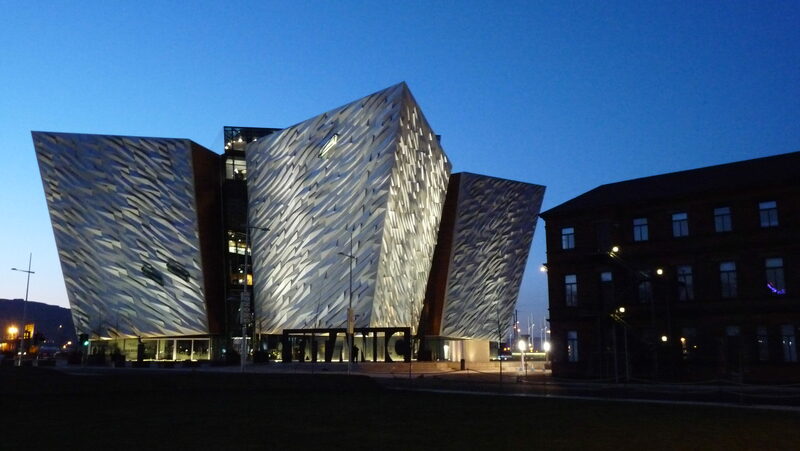 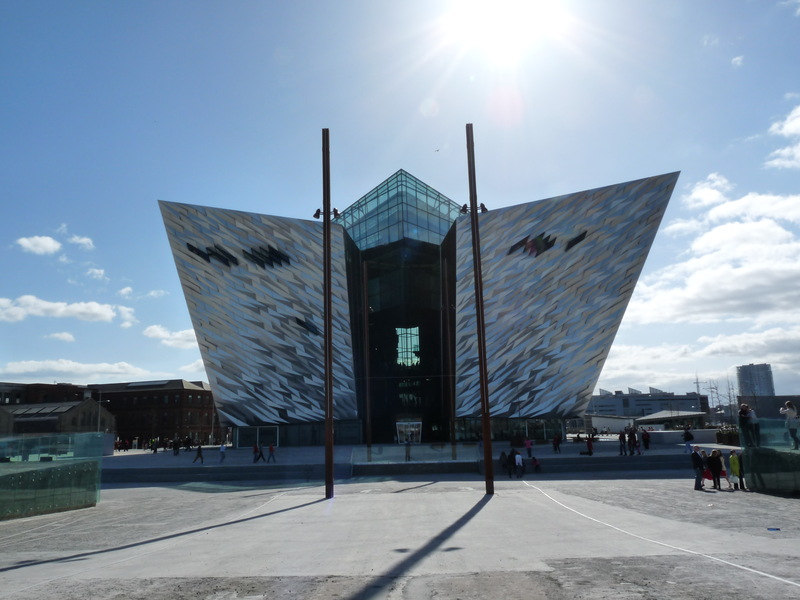 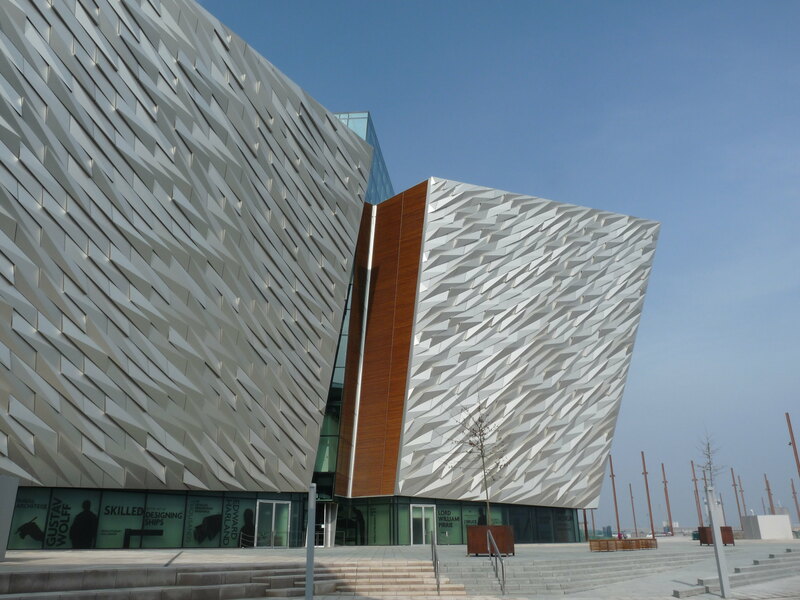 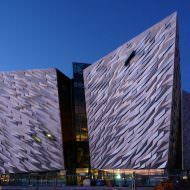 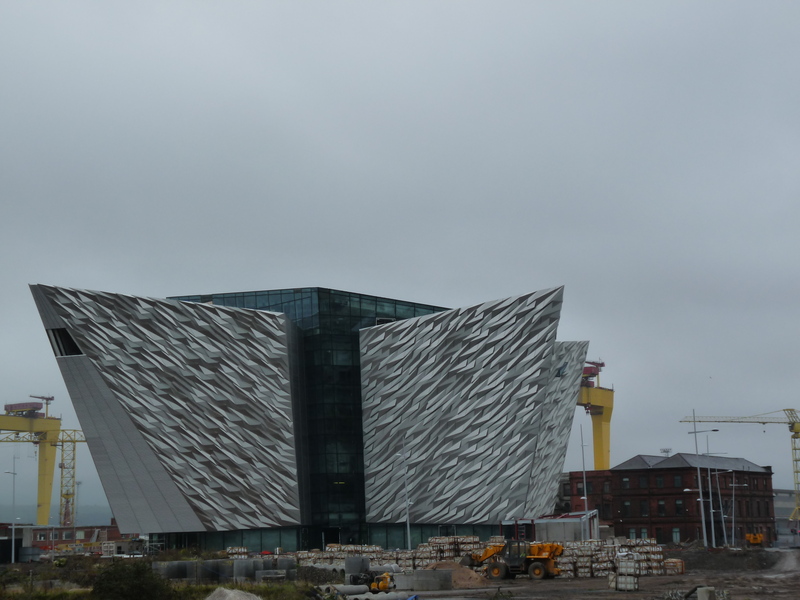 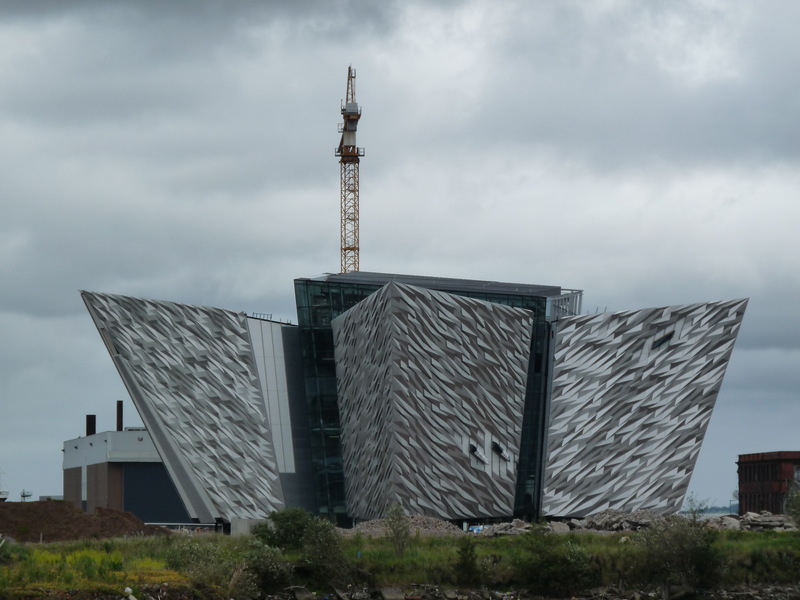 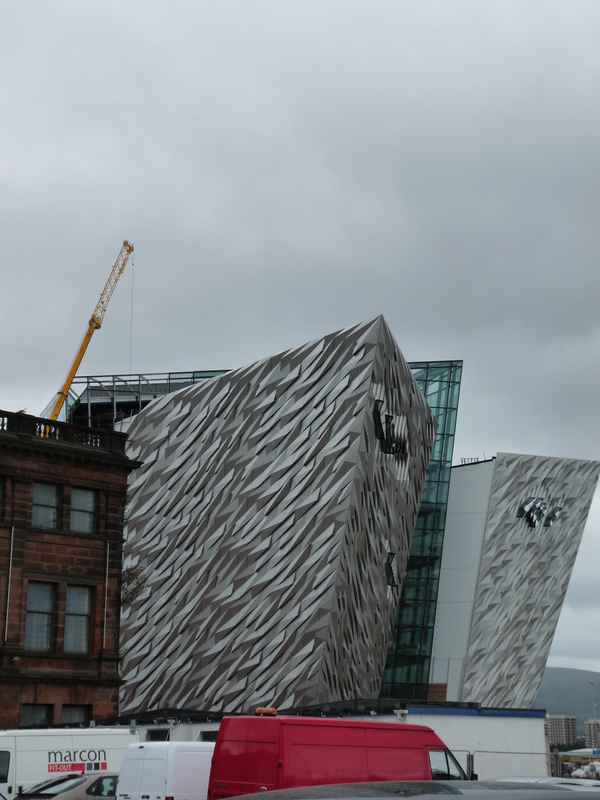 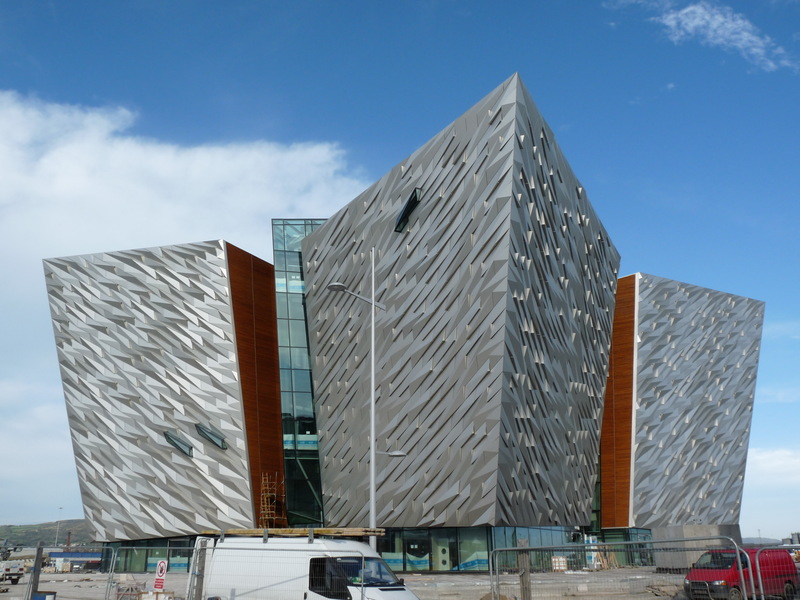 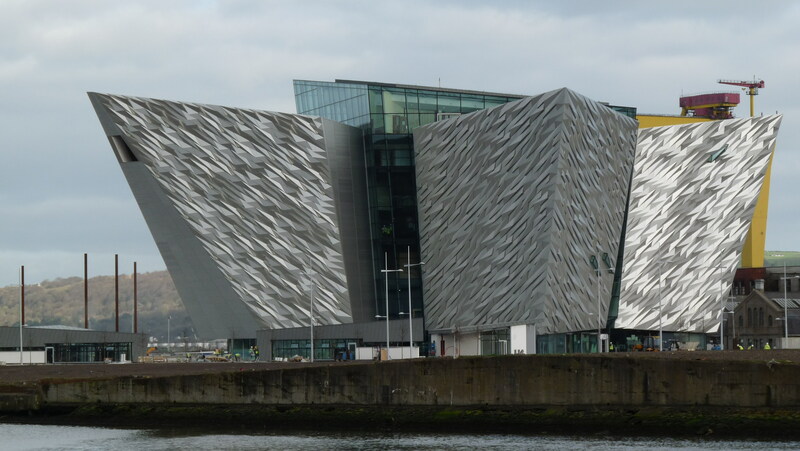 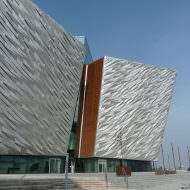 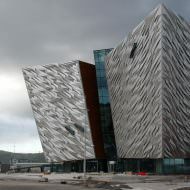 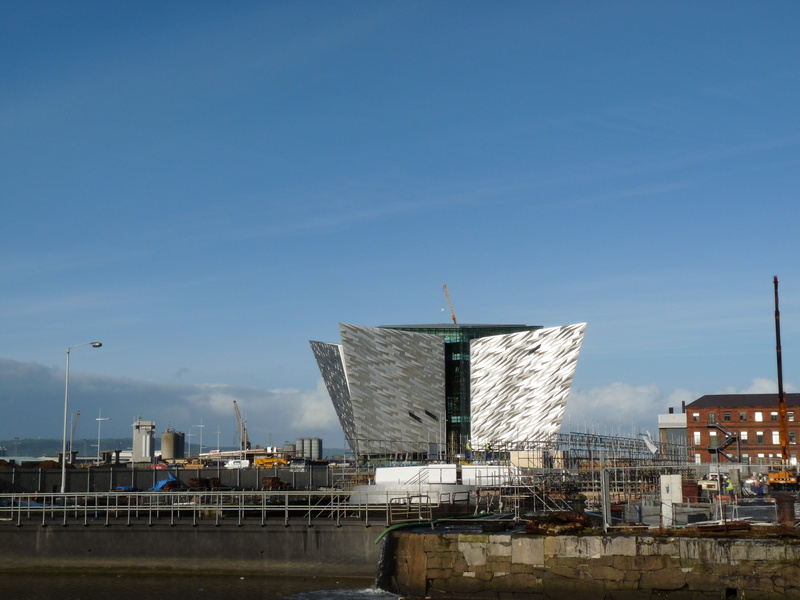 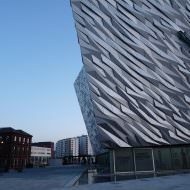 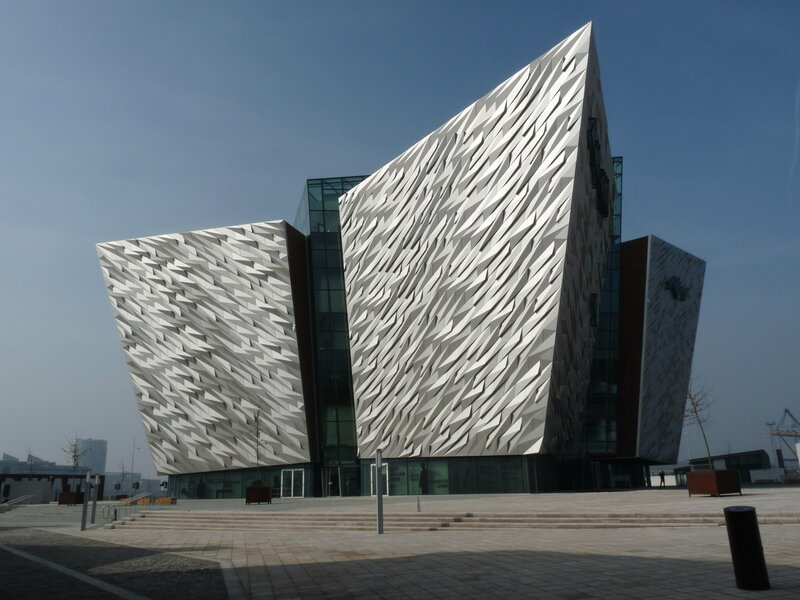 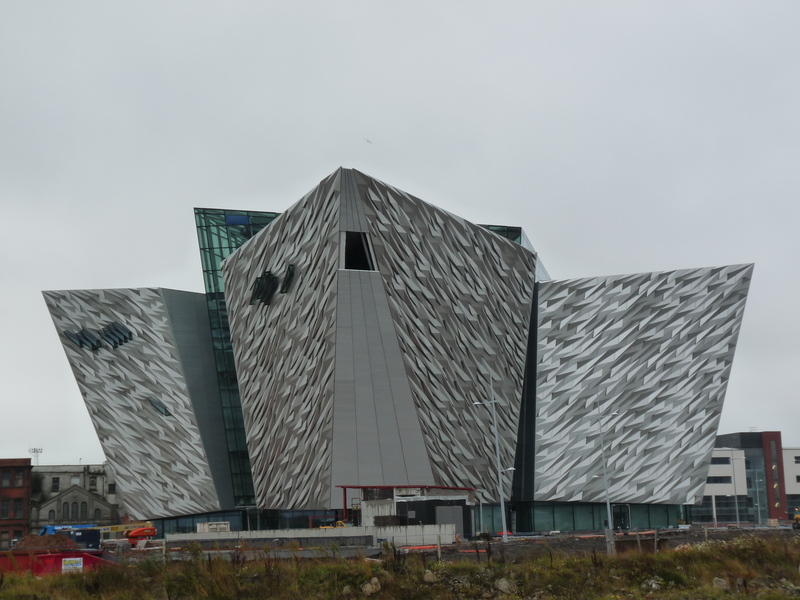 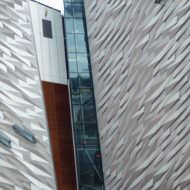 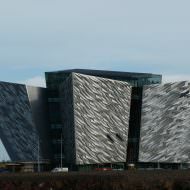 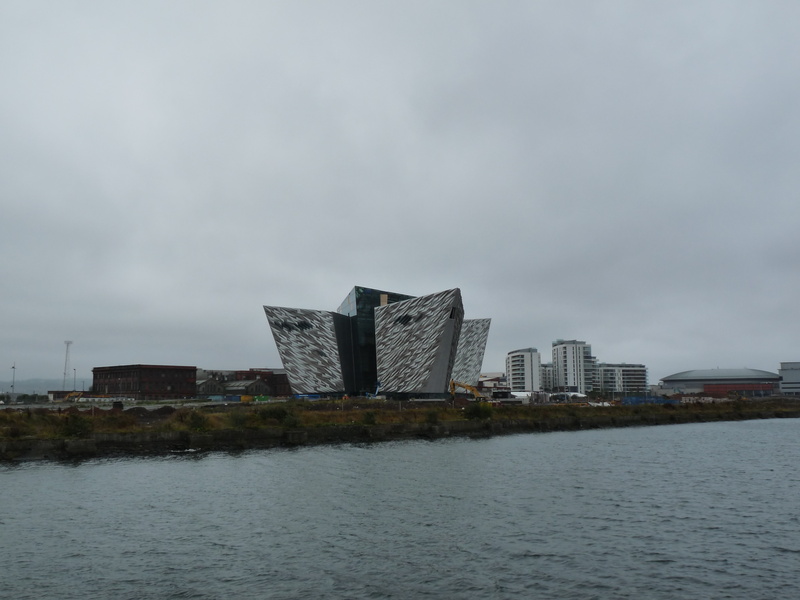 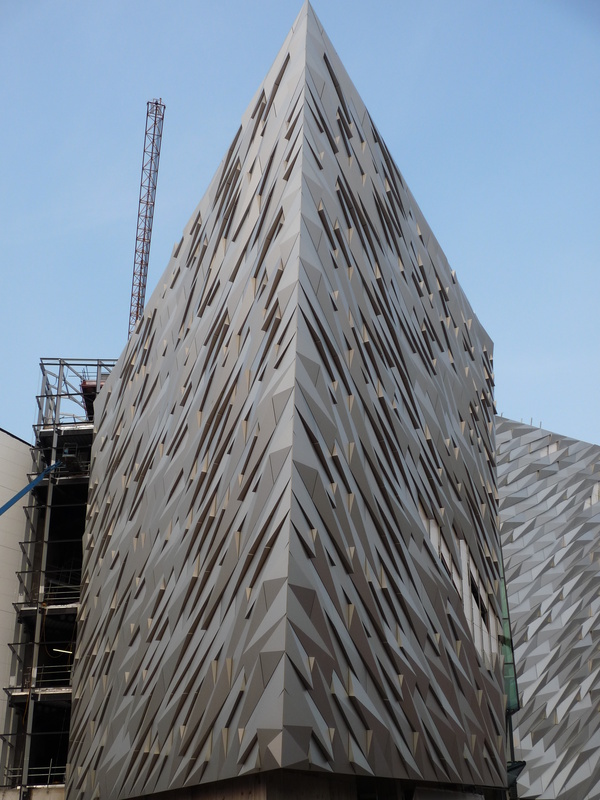 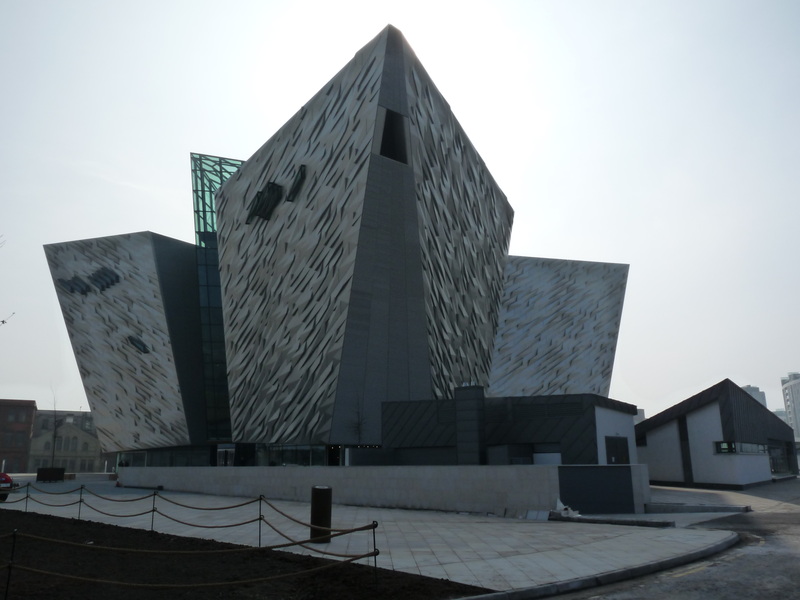 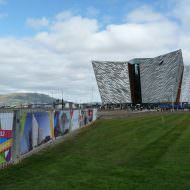 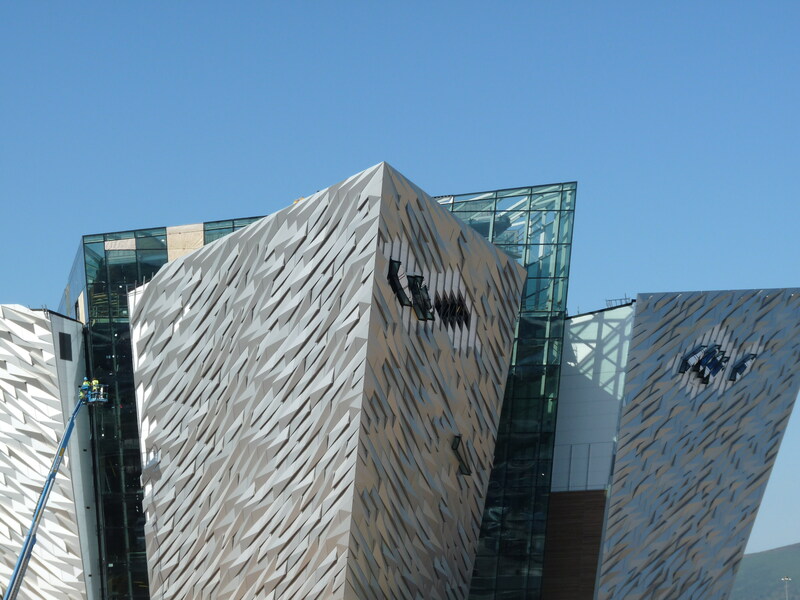 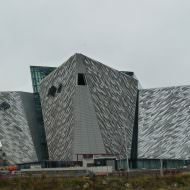 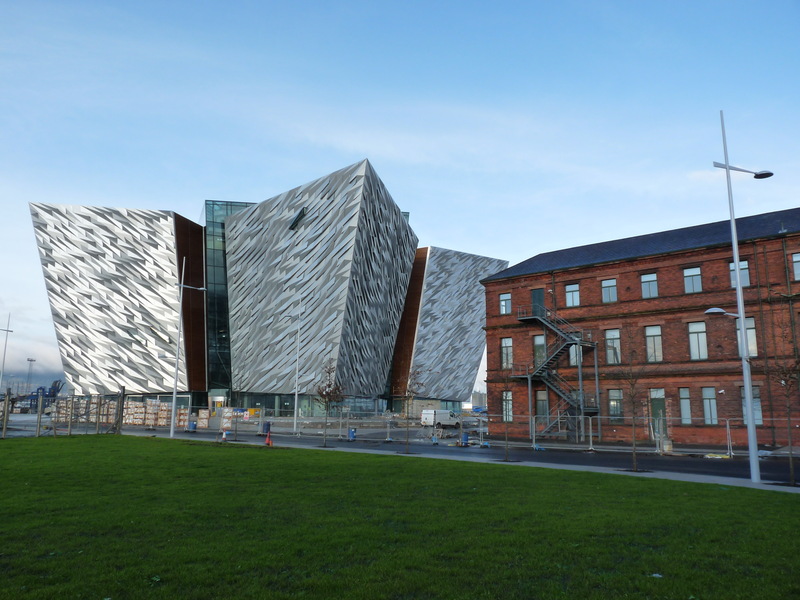 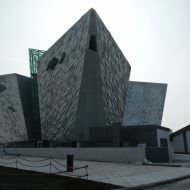 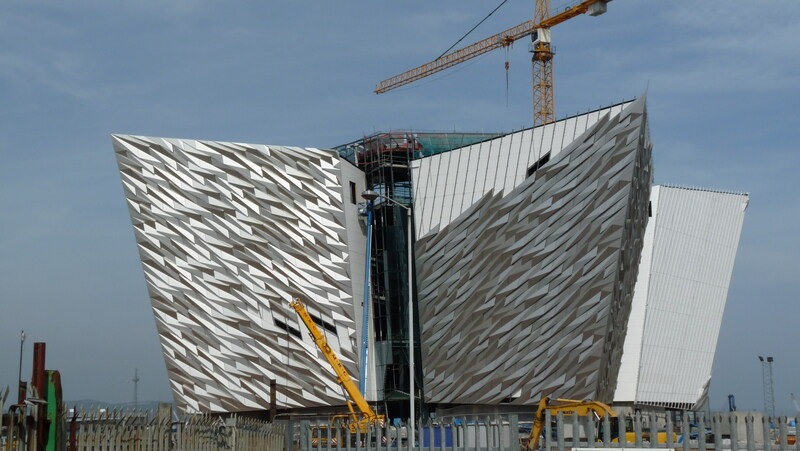 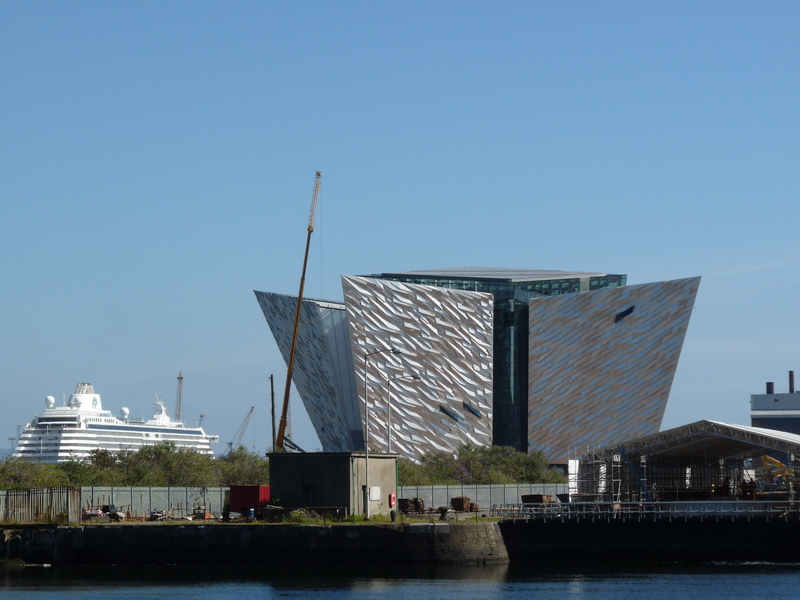 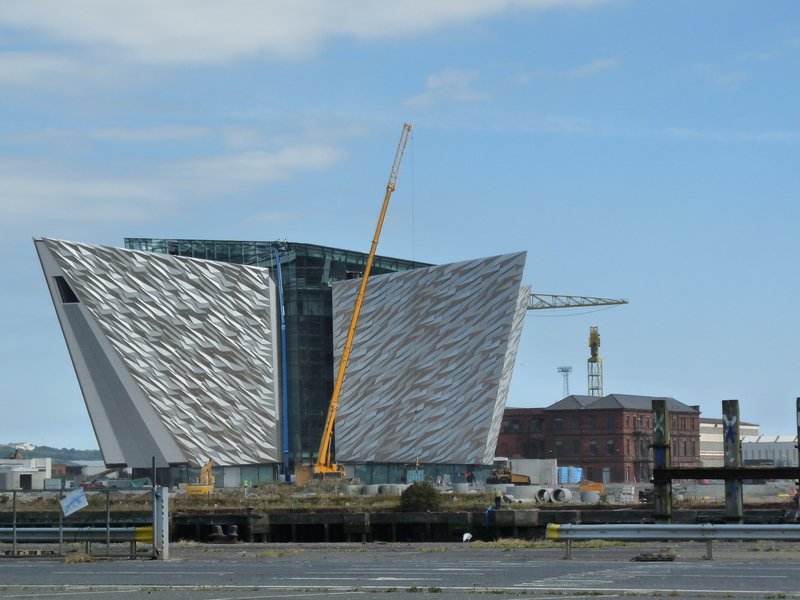 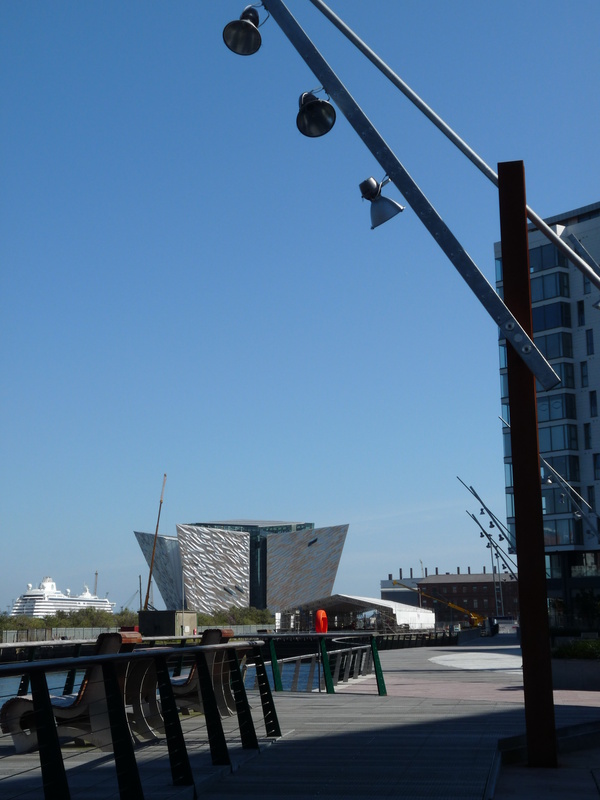 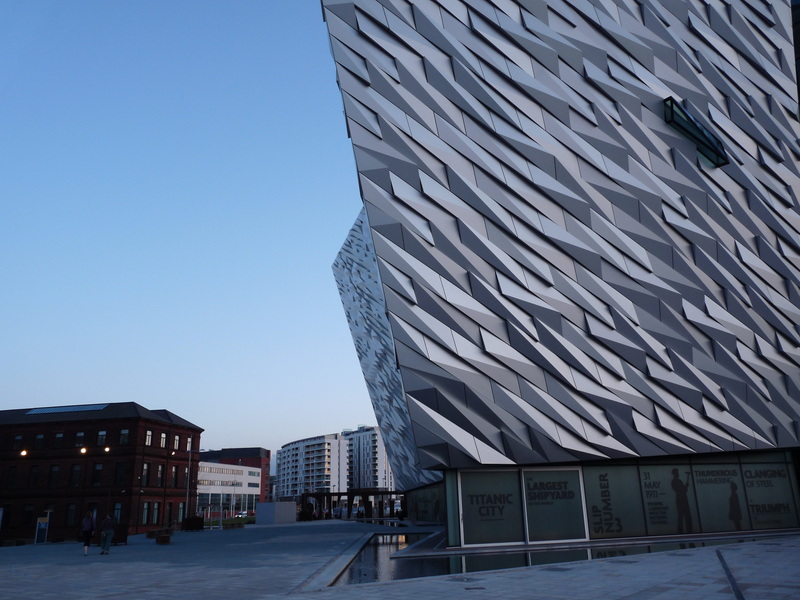 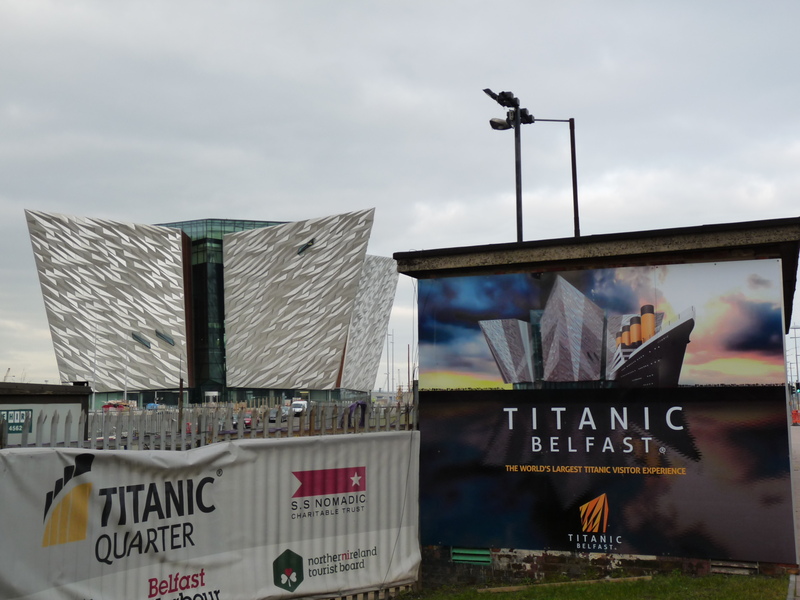 During December 2011 the Northern Ireland Audit Office released a report which raised concerns over the financial viability of Titanic Belfast as a visitor attraction. 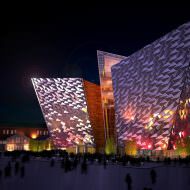 The report was doubtful that the attraction would break even in the long term and estimated that the building would require 290,000 visitors a year to break even. 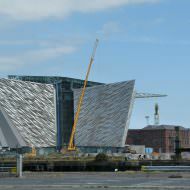 The report accepted that initial interest would ensure this number was fulfilled but questioned the long term visitor projections. 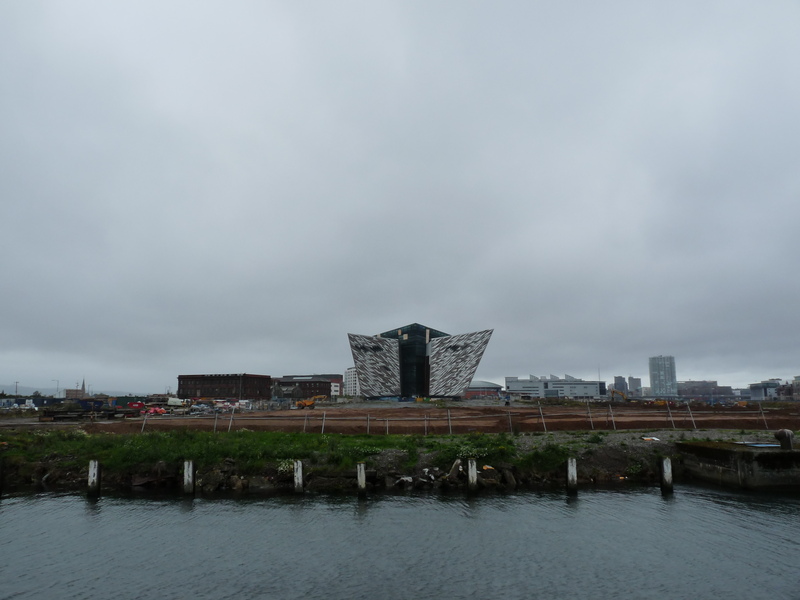 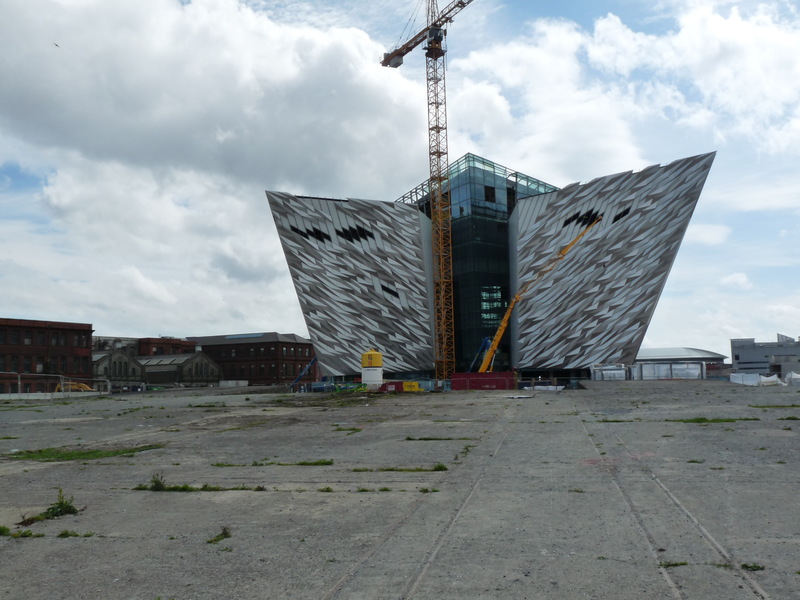 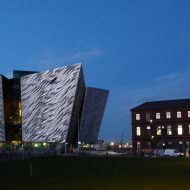 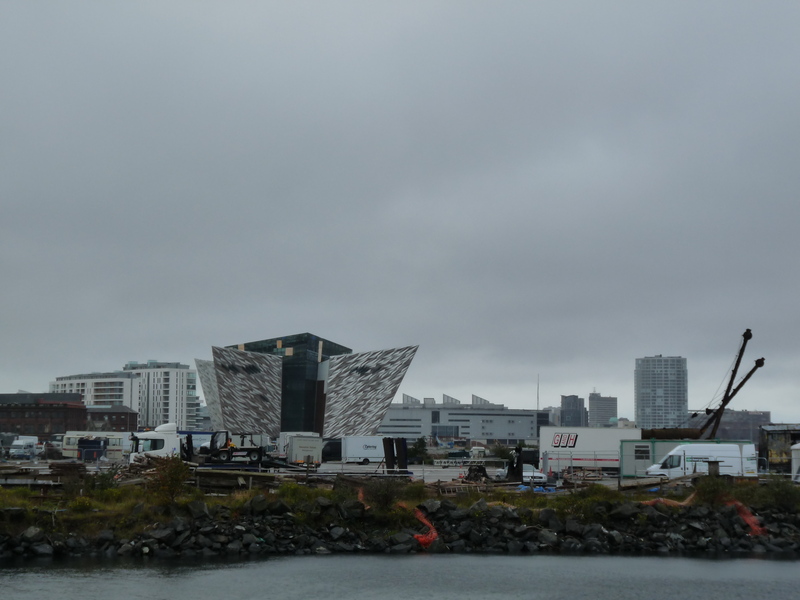 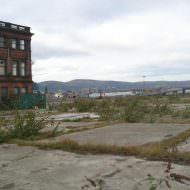 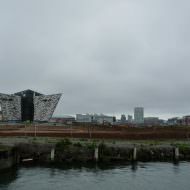 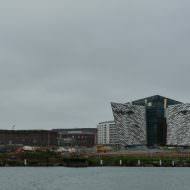 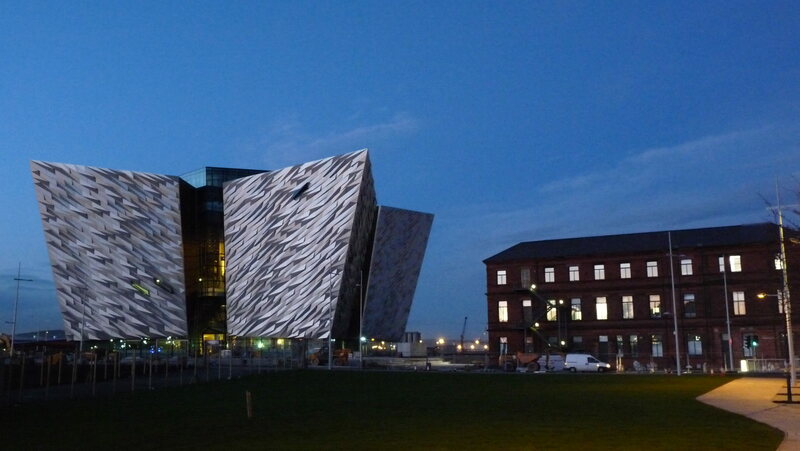 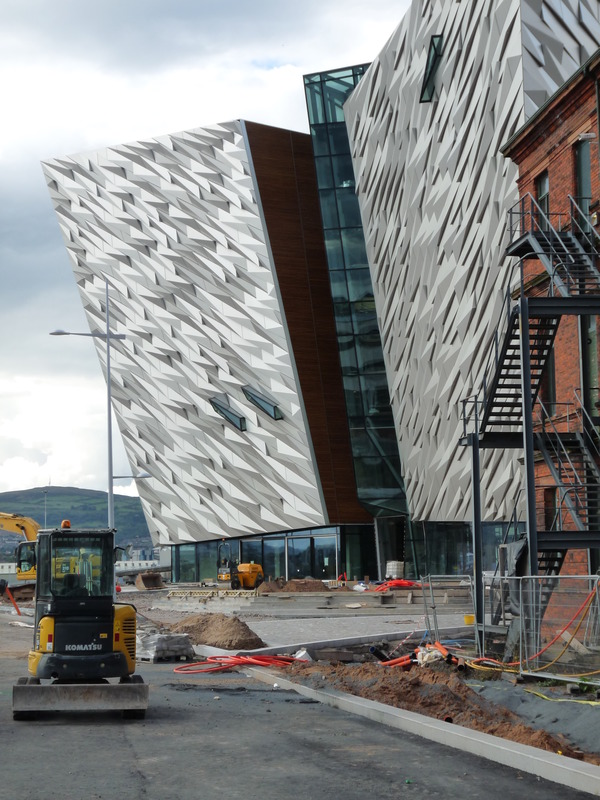 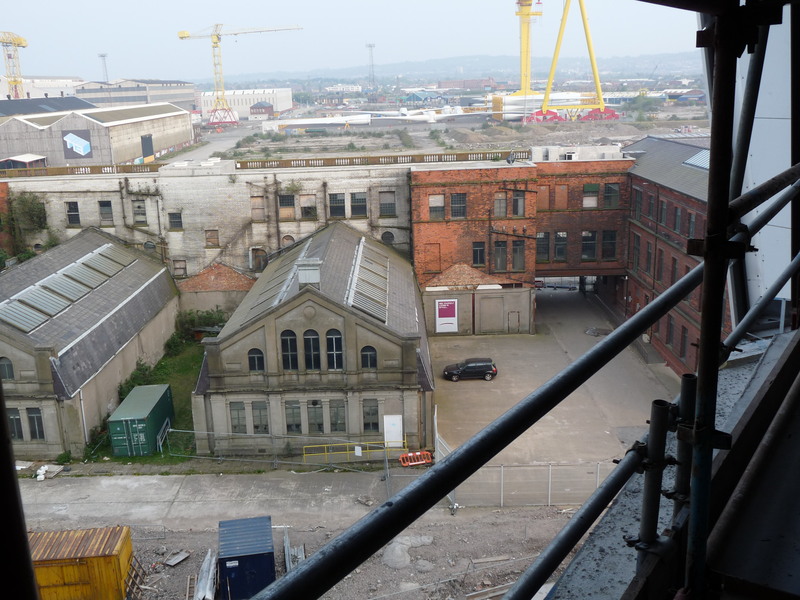 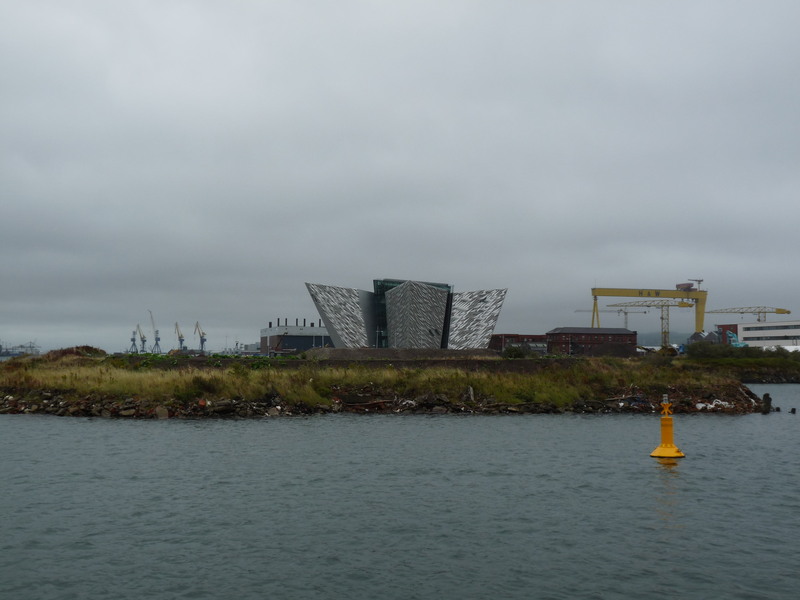 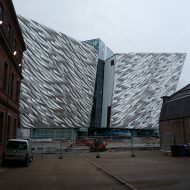 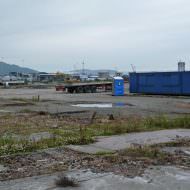 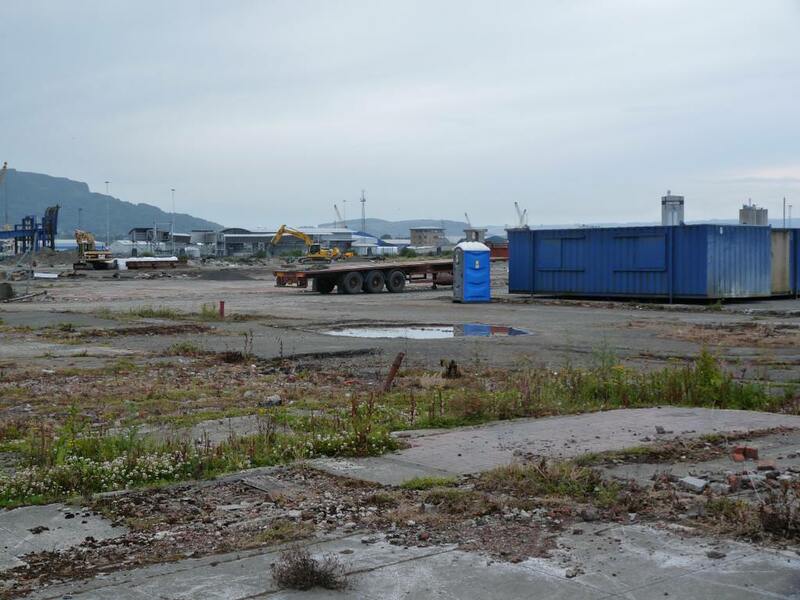 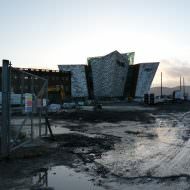 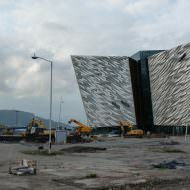 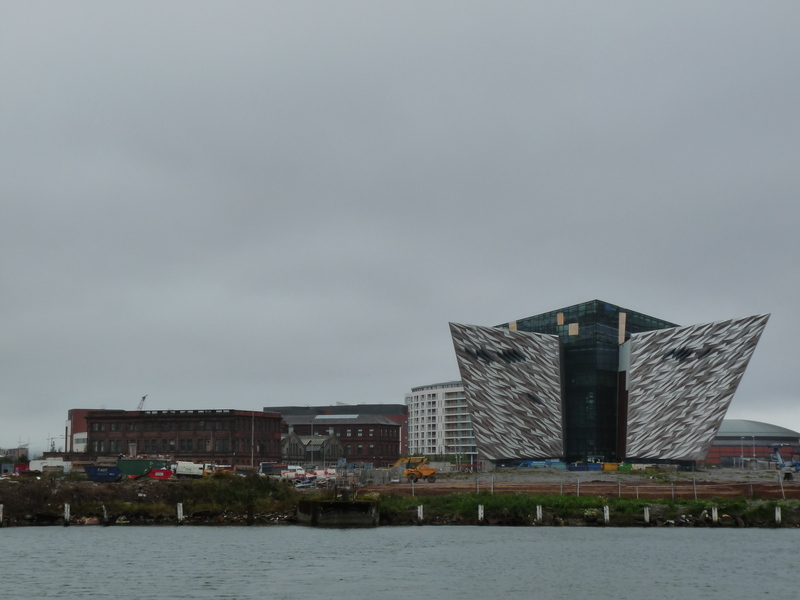 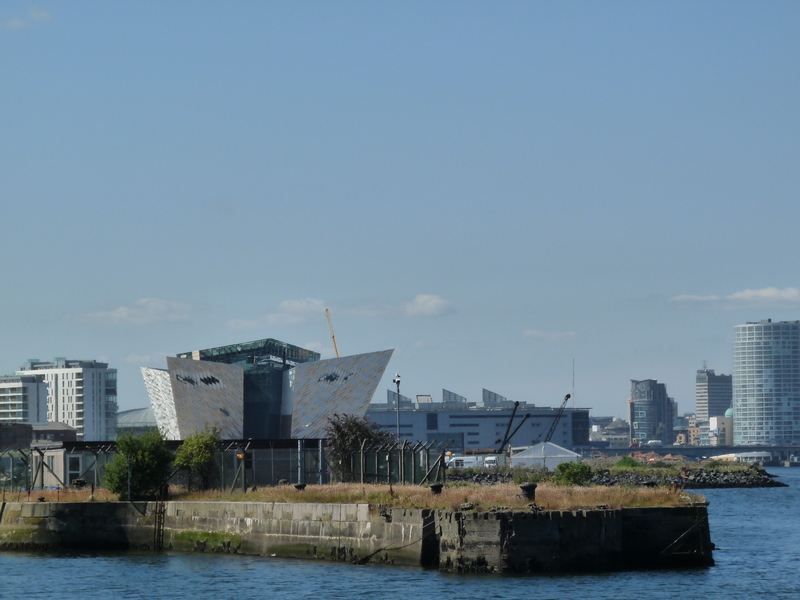 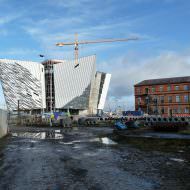 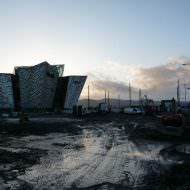 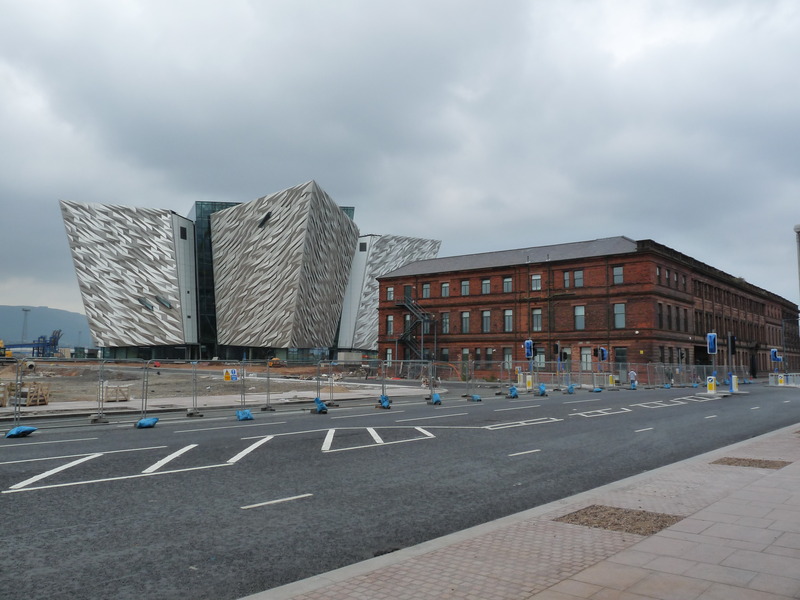 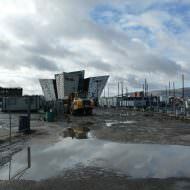 The report acknowledged that in the first seven years the developer – Titanic Quarter Limited – would underwrite any losses. 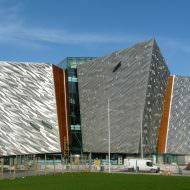 Titanic Belfast has since attracted more than 650,000 visitors in the 9 months since opening in March 31, 2012 to the end of 2012. 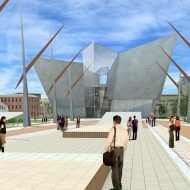 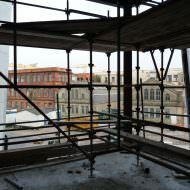 The same report led to media reports that the project faced a funding shortfall. 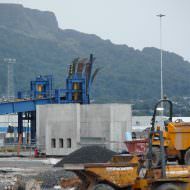 The Department of Enterprise, Trade and Investment responded by issuing a press release to confirm that the project was fully funded. 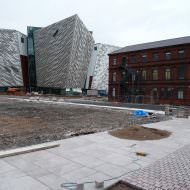 The Department explained that it had applied for £18.4million of funding under the European Commission (EC) Competitiveness Programme, which at the time of the media reports was still subject to an assessment by the Commission. 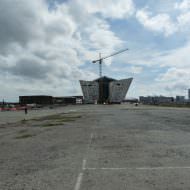 In 2013 it was suggested that this money would not be forthcoming and it has been suggested this is due to Titanic Quarter, without competition, appointing an associated company, Harcourt Construction (NI) Limited, to construct the building. 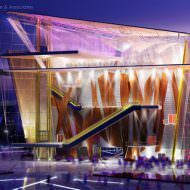 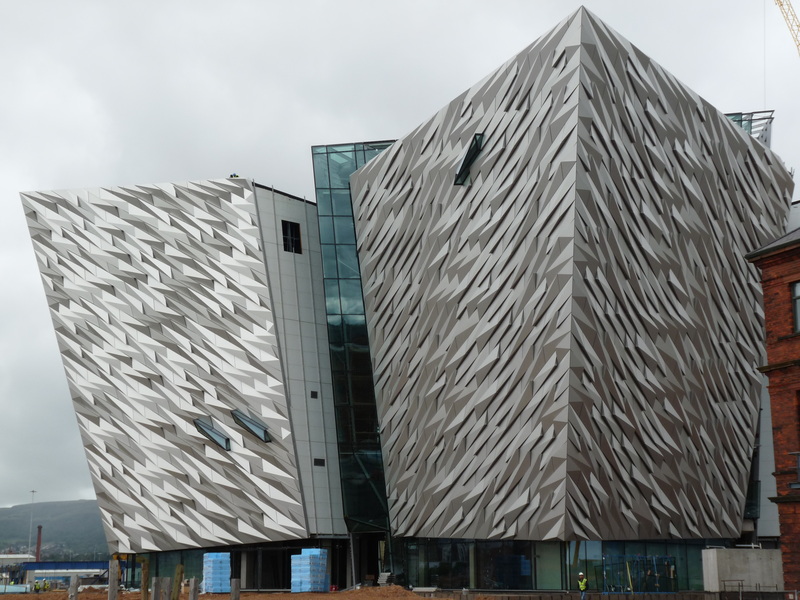 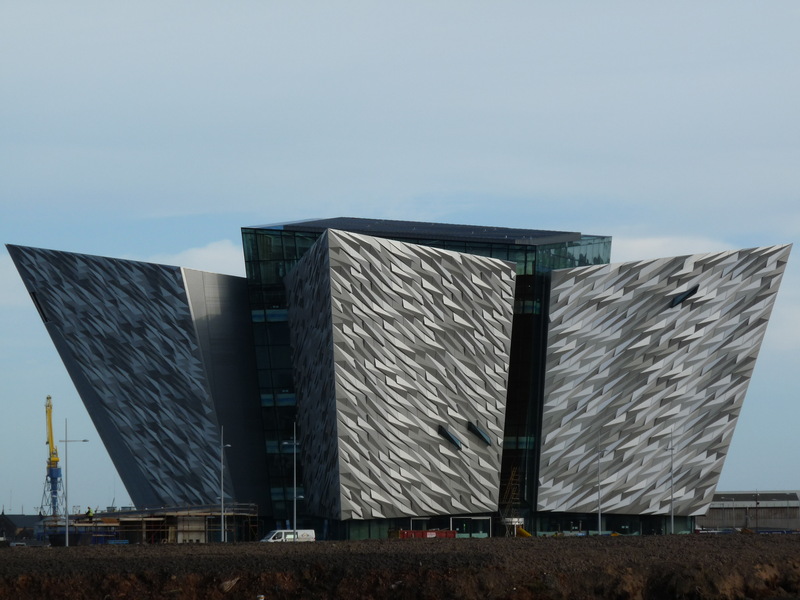 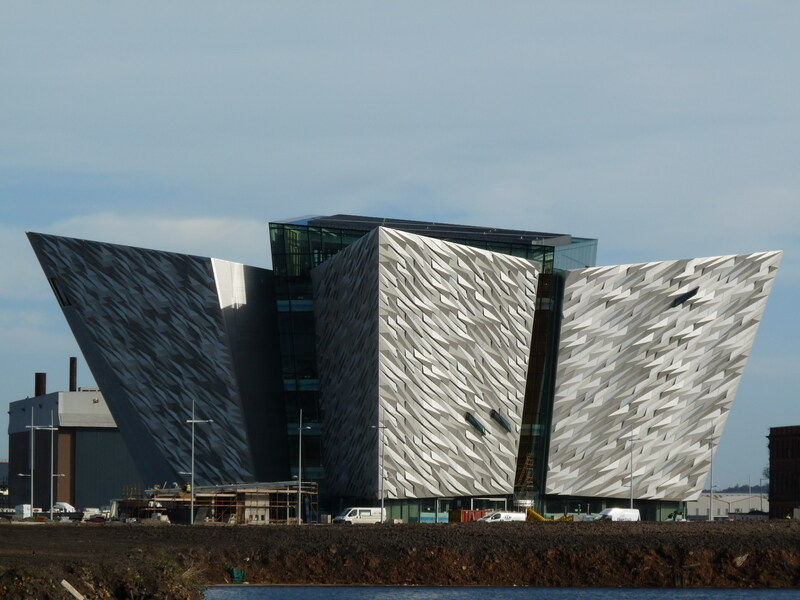 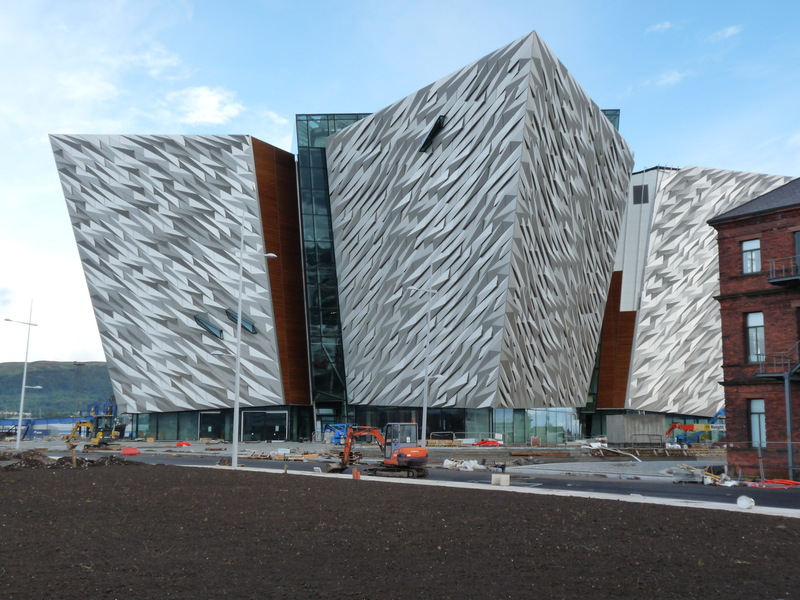 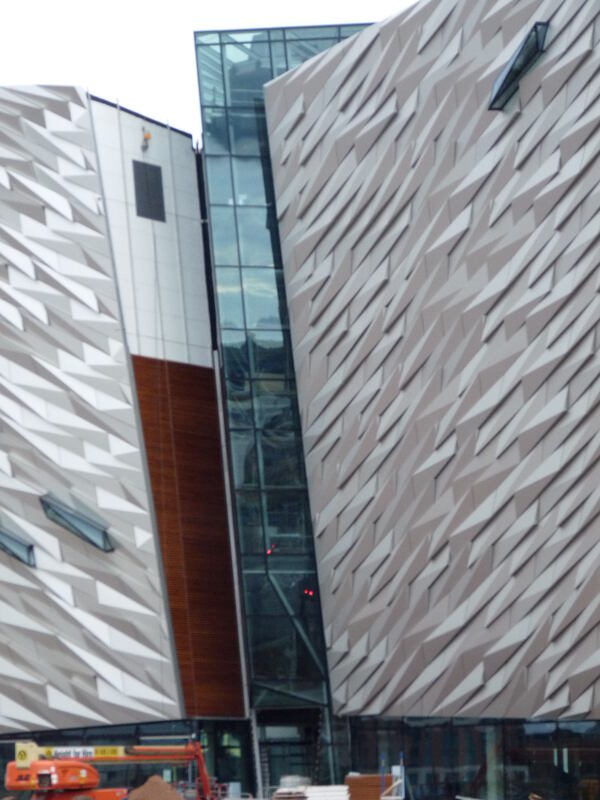 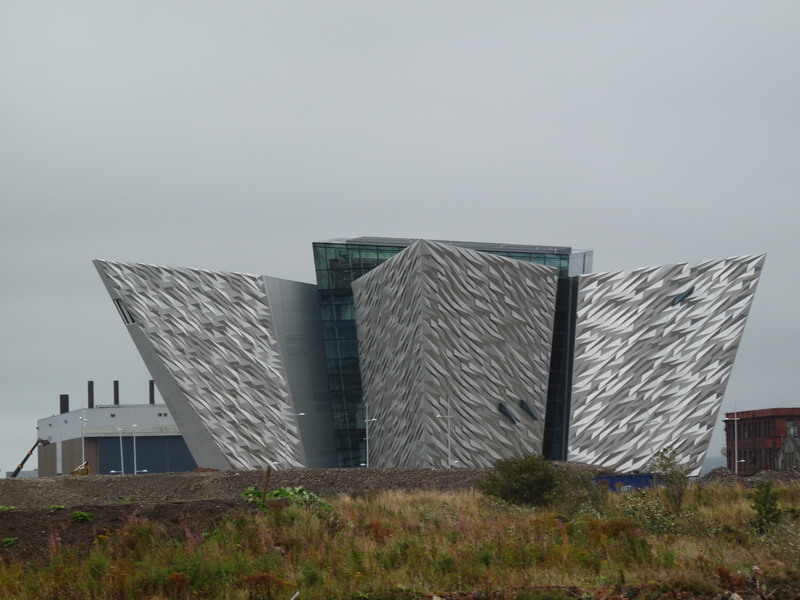 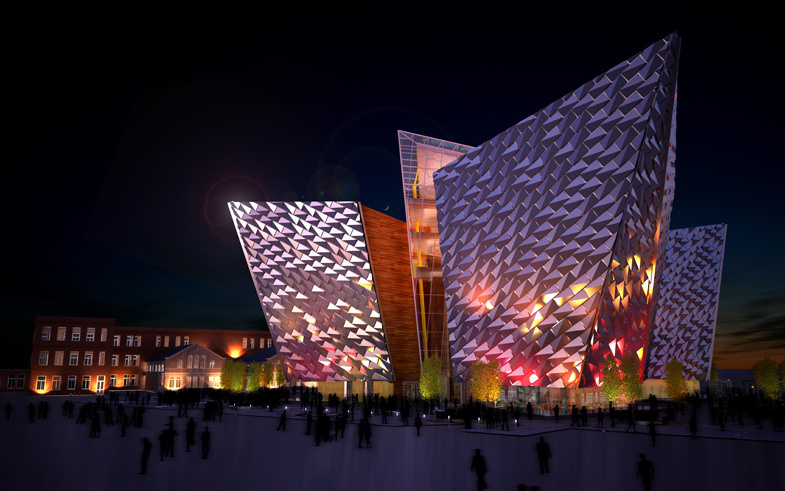 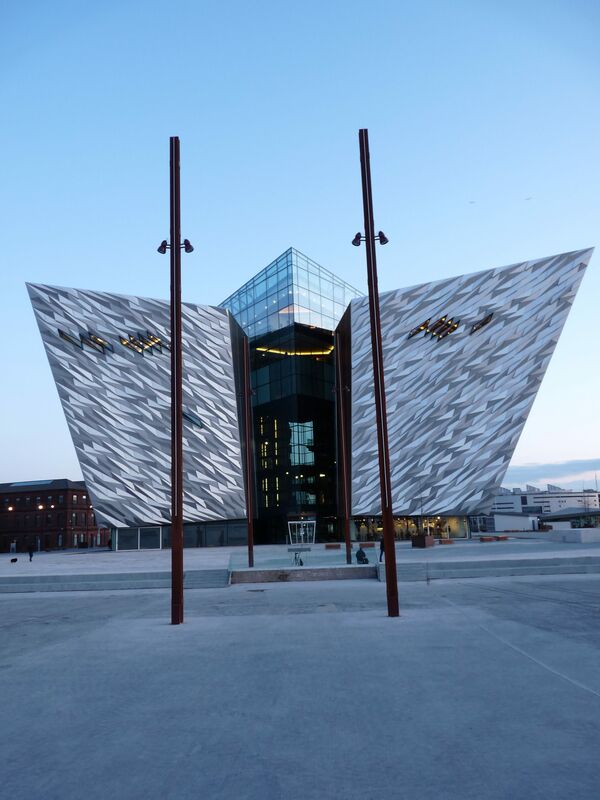 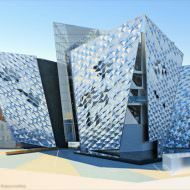 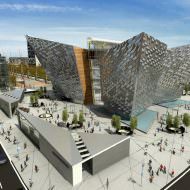 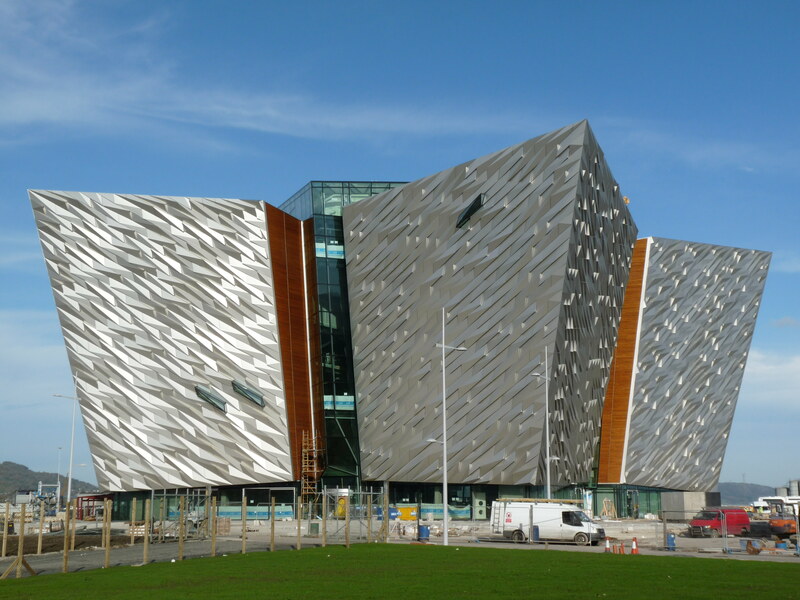 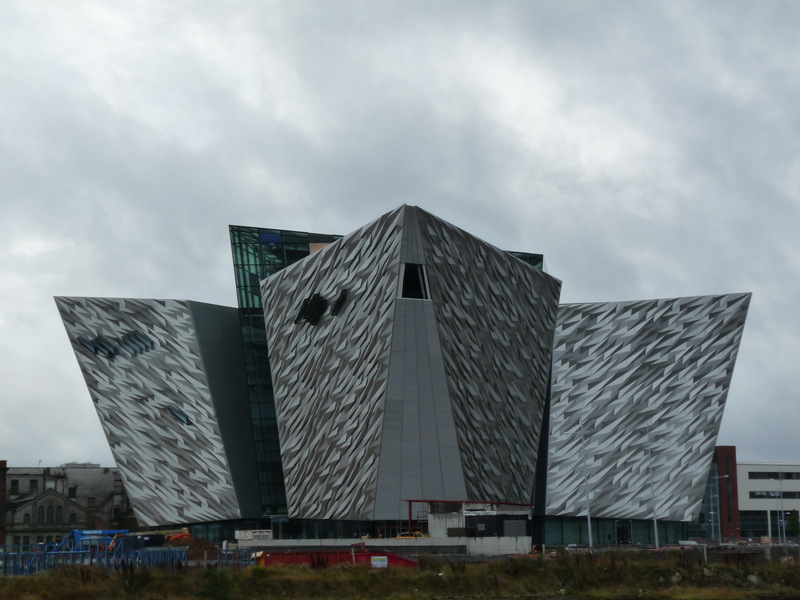 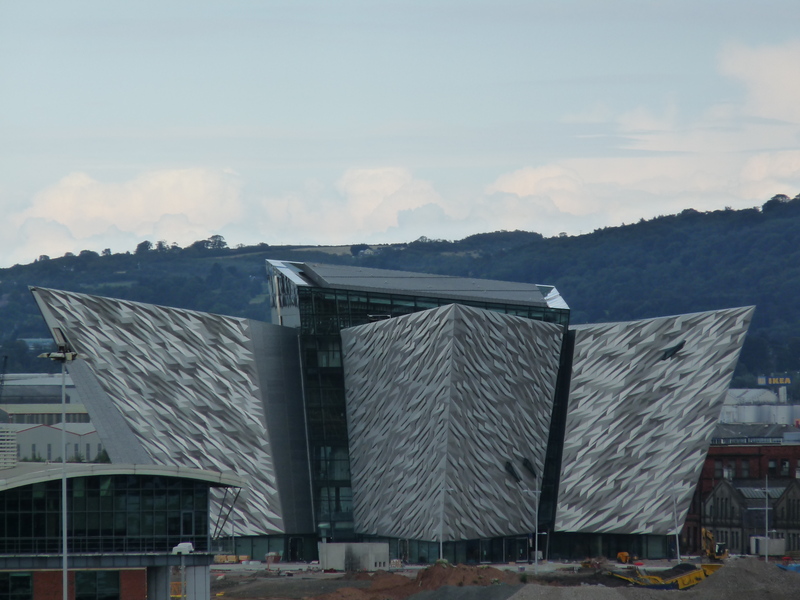 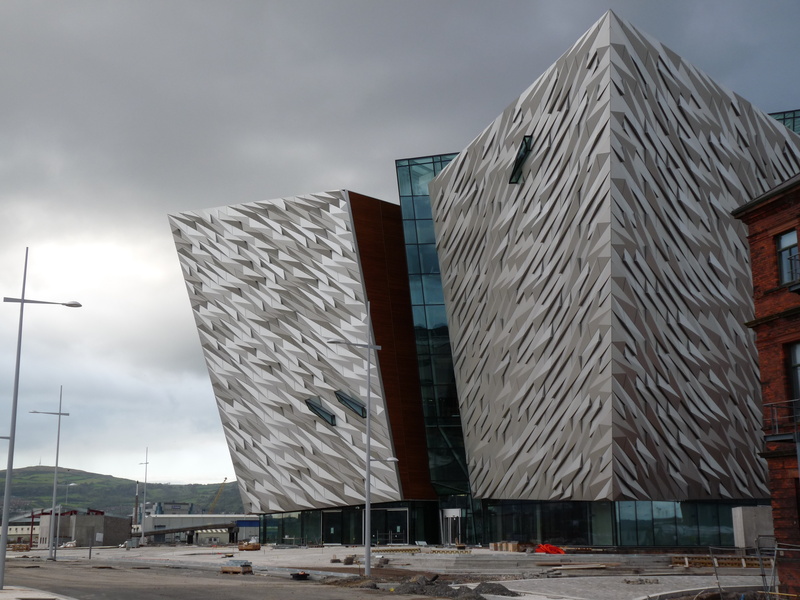 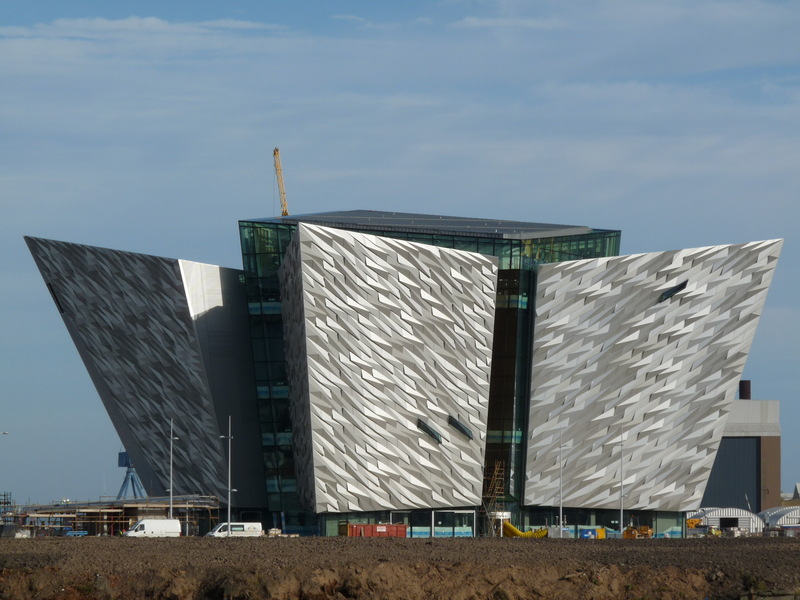 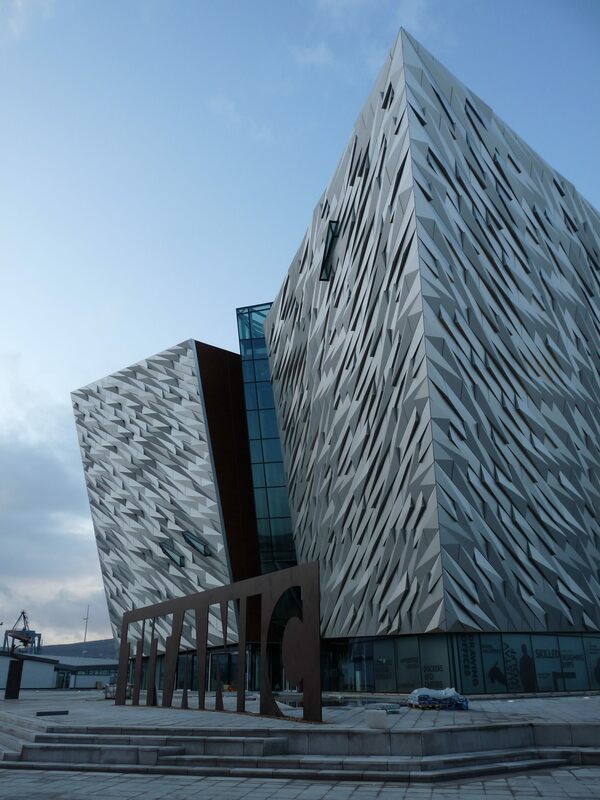 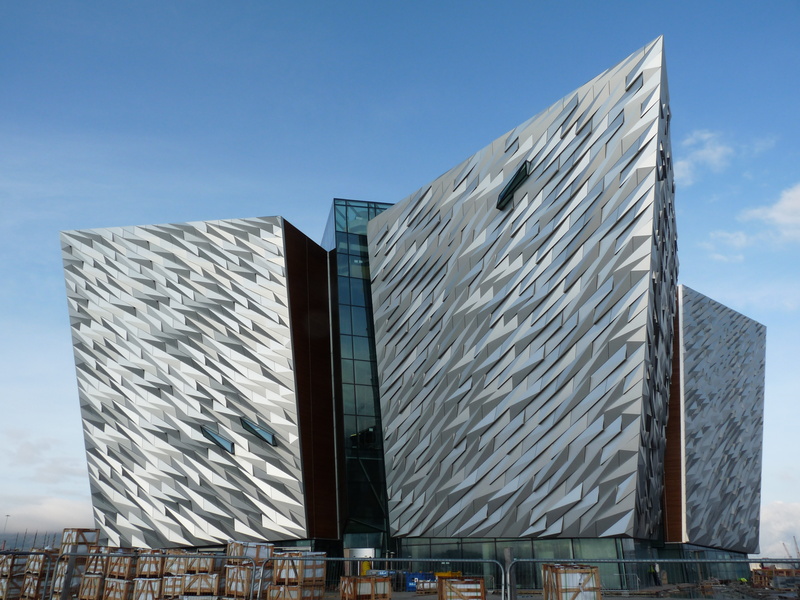 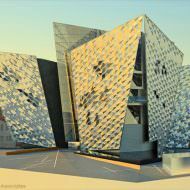 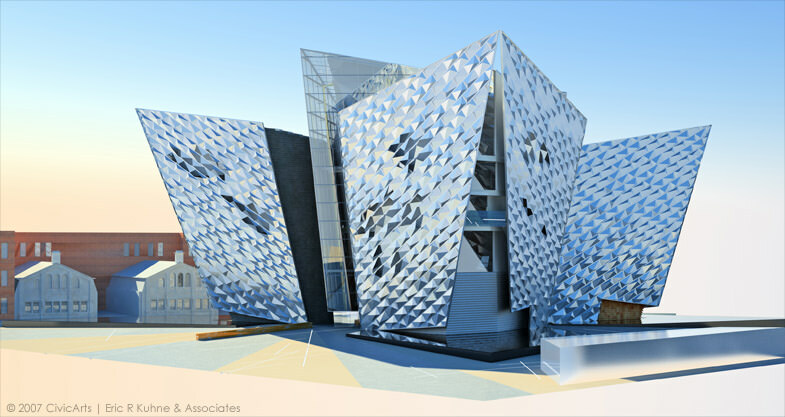 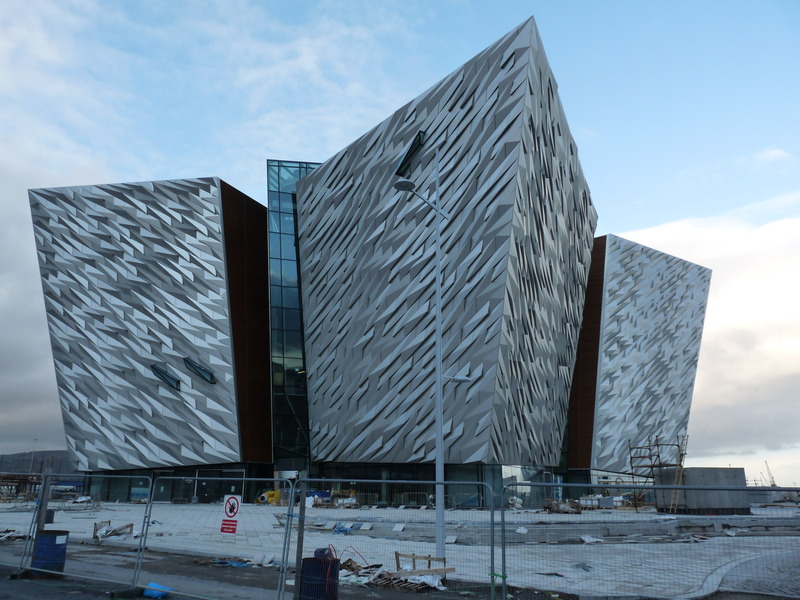 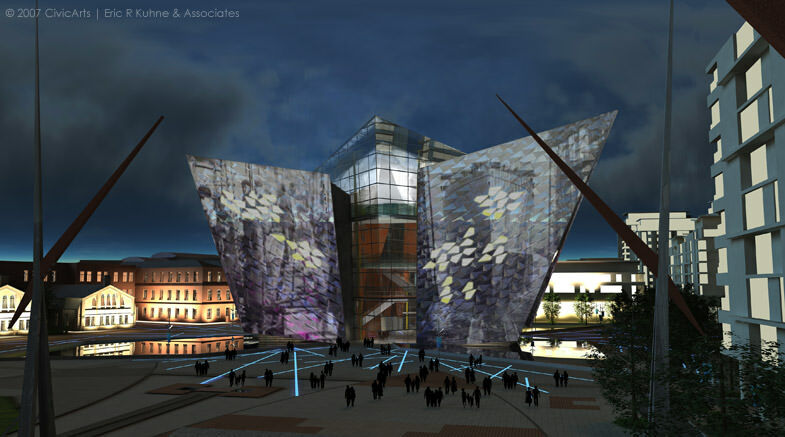 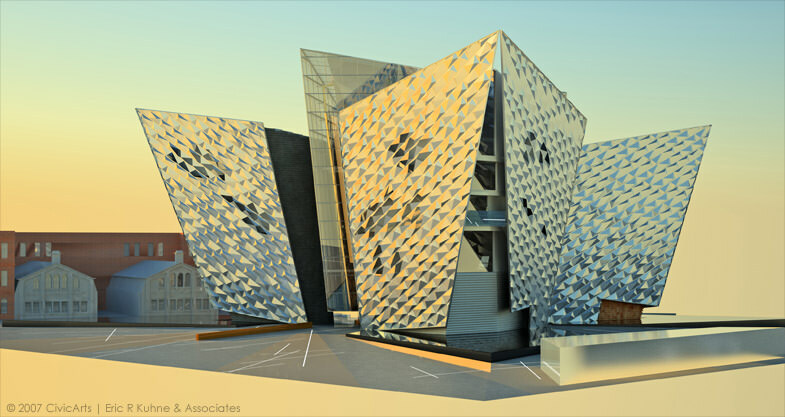 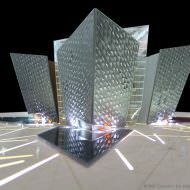 The concept architects for Titanic Belfast were Eric Kuhne and Mark Evans of Civic Arts / Eric R. Kuhne & Associates with executive architecture by Todd Architects. 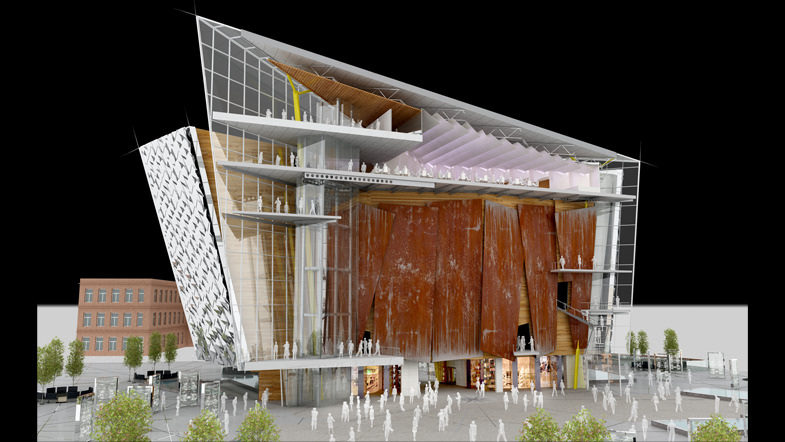 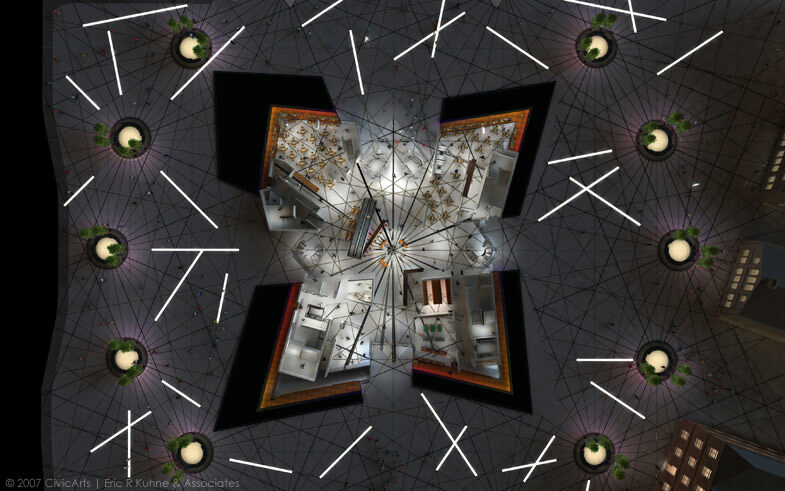 The concept interior design was prepared by Anne Lucas of Civic Arts whilst the final interior design was by Kay Elliot Architects. 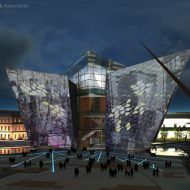 According to Civic Arts (Concept Architect) “the icy conditions in the North Atlantic provided the point of departure for the design process. 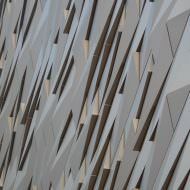 These delicate clusters of feathery facets, clinging to deck handrails and cable stays were translated into a jostling mass of flat planes and hard edges”. 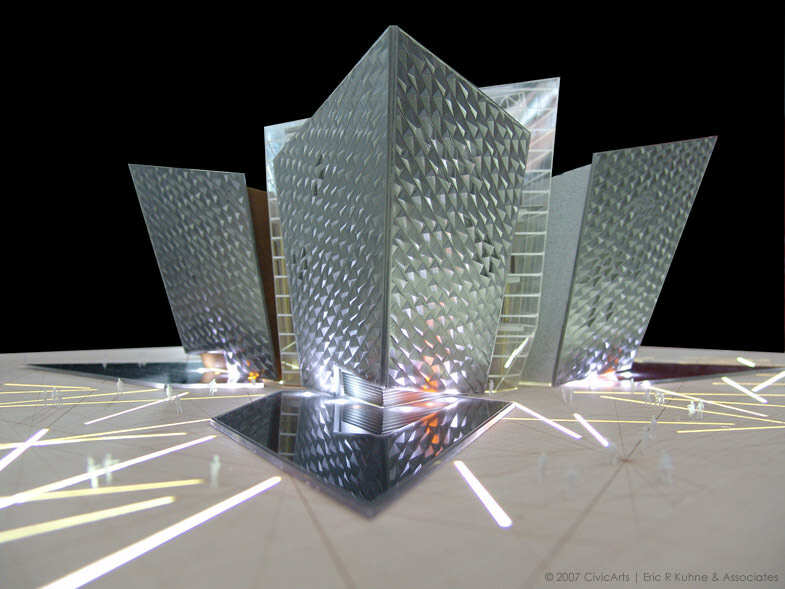 After exploring the crystal structures the concept architects began to look towards solid ice to direct the design process. 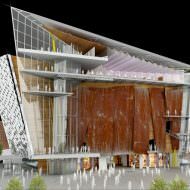 Early models of the building “shared the irregular, amorphous mass of these floating giants, their eroded profiles sculpted along their natural fissures”. 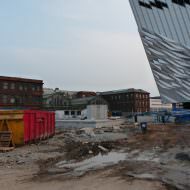 The next significant stage in the design process was the exploration of the White Star Line’s logo and a glass shard evolved with five points – one of which points “purposefully down the former slipways”. 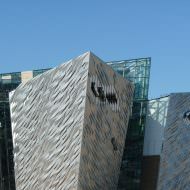 Crystal shards were suggested to “create a dynamic composition that conveyed some of the colossal energy of the ship’s impact with the iceberg”. 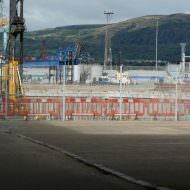 This design stage transformed an archive photos of ships hulls laid out on the North Yard’s slipways into a capturing of four ages of ship building in Belfast – timber, iron, steel and aluminium. 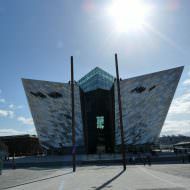 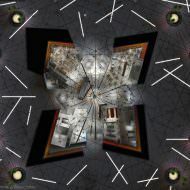 The ‘star’s’ fifth point “slowly drew back into the centre, protected by four hulls that radiated like a compass rose”. 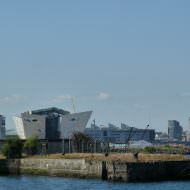 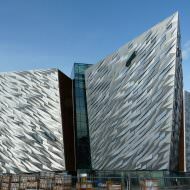 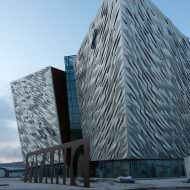 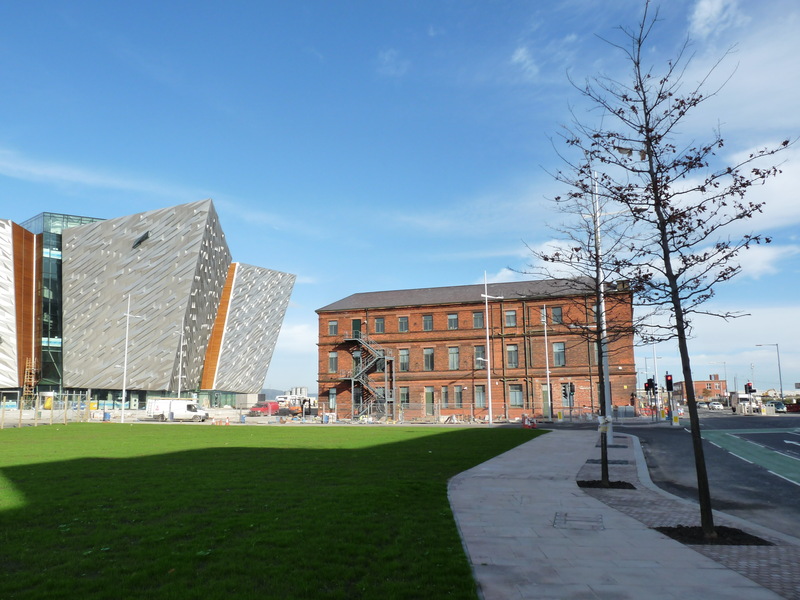 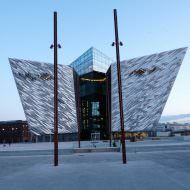 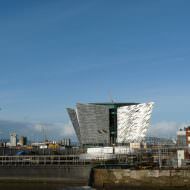 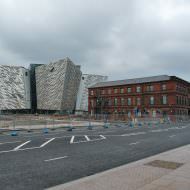 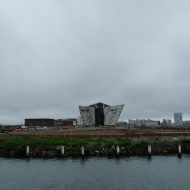 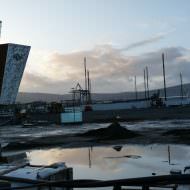 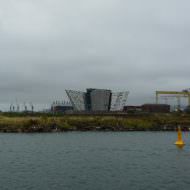 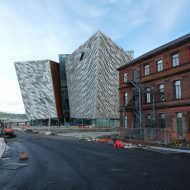 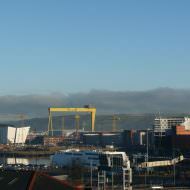 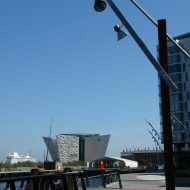 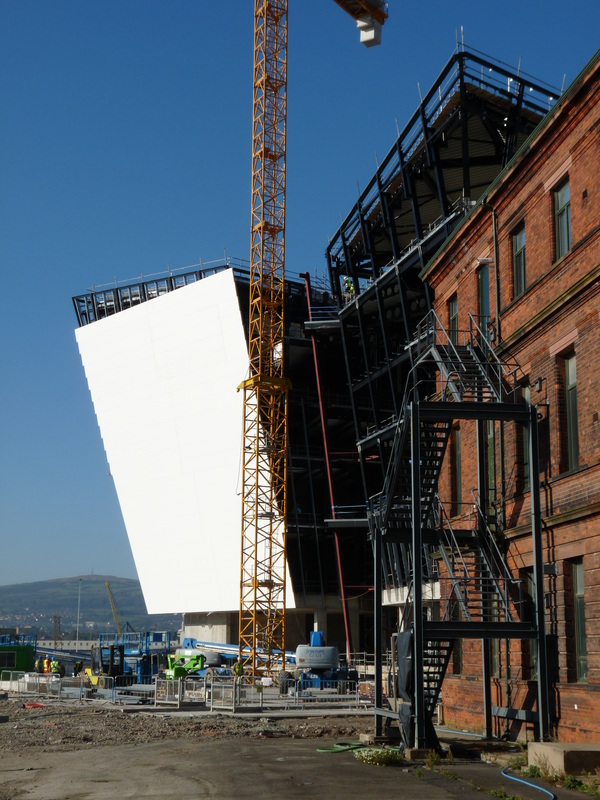 Titanic Belfast is built on the former site of Harland & Wolff’s Plating Works. 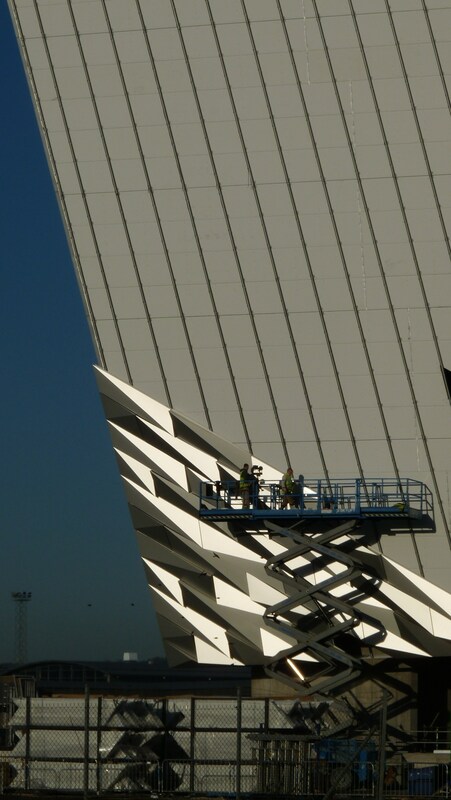 Applying a skin metal plates to their surfaces transformed the star’s points into liner’s bows, raised up upon their keel blocks with the cradle of the Arrol Gantry. 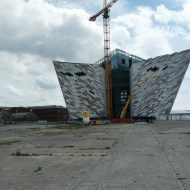 Suggestions that a replica of the Titanic should be built as an attraction have surfaced from time to time however the costs associated with such a venture are extremely high. 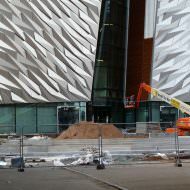 The idea was investigated during the Titanic Signature Project’s early phases but ruled out due to the costs and the modern safety regulations which would result in a very different ship to the original Titanic. 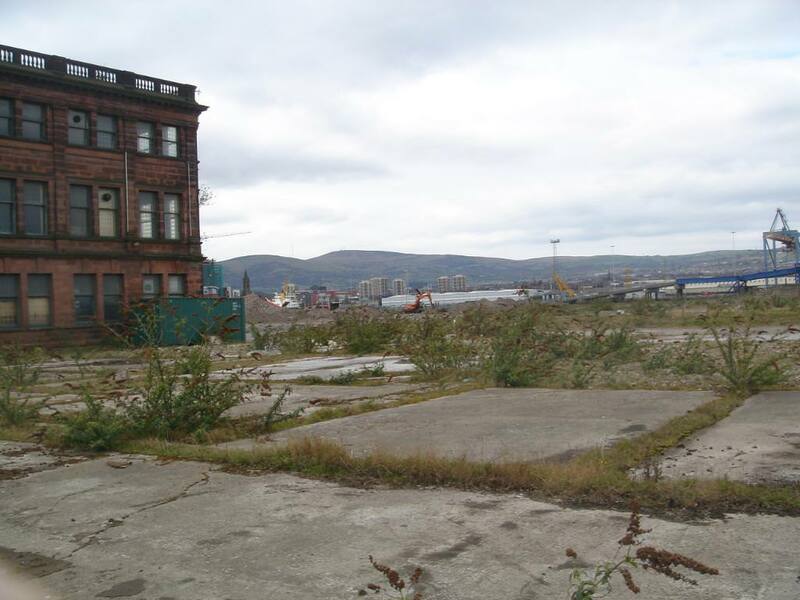 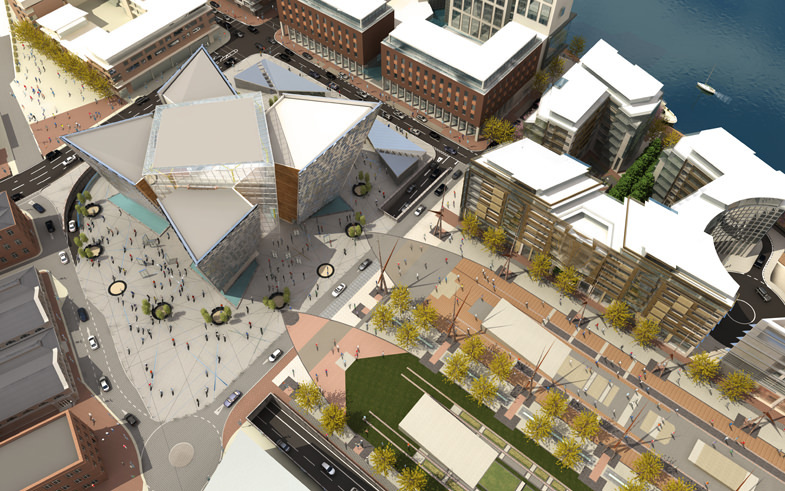 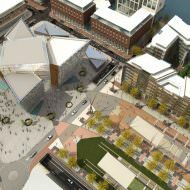 An alternative proposal by the Odyssey Trust for a wrap-around building / extension to the Odyssey overlooking Abercorn Basin was proposed at an estimated cost of £40m. 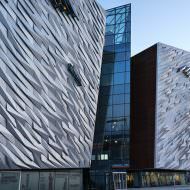 The world’s largest Titanic visitor attraction with interactive exhibitions, leisure and cultural facilities and commercial space. 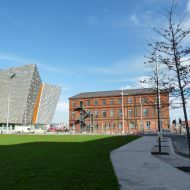 The six storey building provides seven themed gallery exhibitions, one large gallery for temporary exhibitions, performances and meetings, a Titanic themed 750 seat banqueting suite, café, restaurants and a gift shop and community and education space. 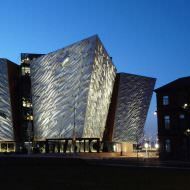 During August 2011 Dr Robert Ballard, the man who discovered the Titanic in 1985, returned to the shipwreck to capture fresh images of the ship for Gallery 9. 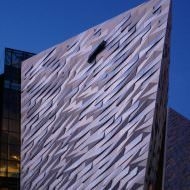 The fifth and sixth floors of Titanic Belfast replicate the opulent surrounds of the Titanic’s first class banqueting room. 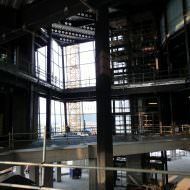 The suite can accommodate up to 1,000 people and includes a replica of the famous grand staircase and of the glass dome once situated above the staircase. 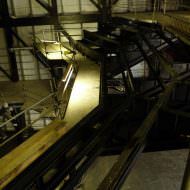 Kay Elliott spent several months developing a detailed 3D technical model based on photographs of the original staircase onboard Titanic’s sister ship the Olympic. 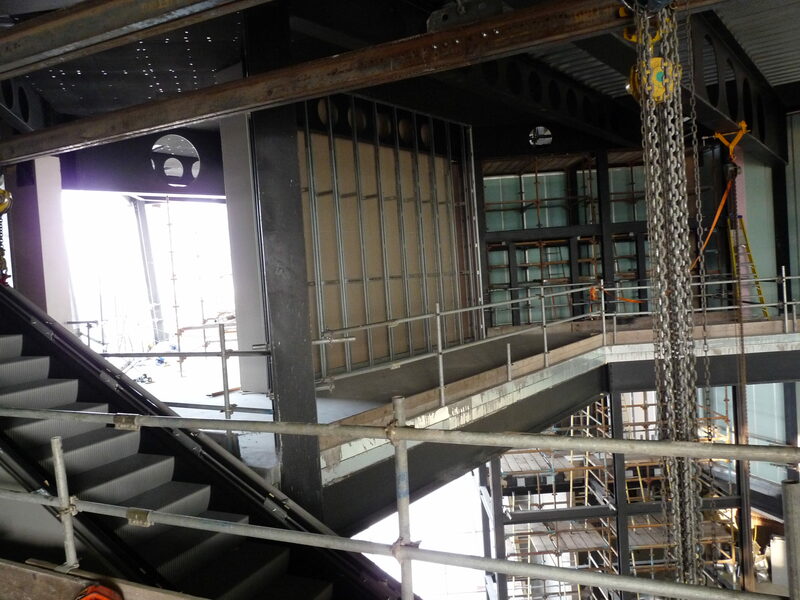 The replica Grand Staircase is as “faithful to the original as modern building regulations and design constraints allow” and is made up of 10,000 individual parts. 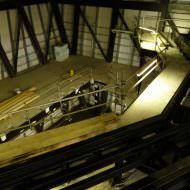 The 23ft high and 24ft wide staircase was built in six separate sections using red oak, the same wood which was used for the original Grand Staircase on Titanic. 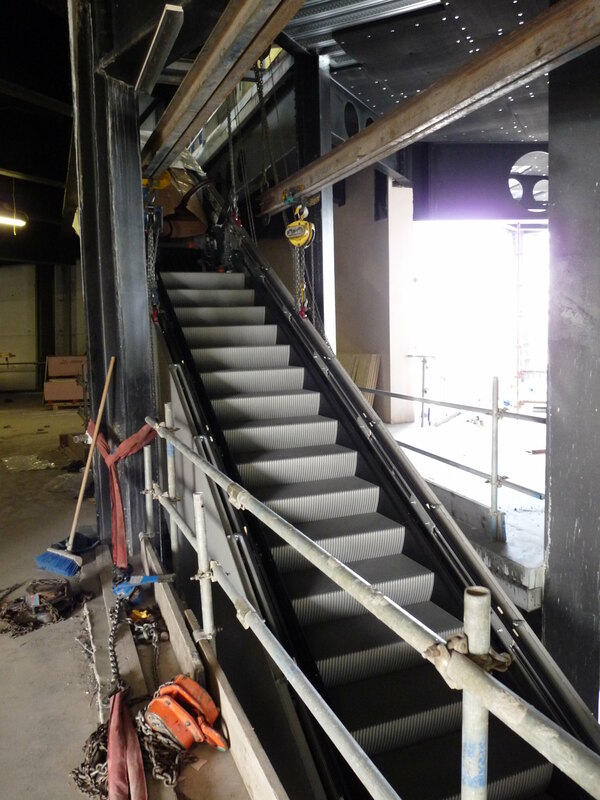 It took six joiners 1,500 man-hours to recreate the nearly four ton staircase. 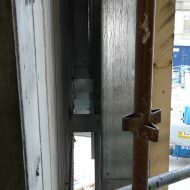 Oldtown Joinery used mostly traditional joinery techniques but due to modern building control a brass handrail was installed for health and safety purposes. 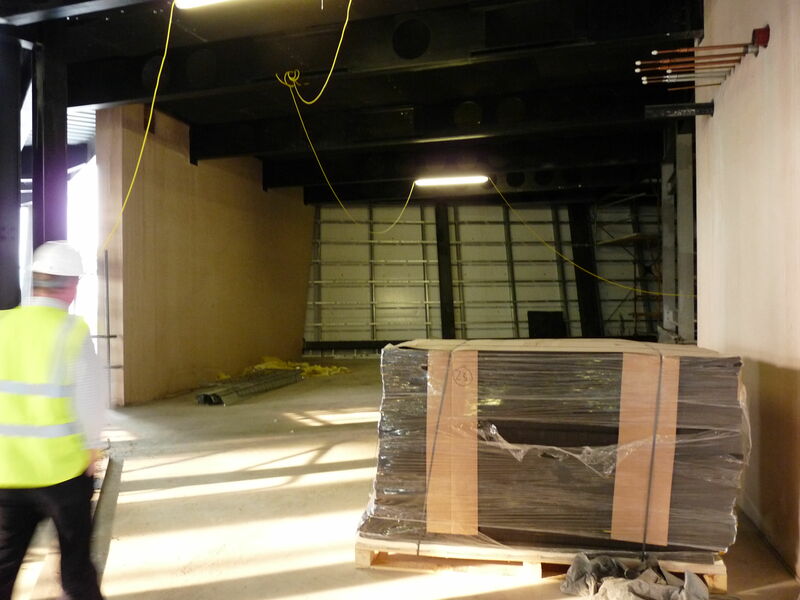 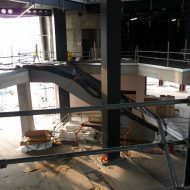 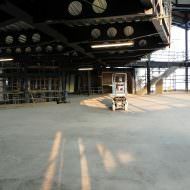 To allow cater for the use of the banqueting suite as a conference facility a stage / platform area has been installed to allow presentations to take place from the staircase. 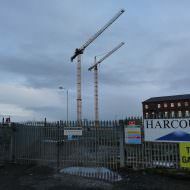 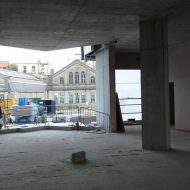 Construction work by main contractors Harcourt Construction (NI) Ltd (a construction division of Dublin based company Harcourt Developments) began in May 2009. 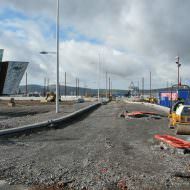 However, it was not until a meeting of the Northern Ireland Executive on 1st October 2009 that it finalised its financial commitment to the project and agreed to a £43.5 contribution. 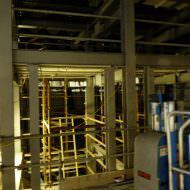 During 2009 Dawson WAM constructed the 100 by 100 metre basement by installing “483 linear metres of 600mm diameter hard/hard secant wall”. 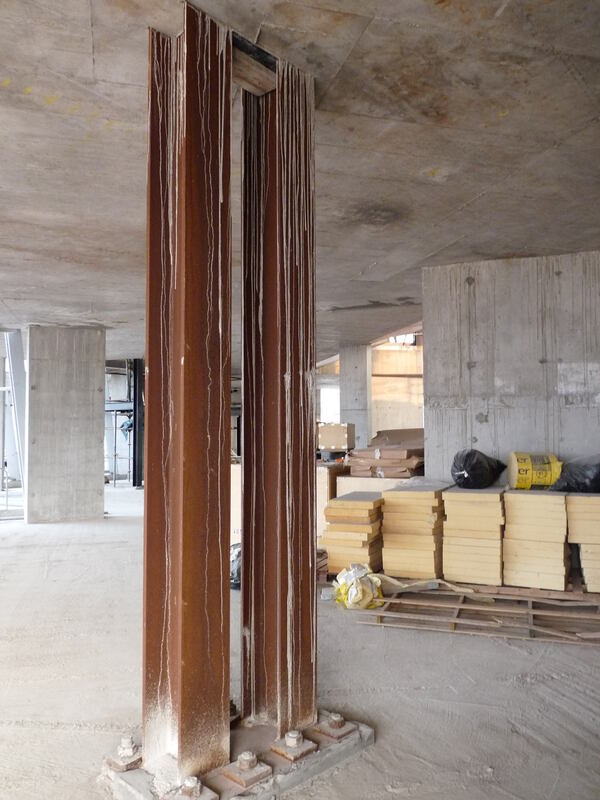 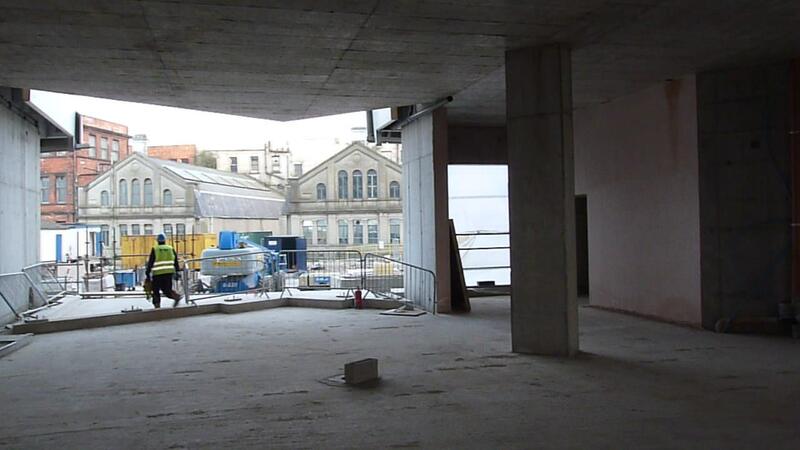 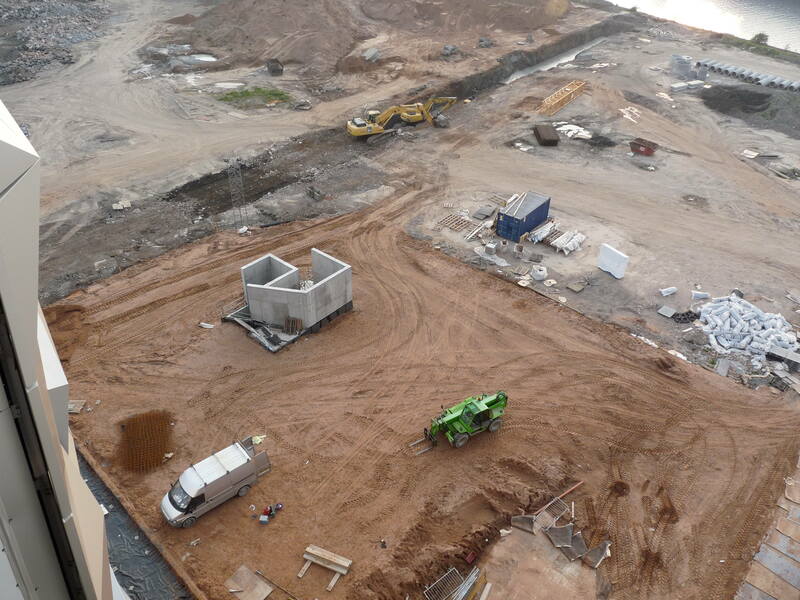 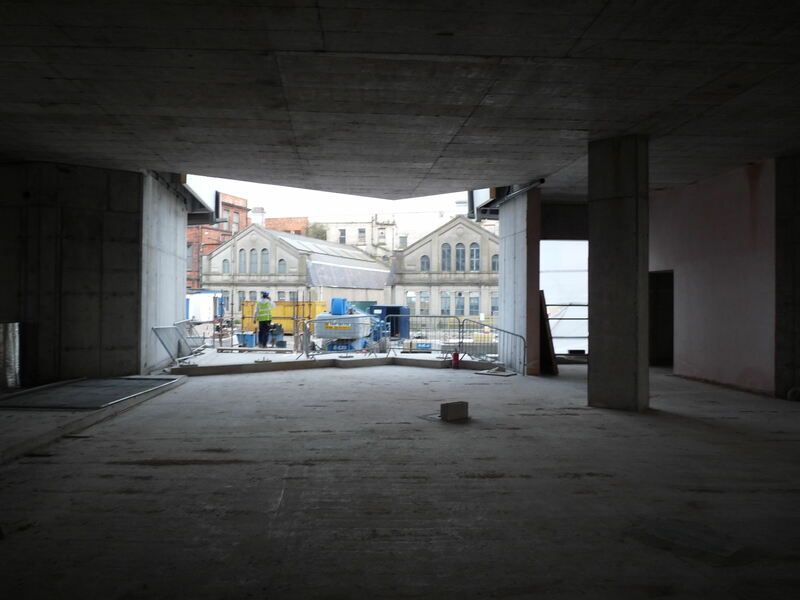 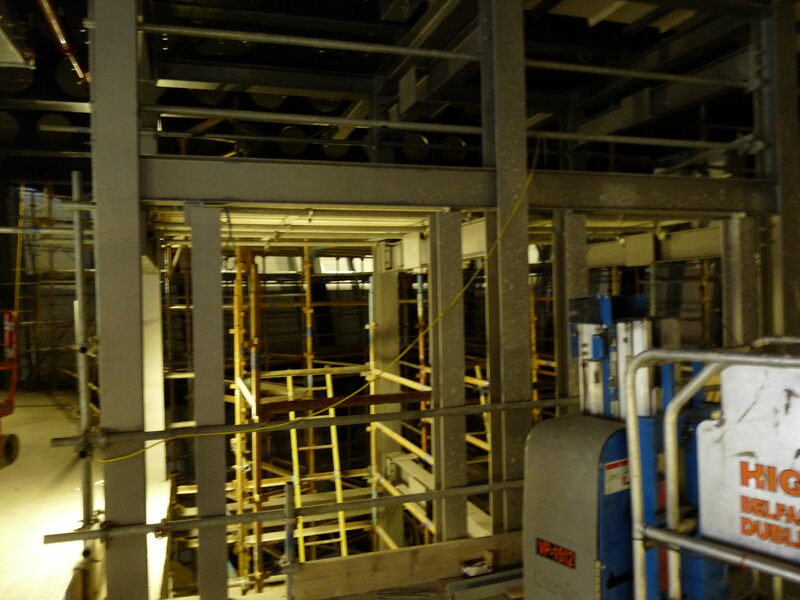 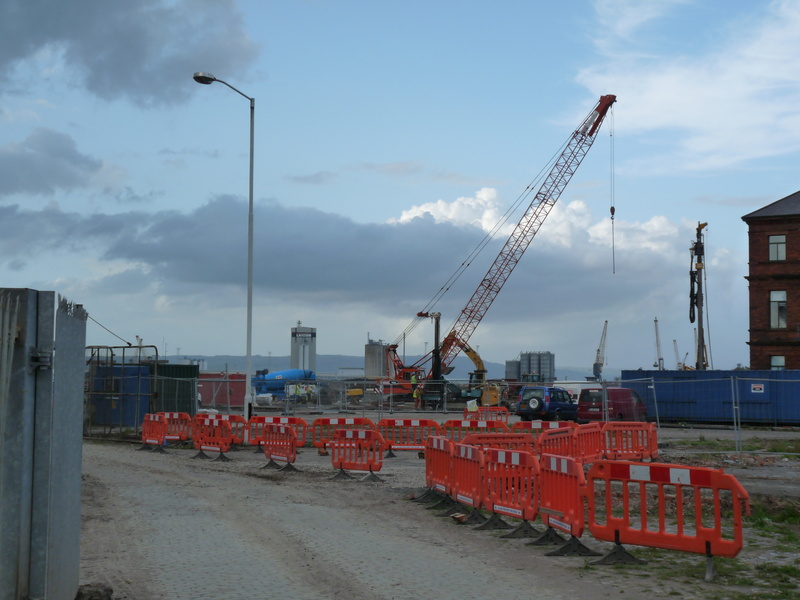 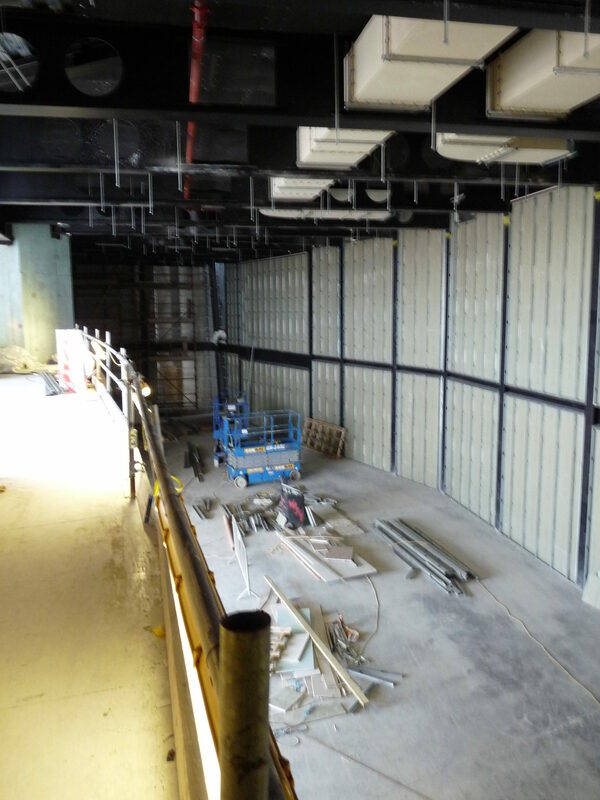 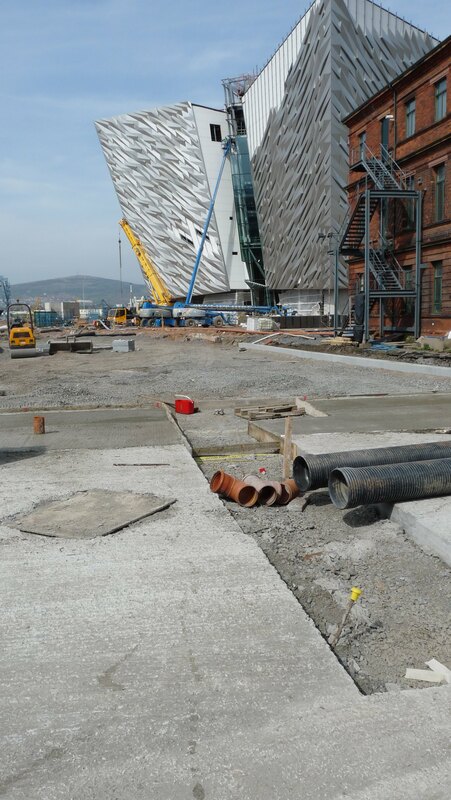 The basement was then excavated to a depth of 7m by Harcourt Construction to allow the installation of around 1,000 bearing piles each carrying 1500kN in up to 5m of Belfast sleech and on top of 6m of sand. 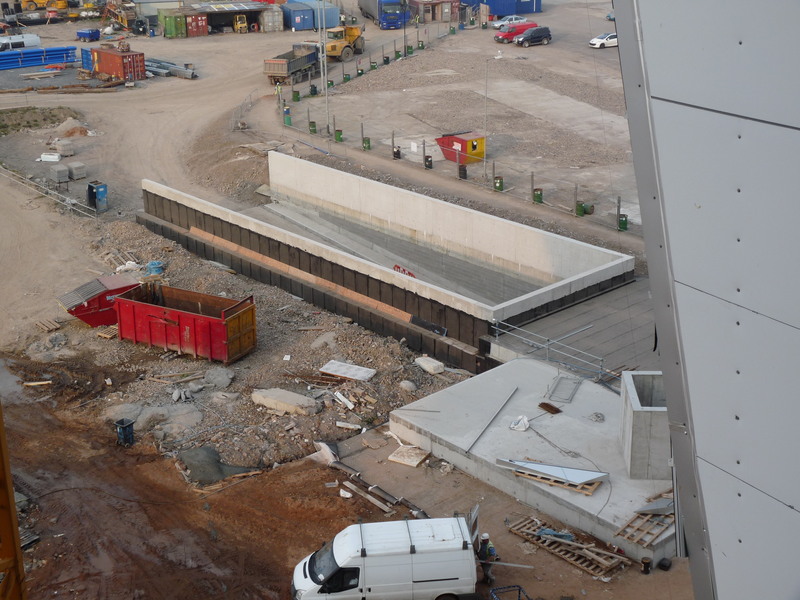 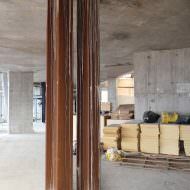 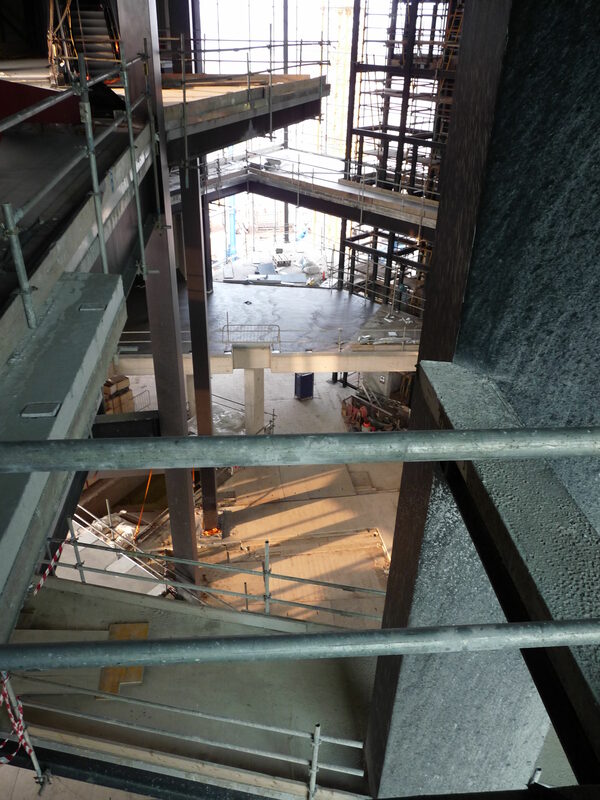 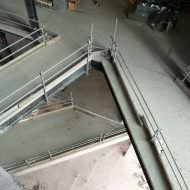 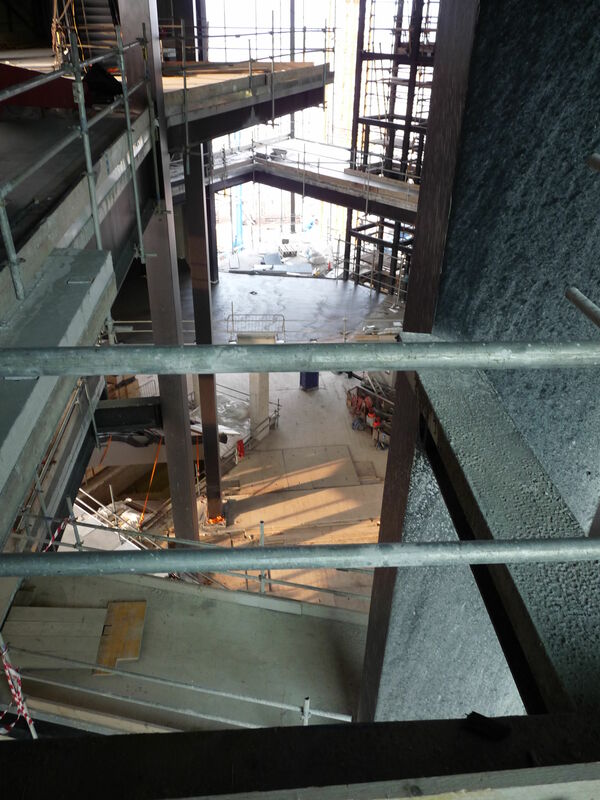 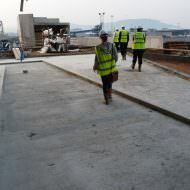 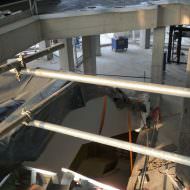 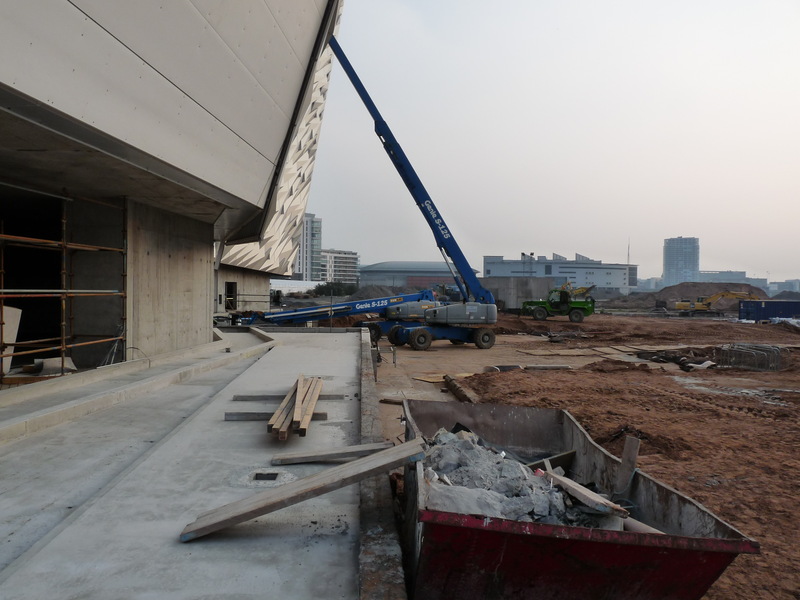 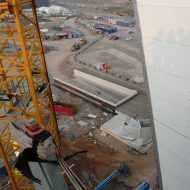 On the 4th December 2009 4,200 cubic metres of concrete was laid 8m below ground level across an area of 3,800 square metres to create the basement for the building. 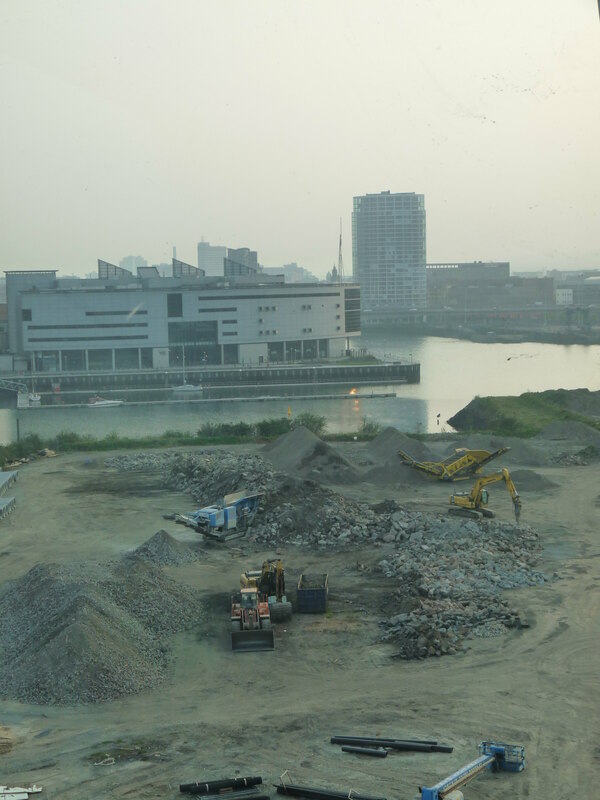 Over 100 men from five different companies worked in shifts throughout the night whilst 50 concrete trucks delivered approximately 250 cubic metres of concrete per hour [one load every two minutes]. 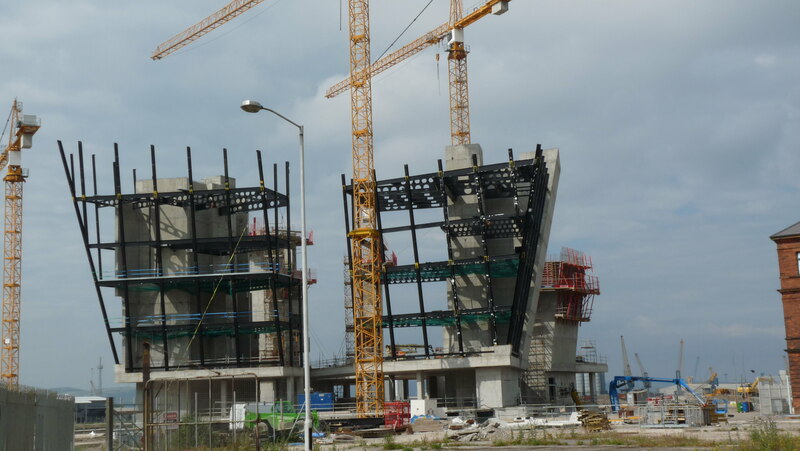 The pour was reportedly the largest ever concrete pour to take place in Ireland. 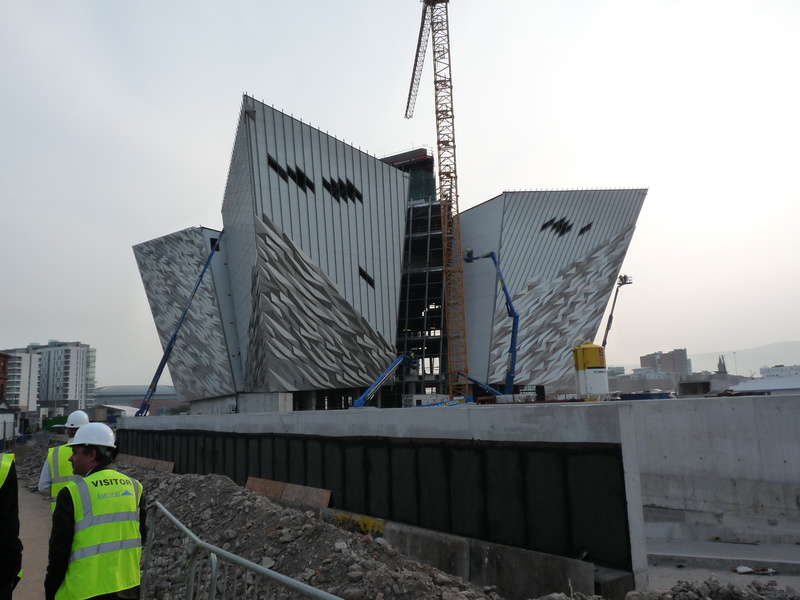 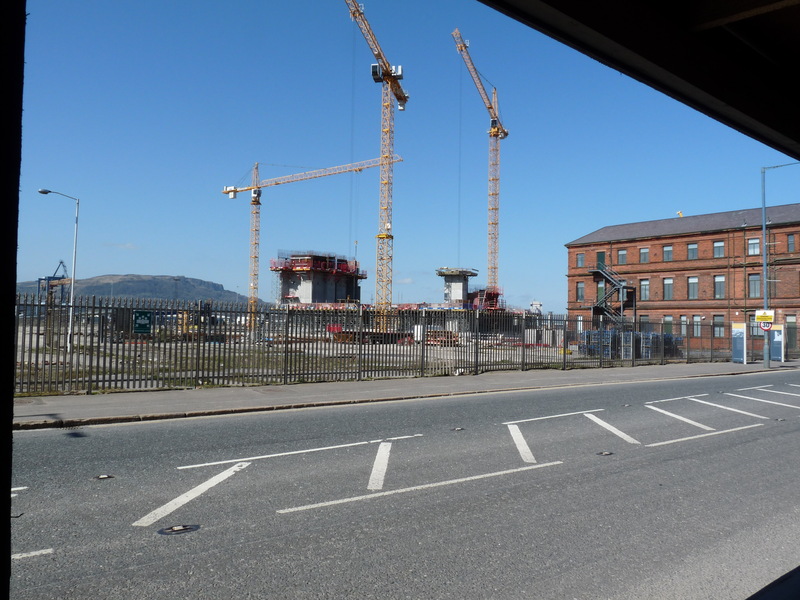 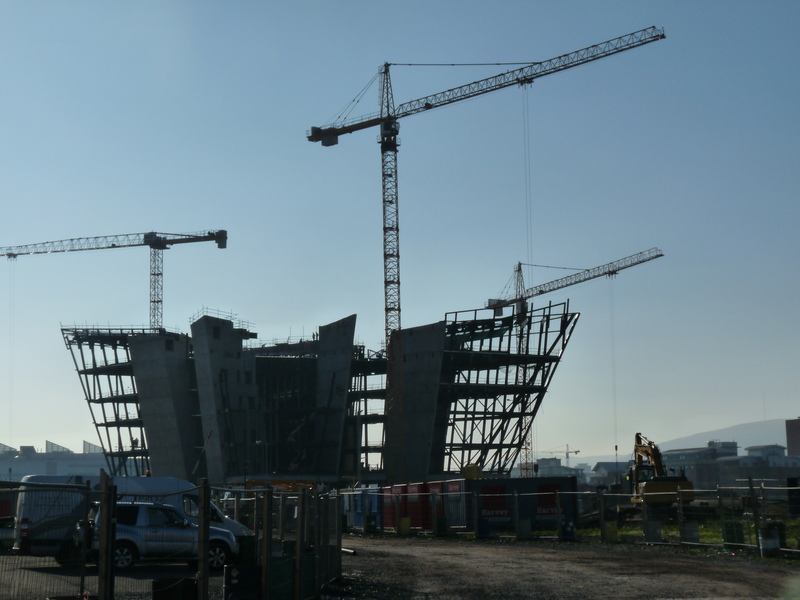 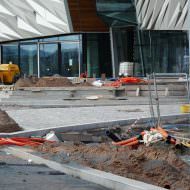 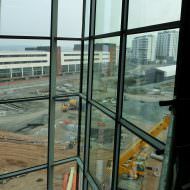 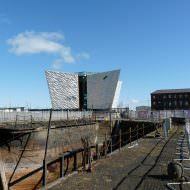 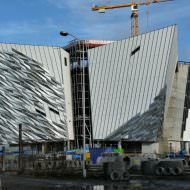 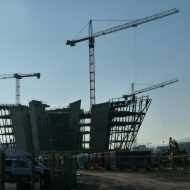 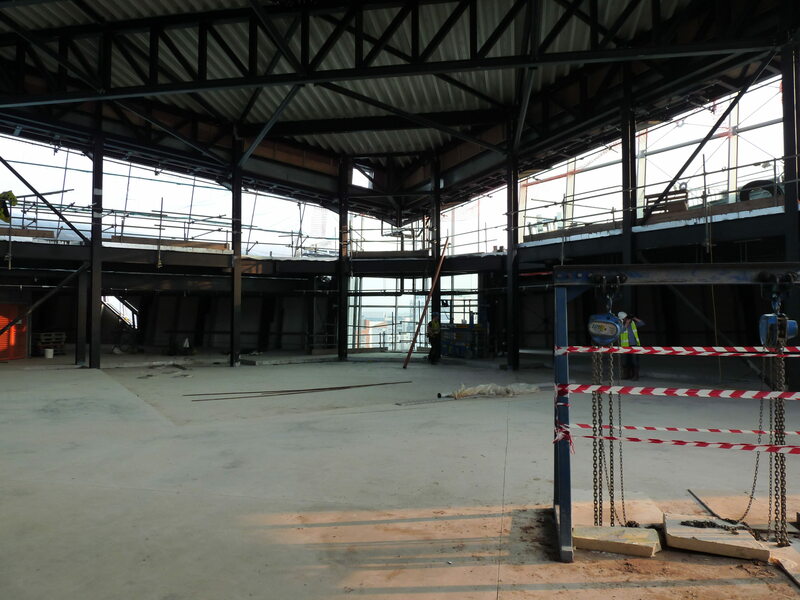 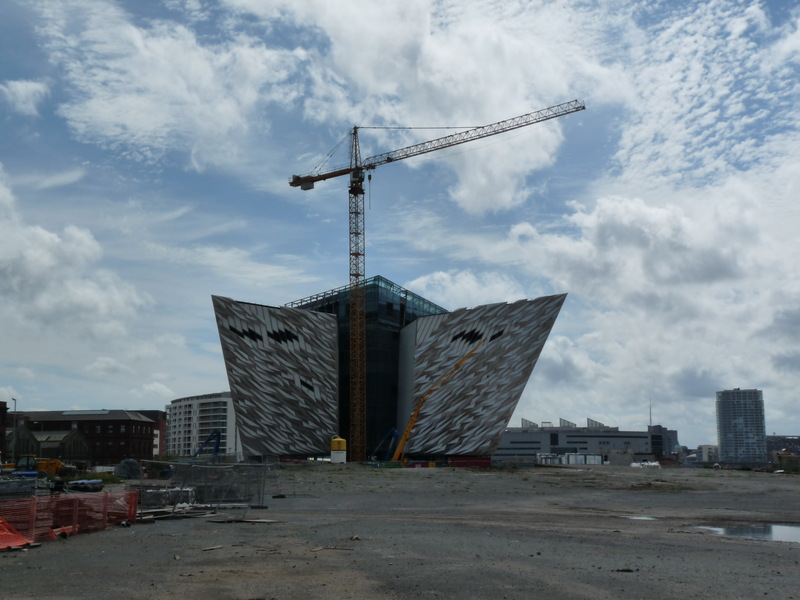 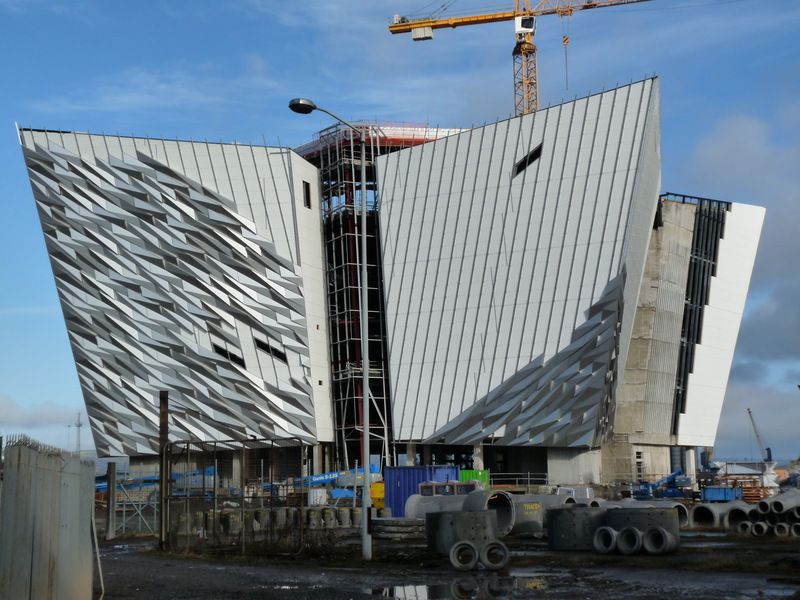 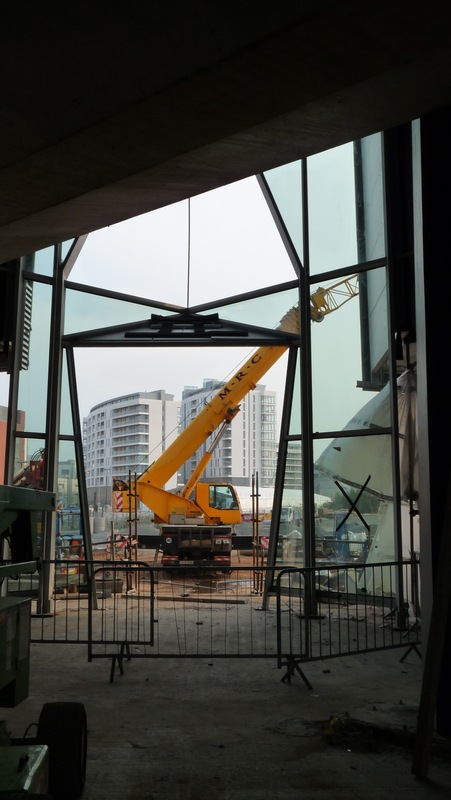 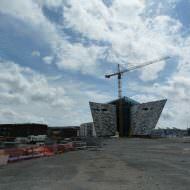 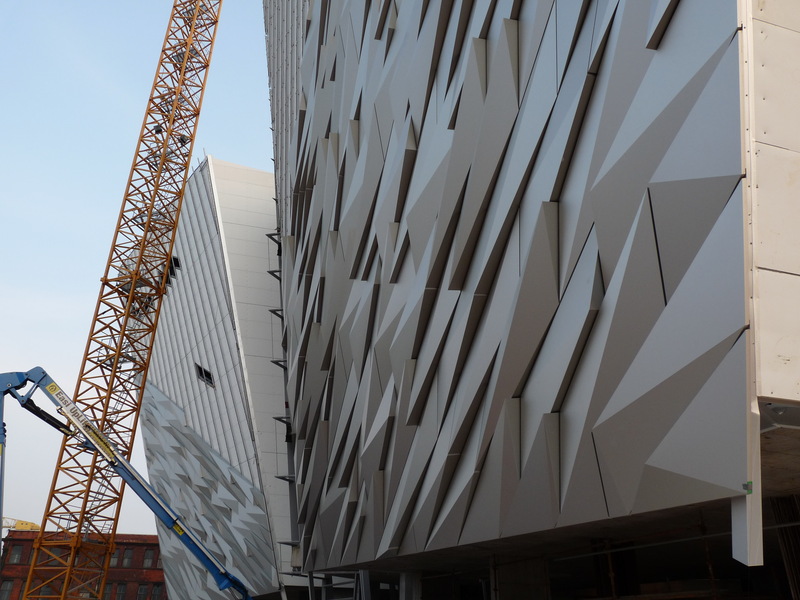 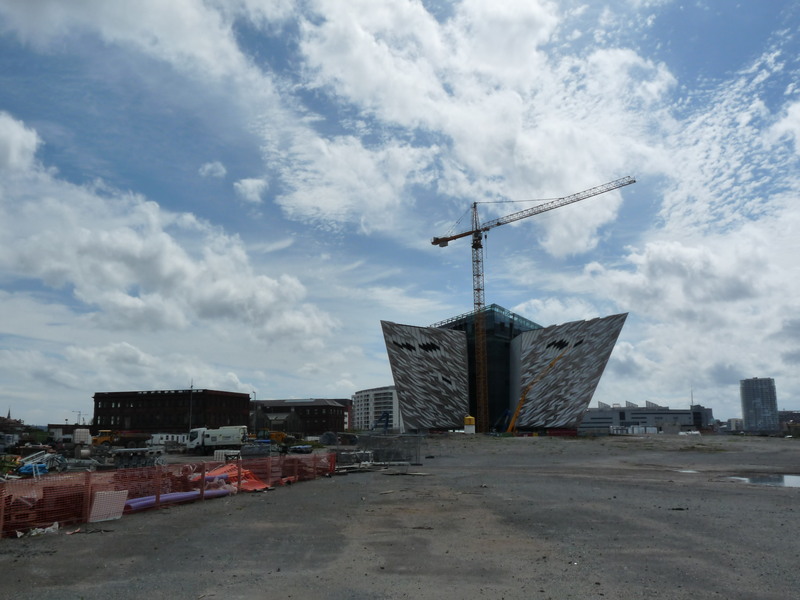 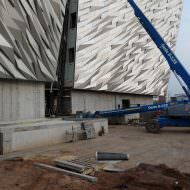 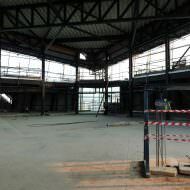 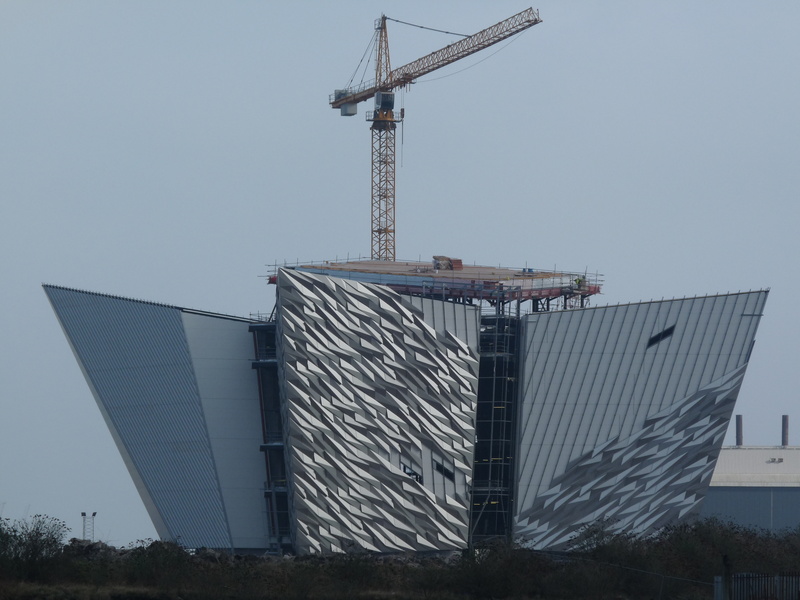 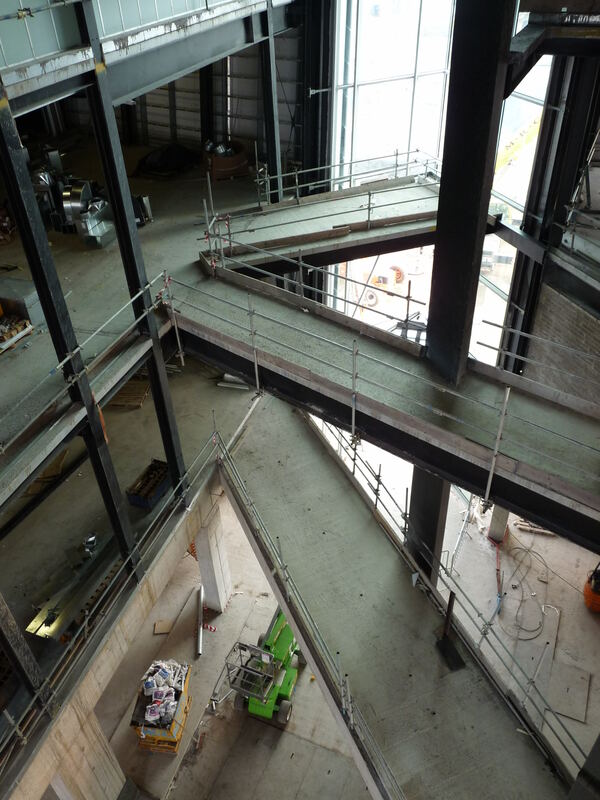 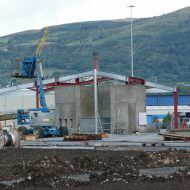 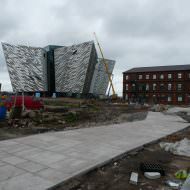 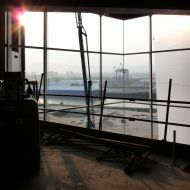 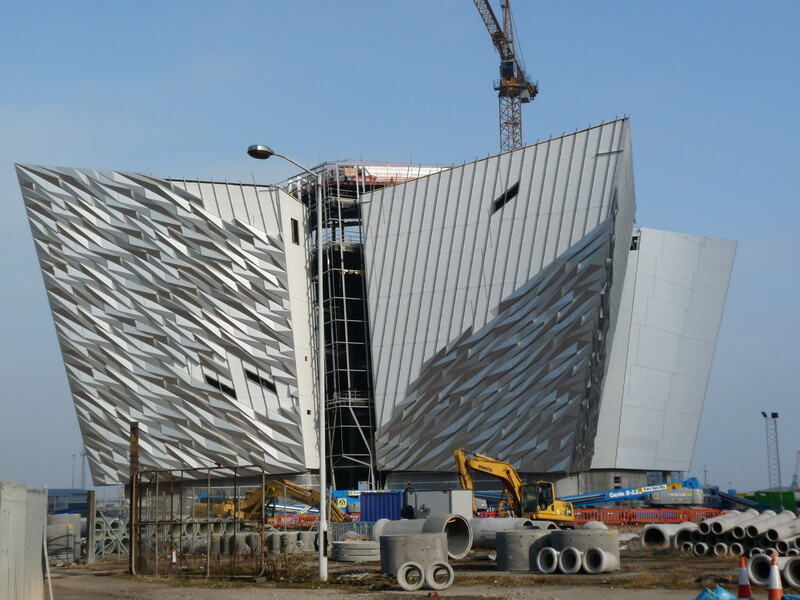 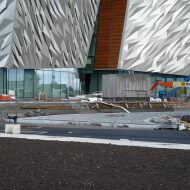 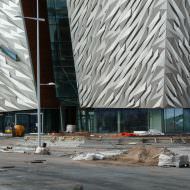 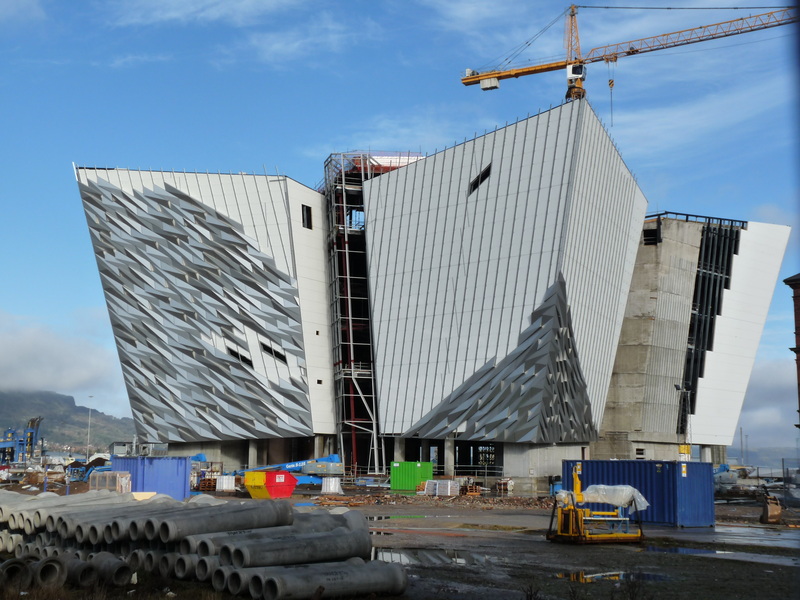 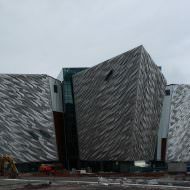 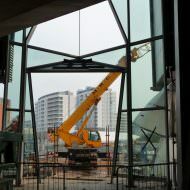 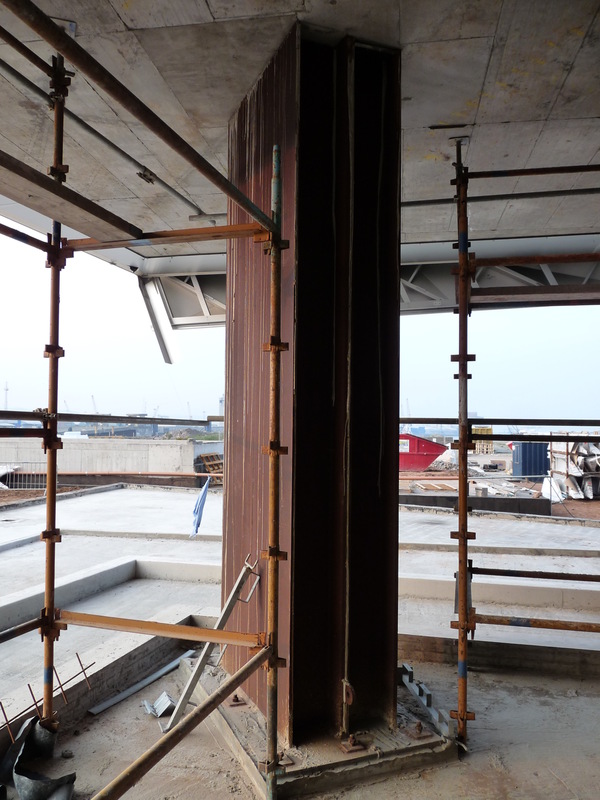 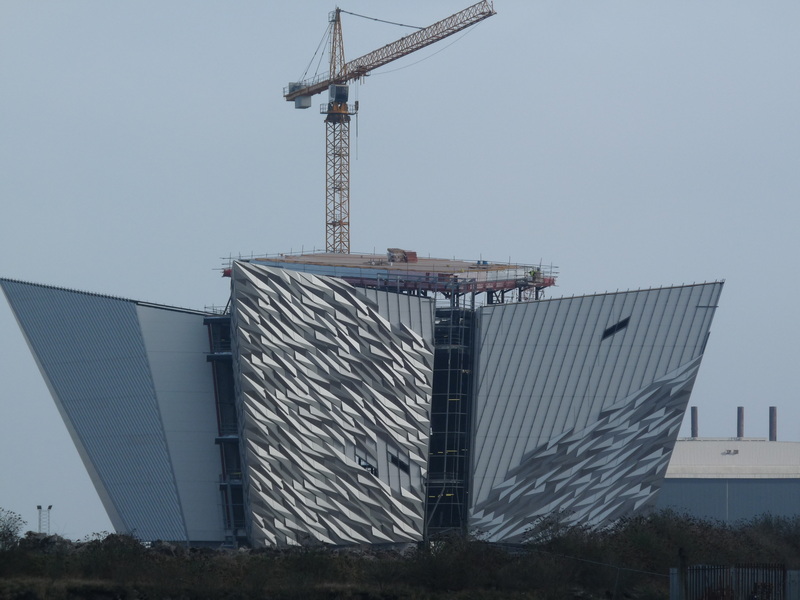 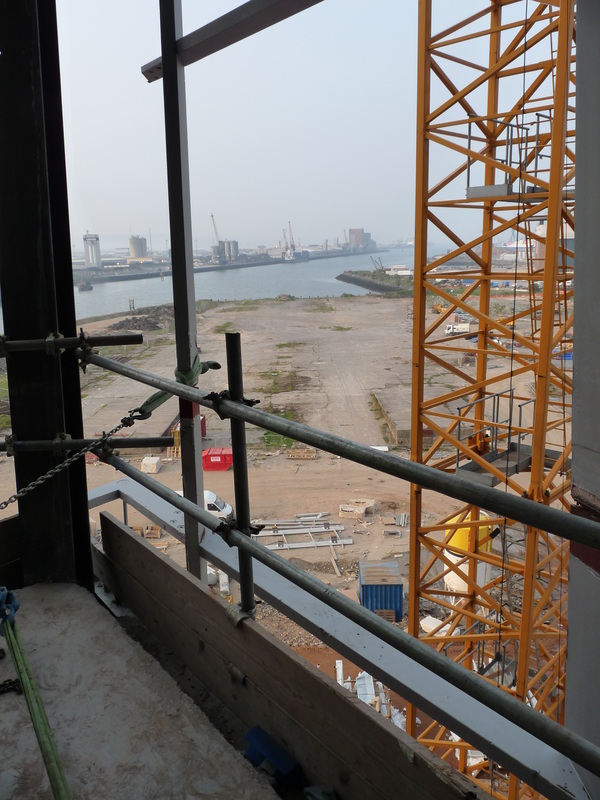 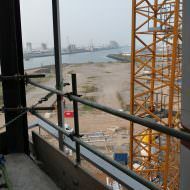 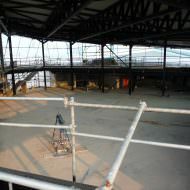 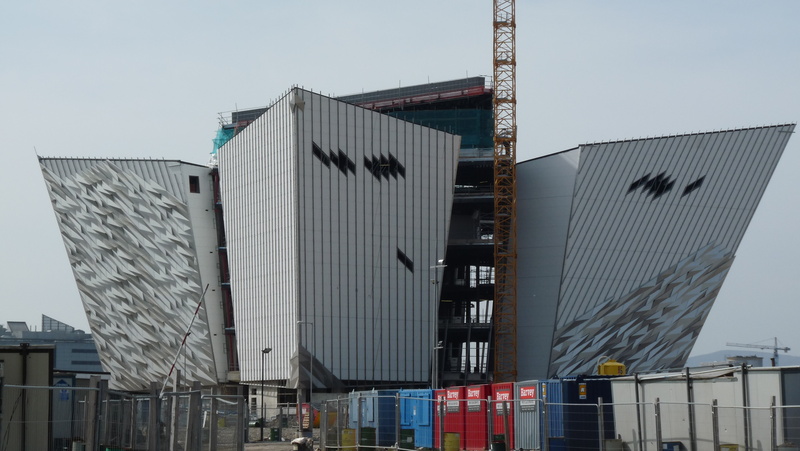 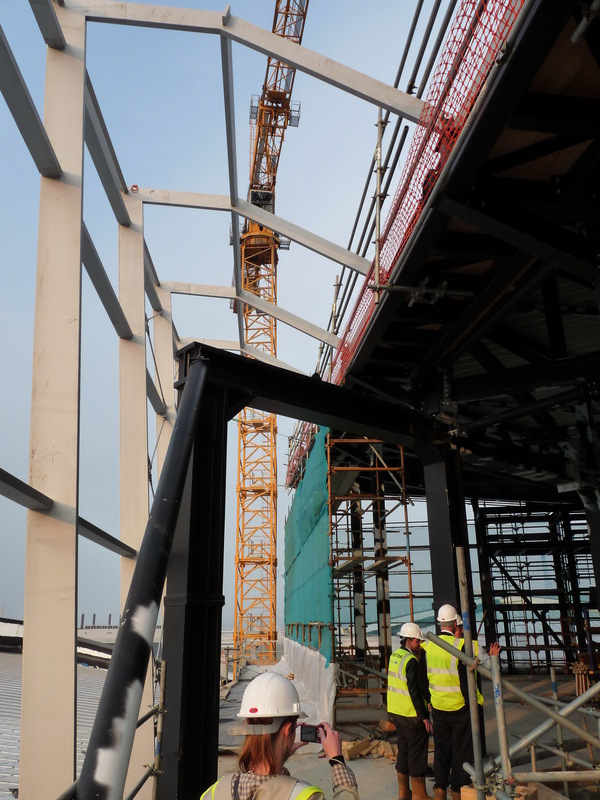 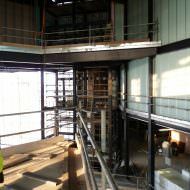 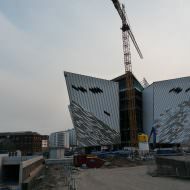 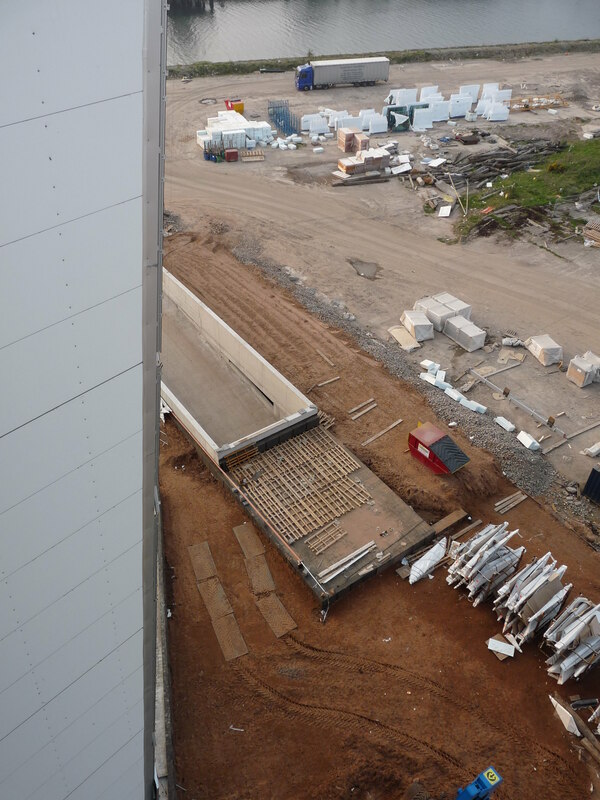 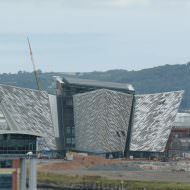 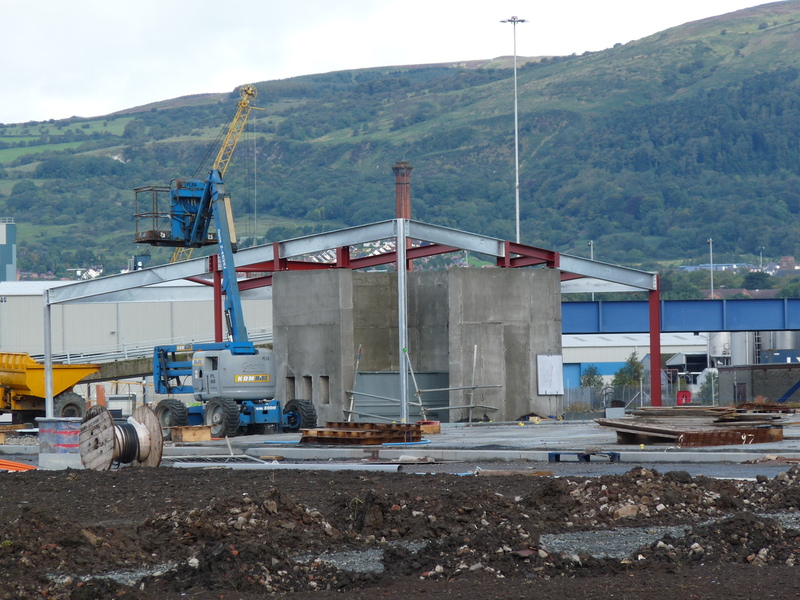 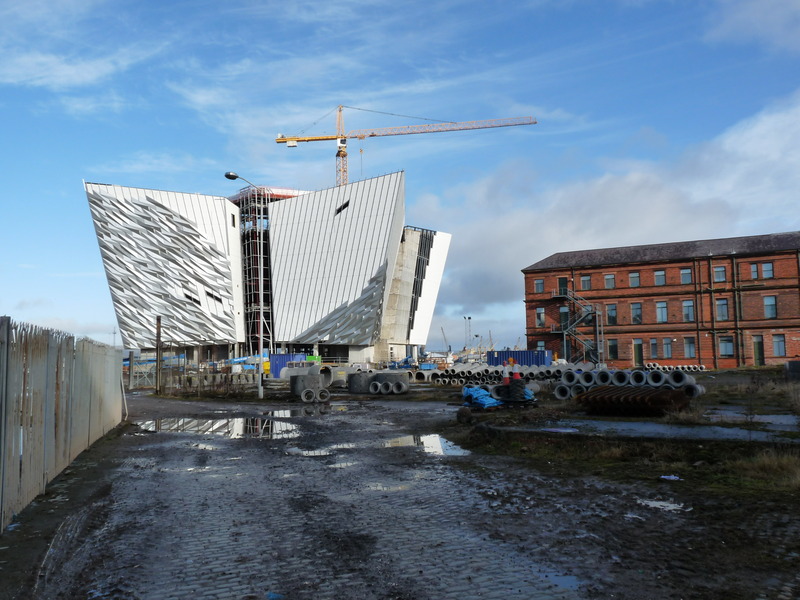 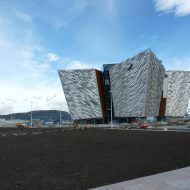 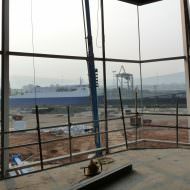 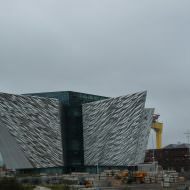 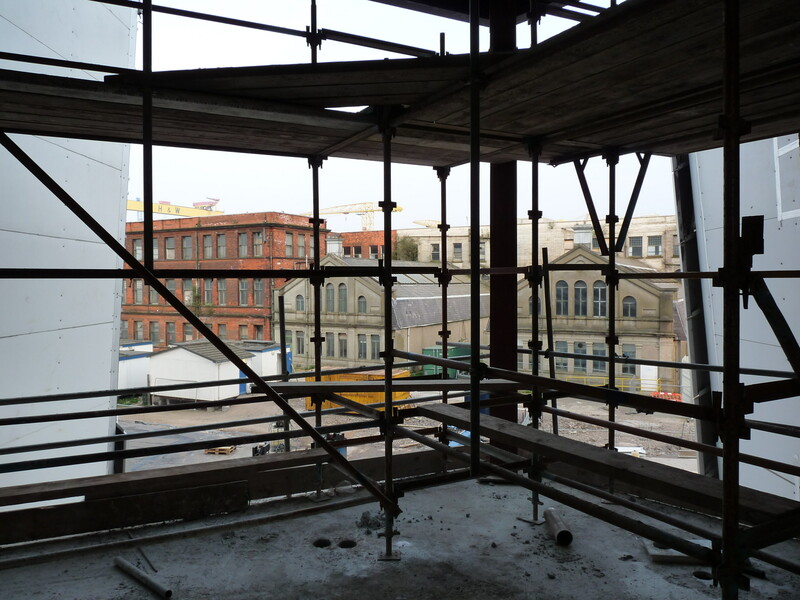 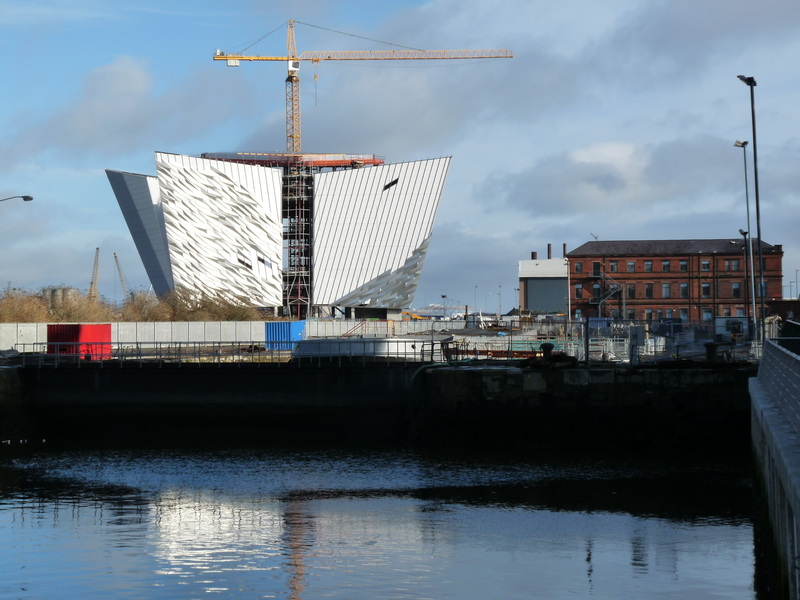 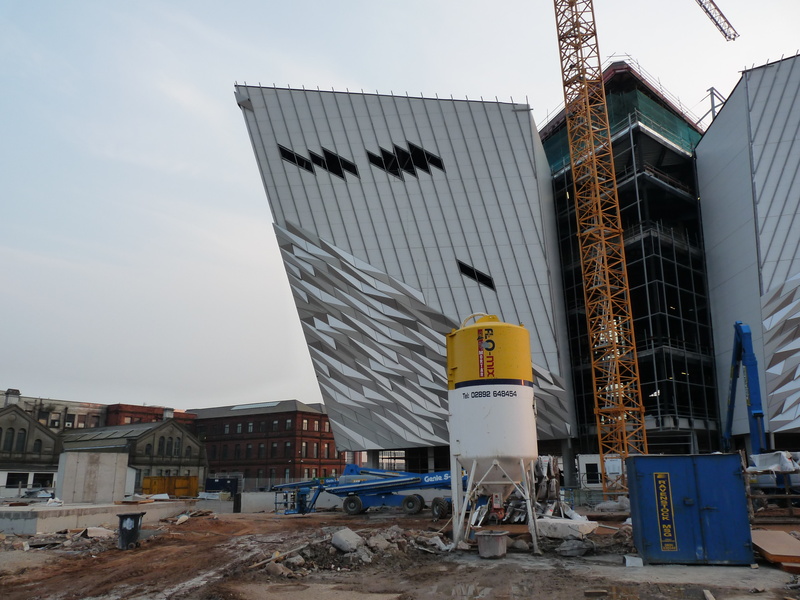 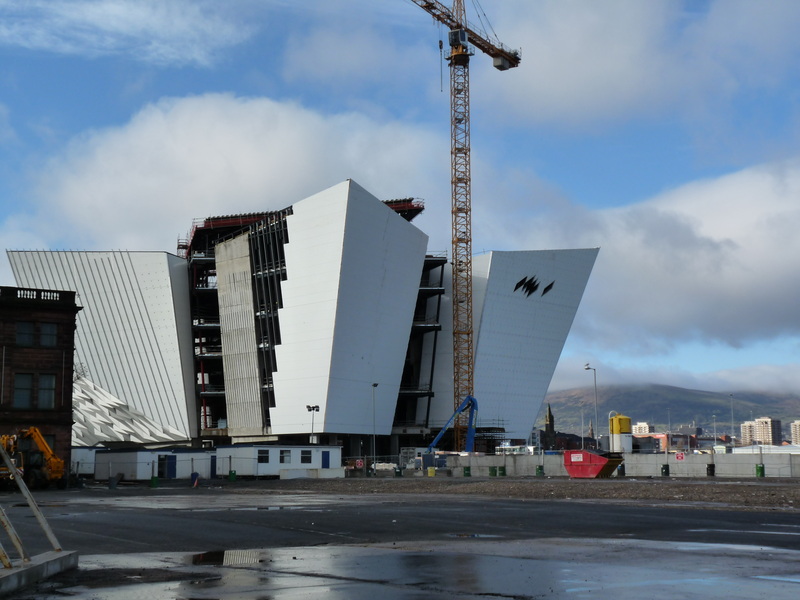 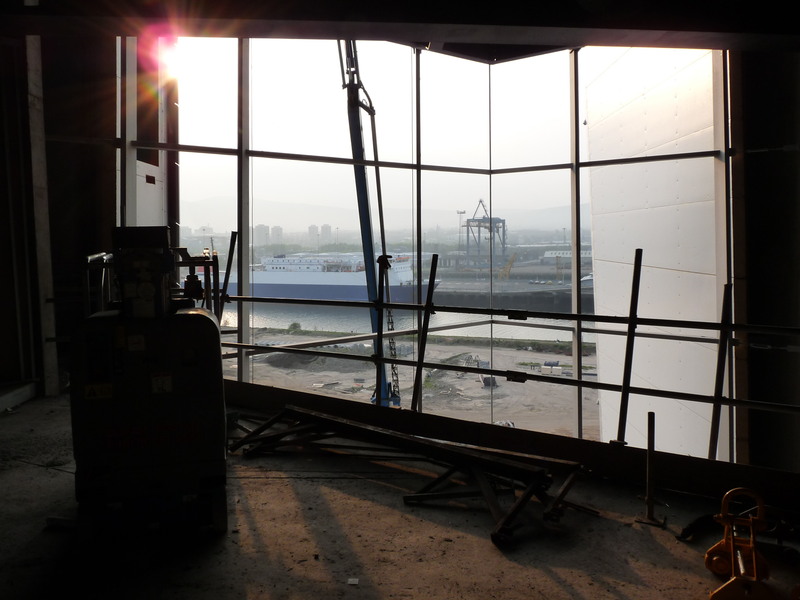 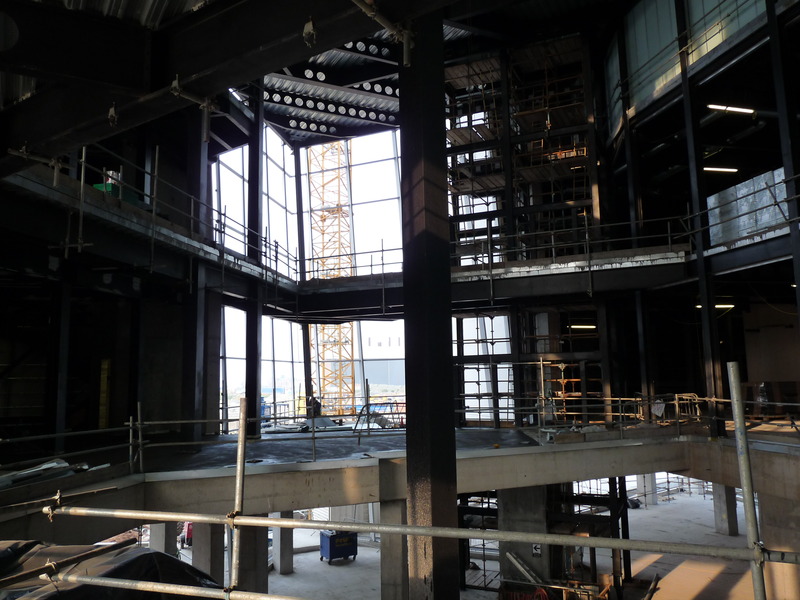 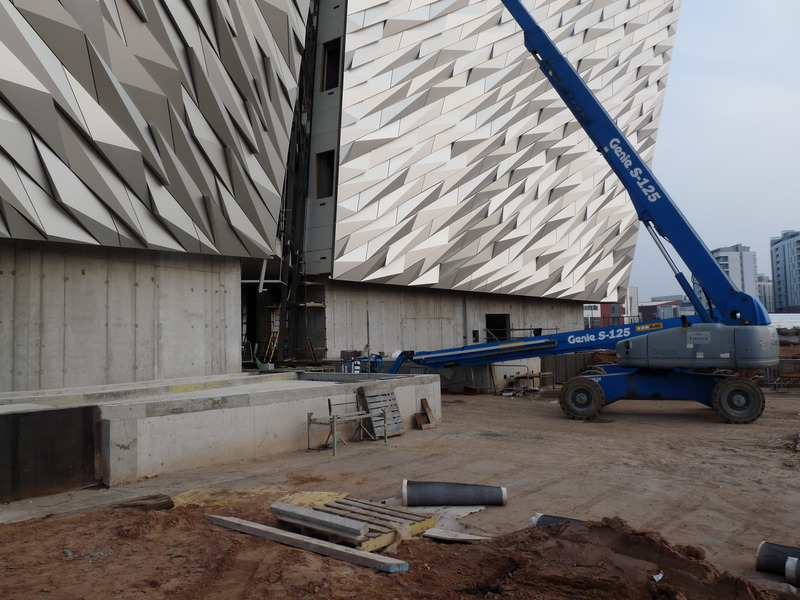 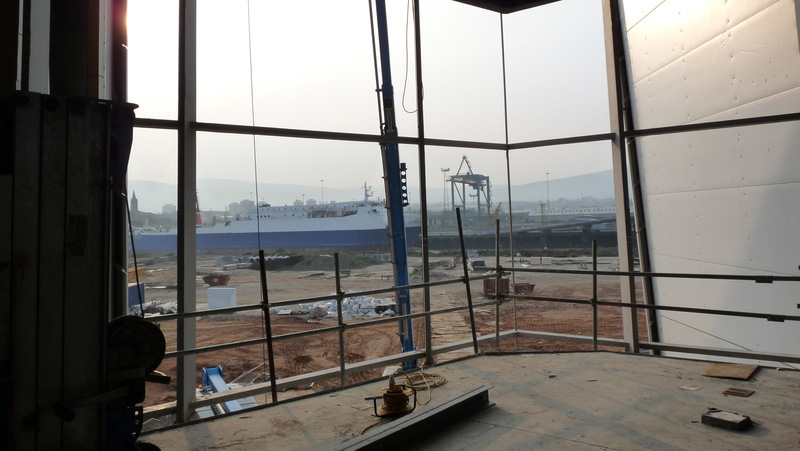 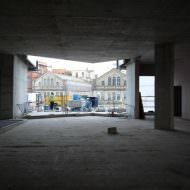 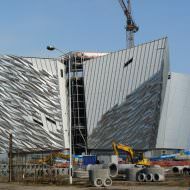 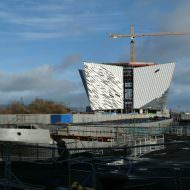 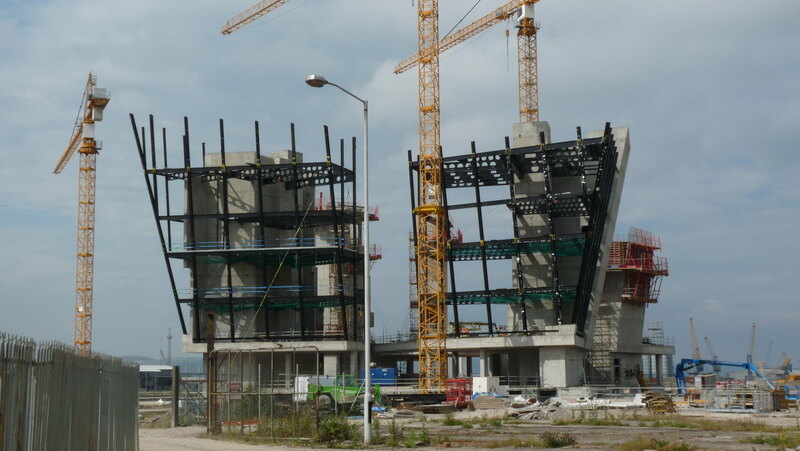 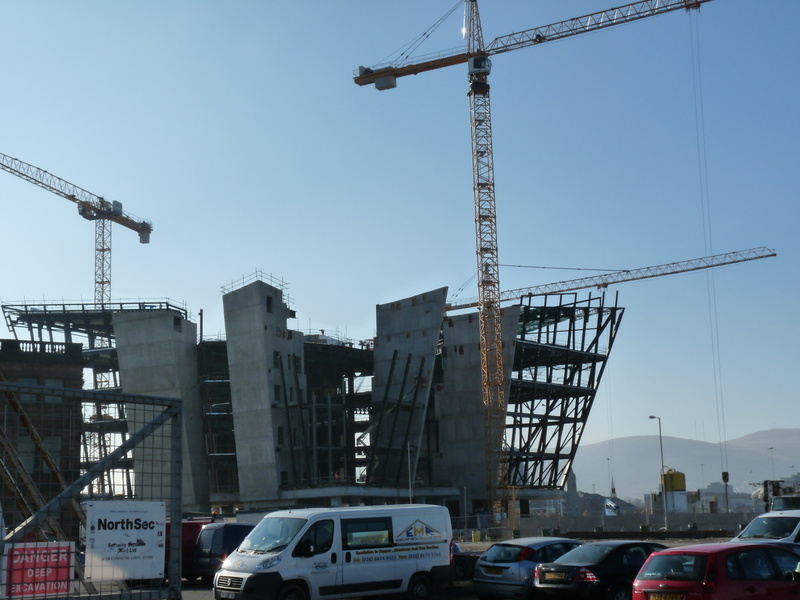 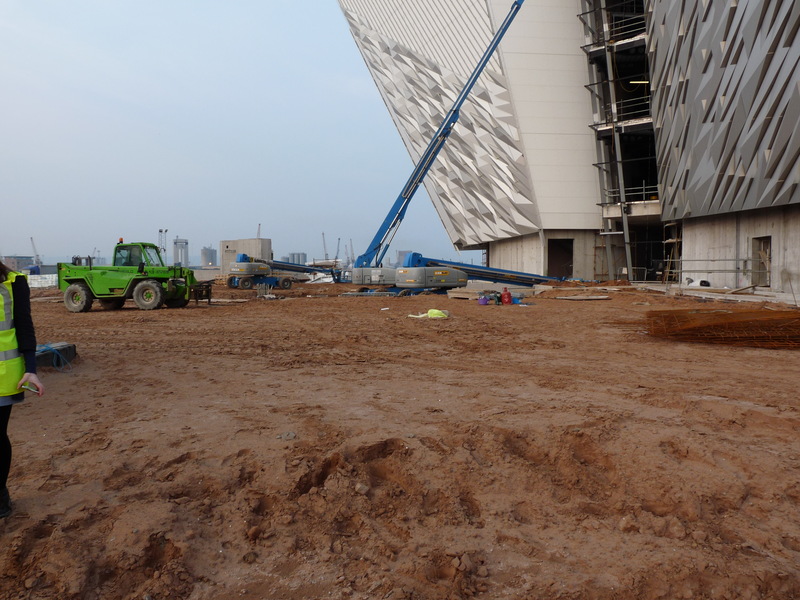 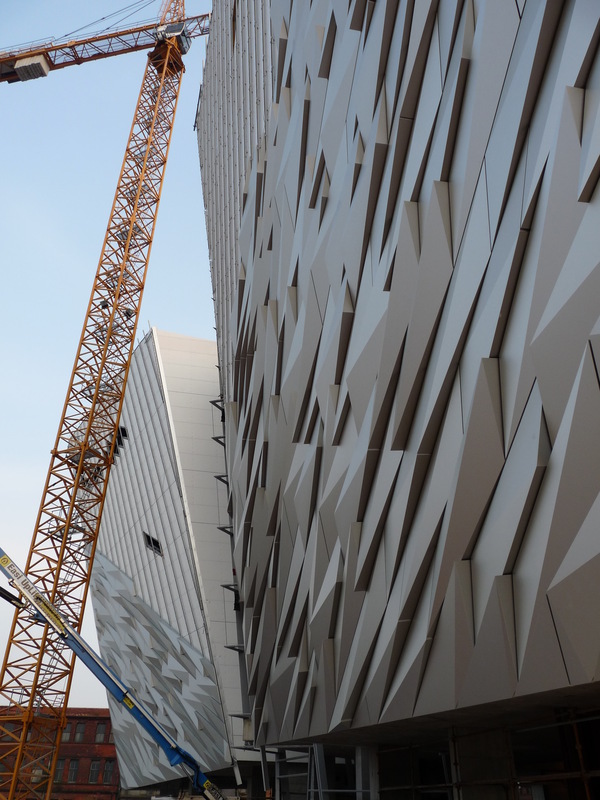 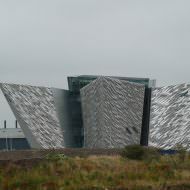 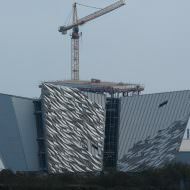 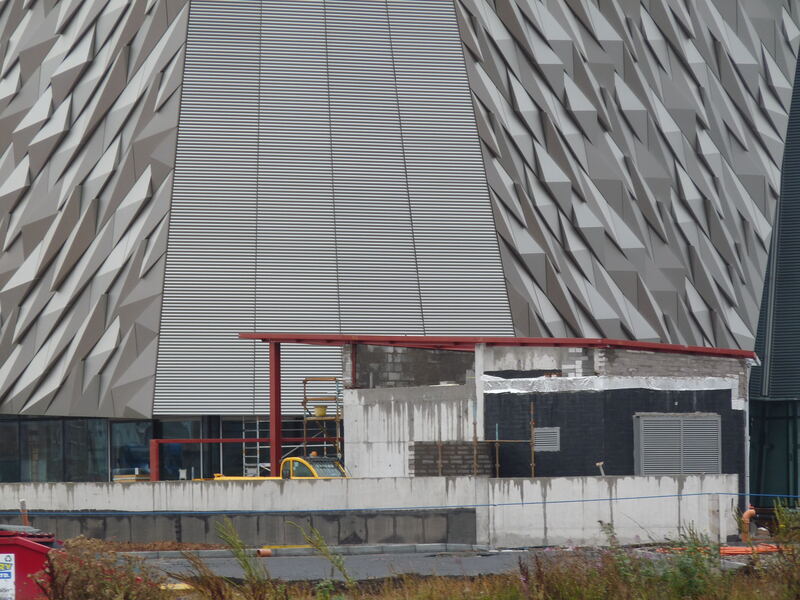 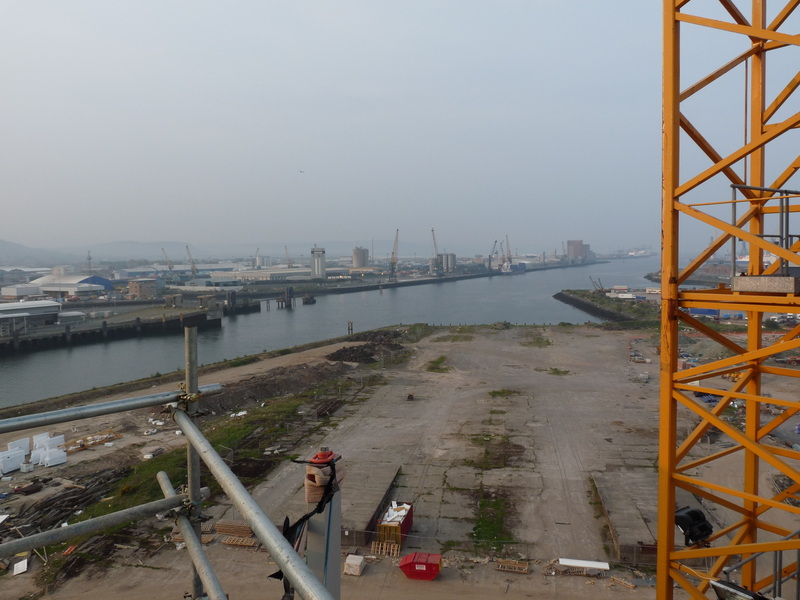 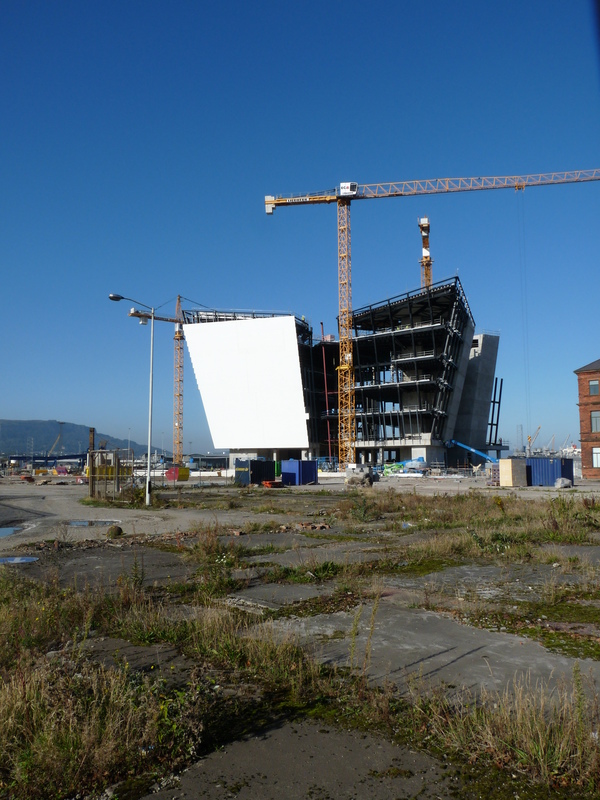 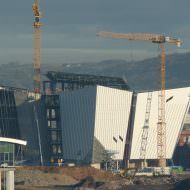 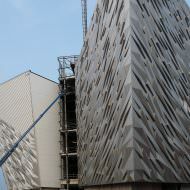 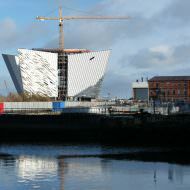 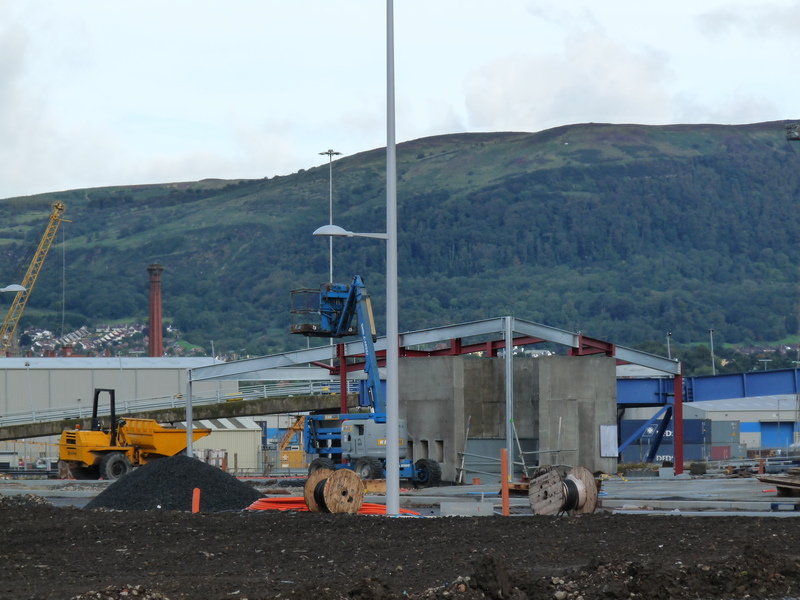 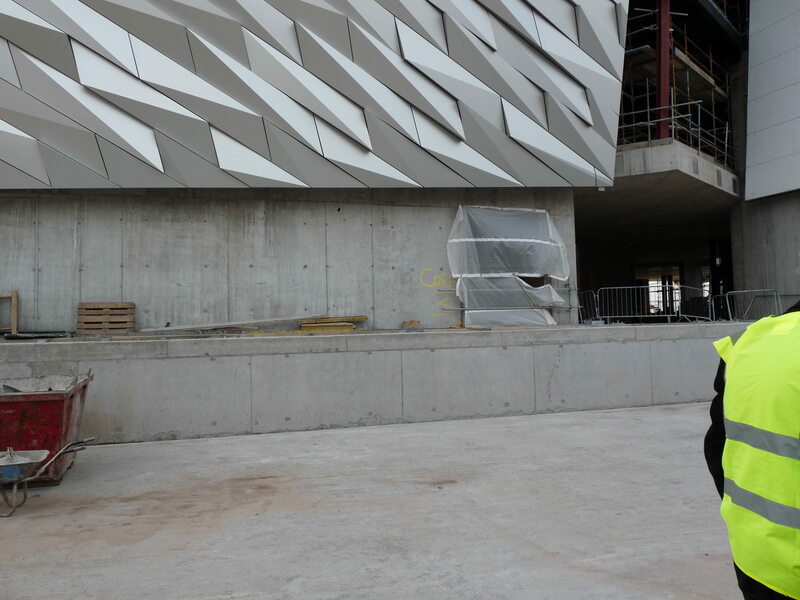 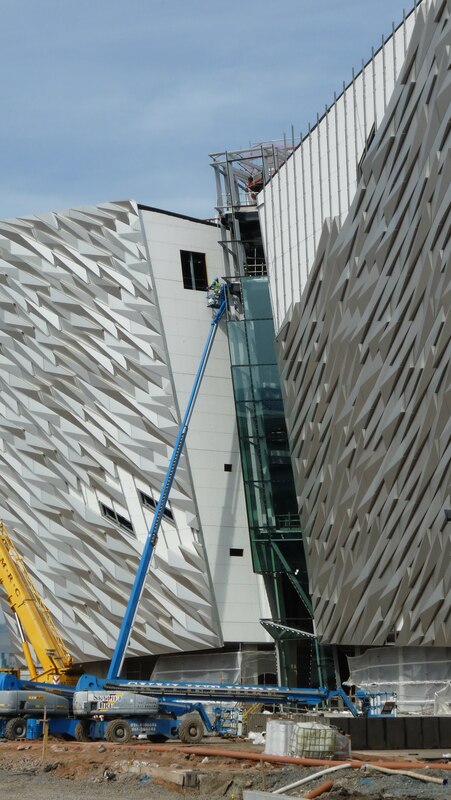 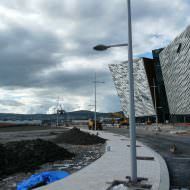 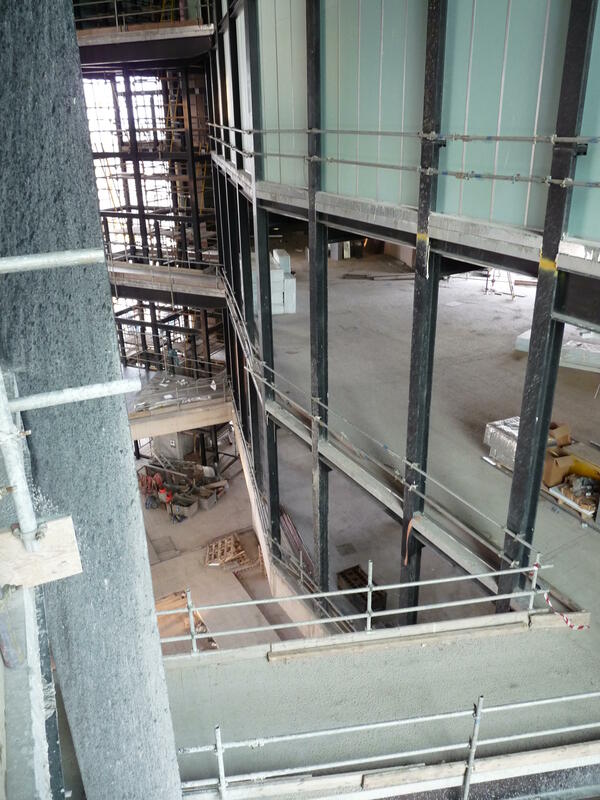 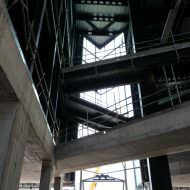 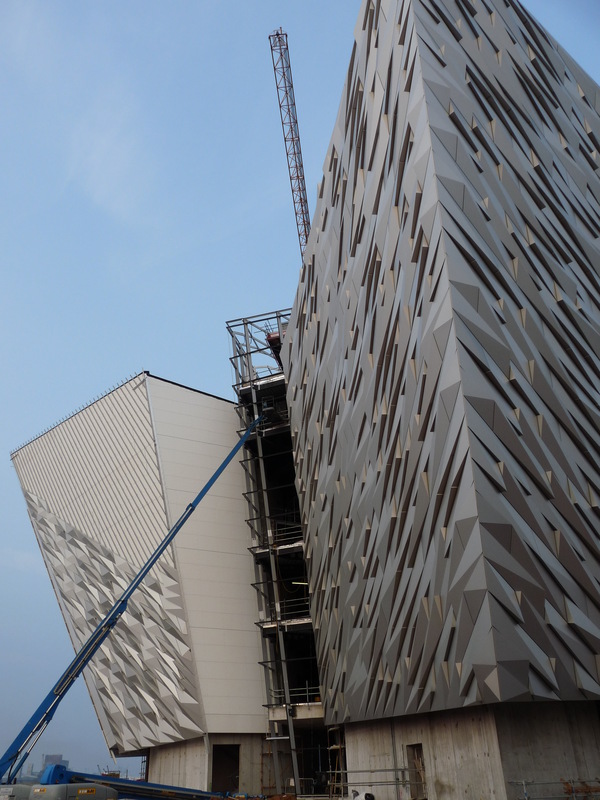 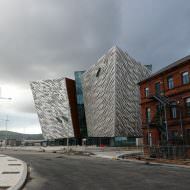 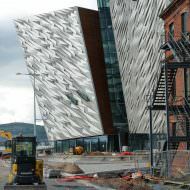 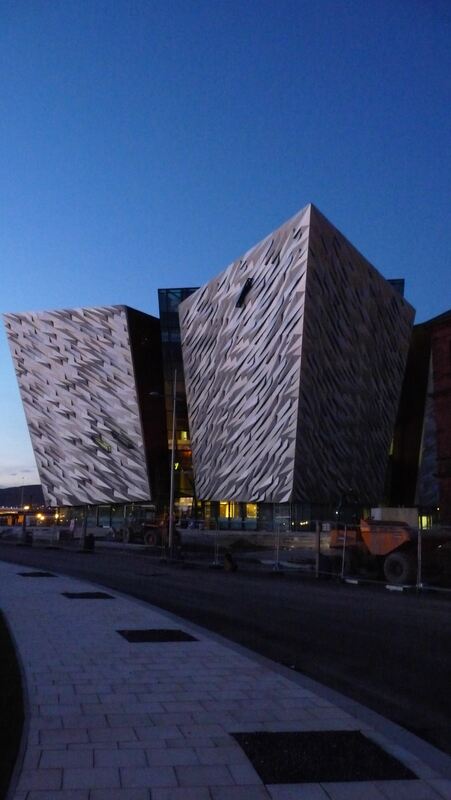 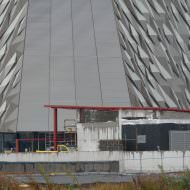 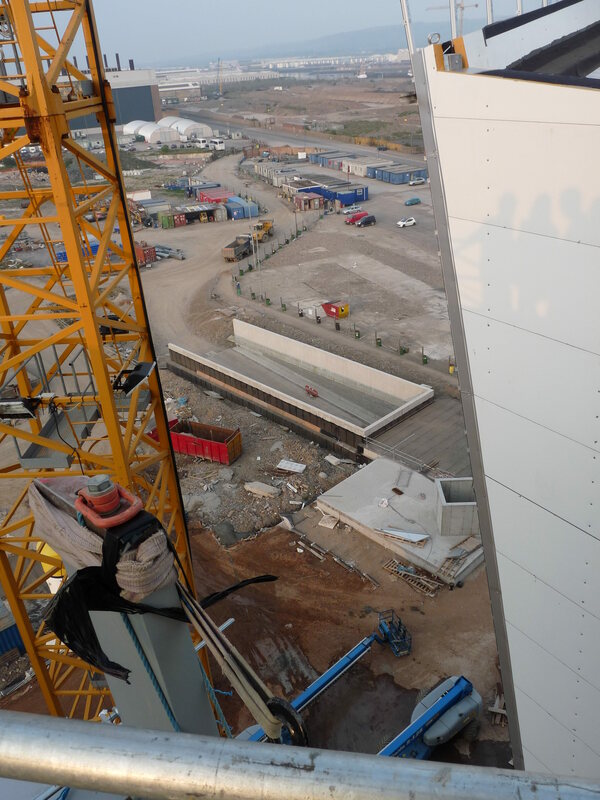 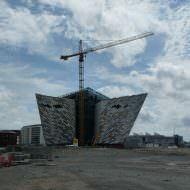 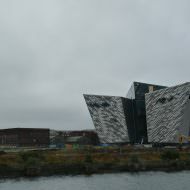 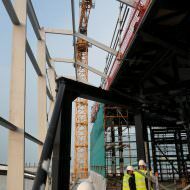 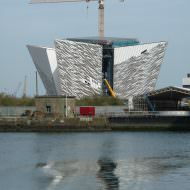 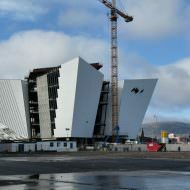 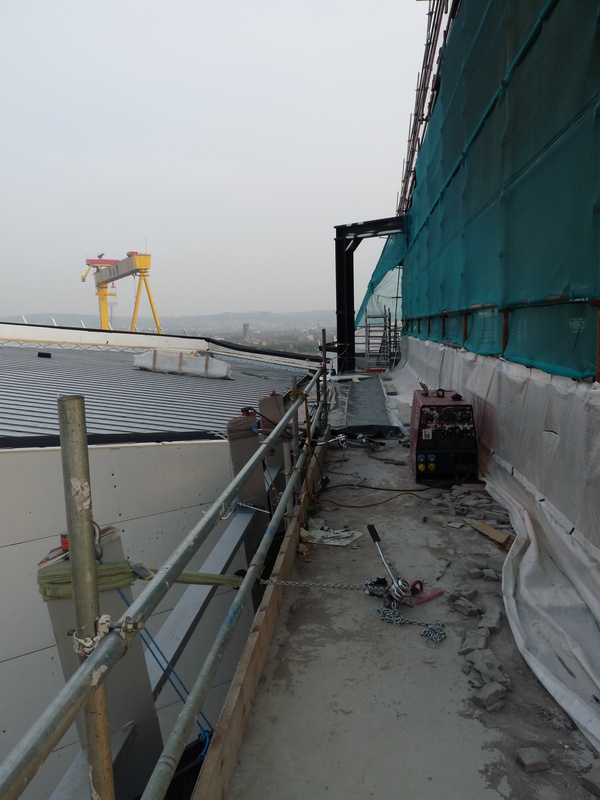 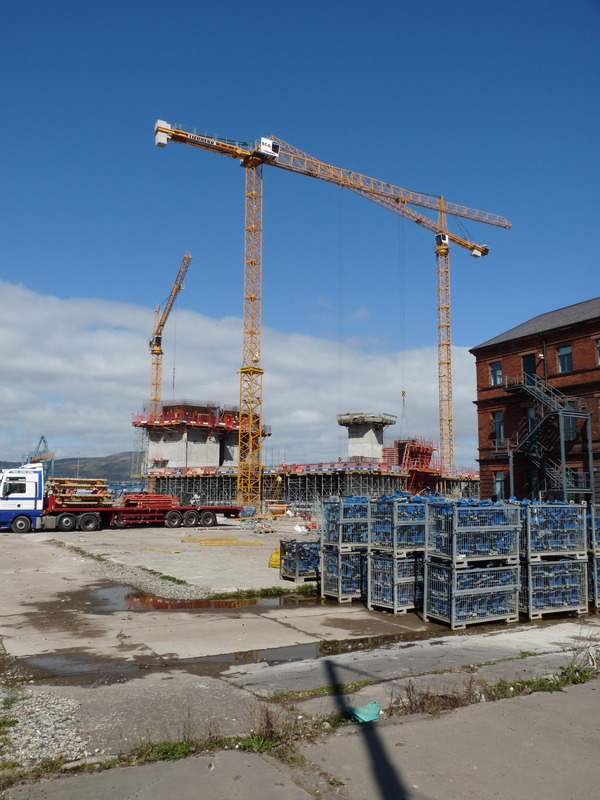 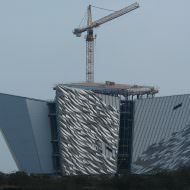 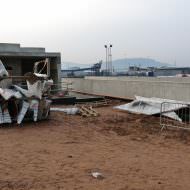 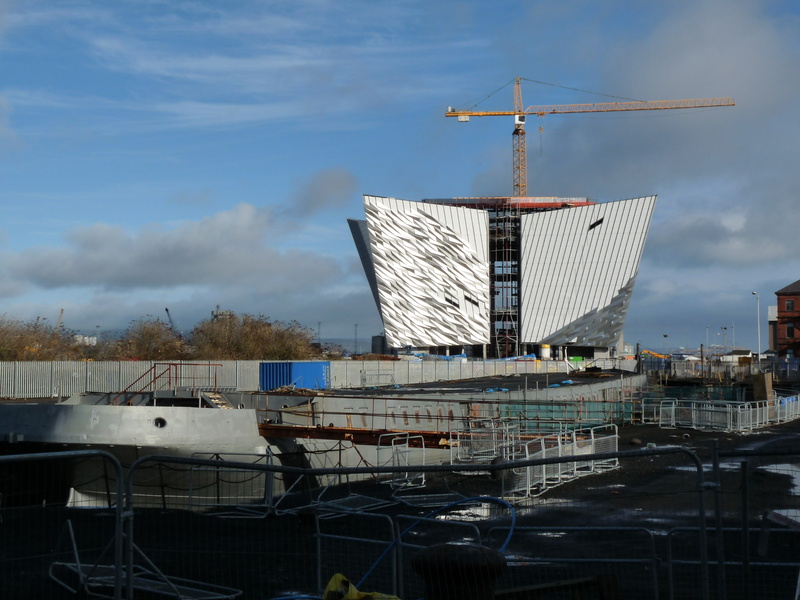 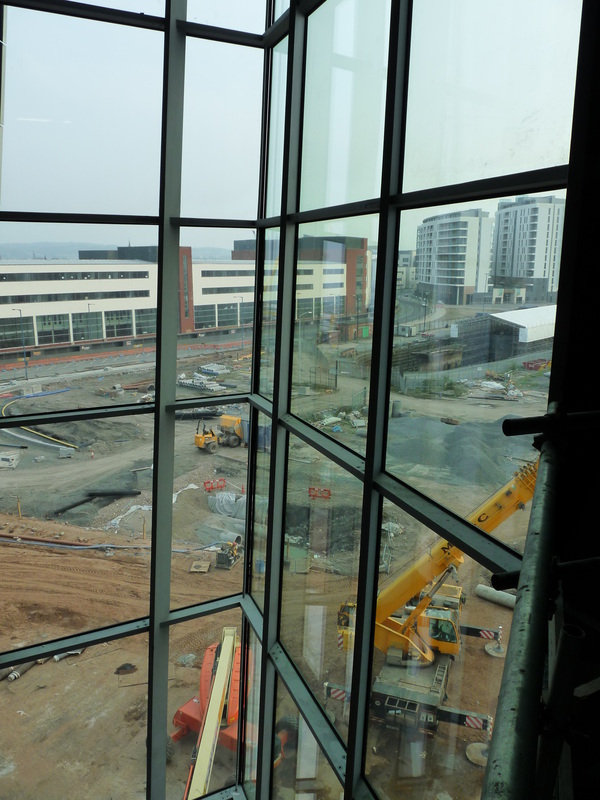 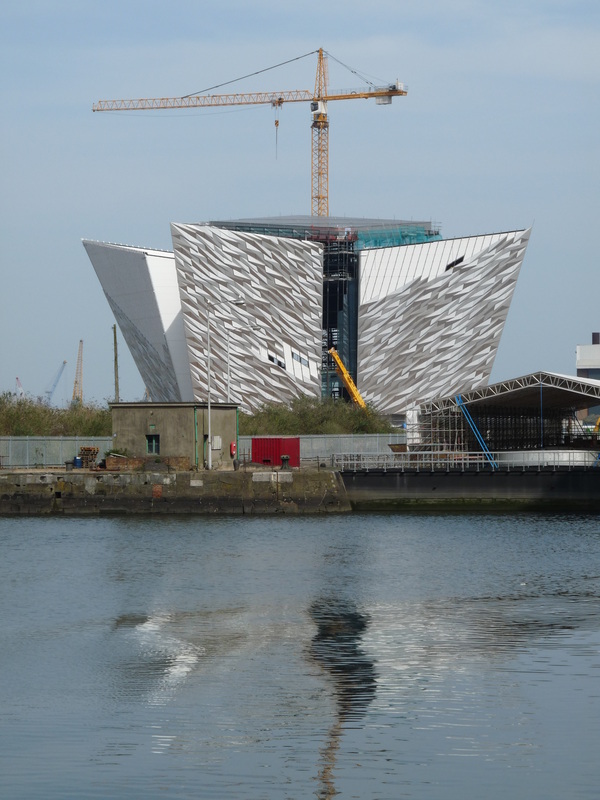 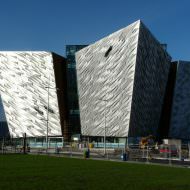 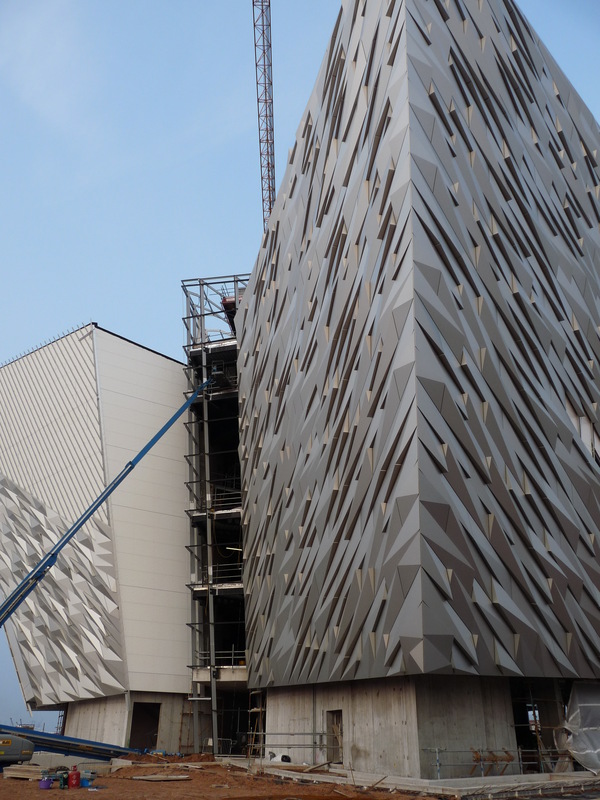 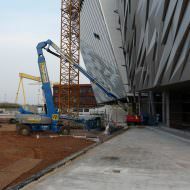 During 2010 the structural steel and concrete frame of the building took shape and in June 2010 Mike Smith of Titanic Quarter Ltd stated that good weather had placed the building one month ahead of schedule. 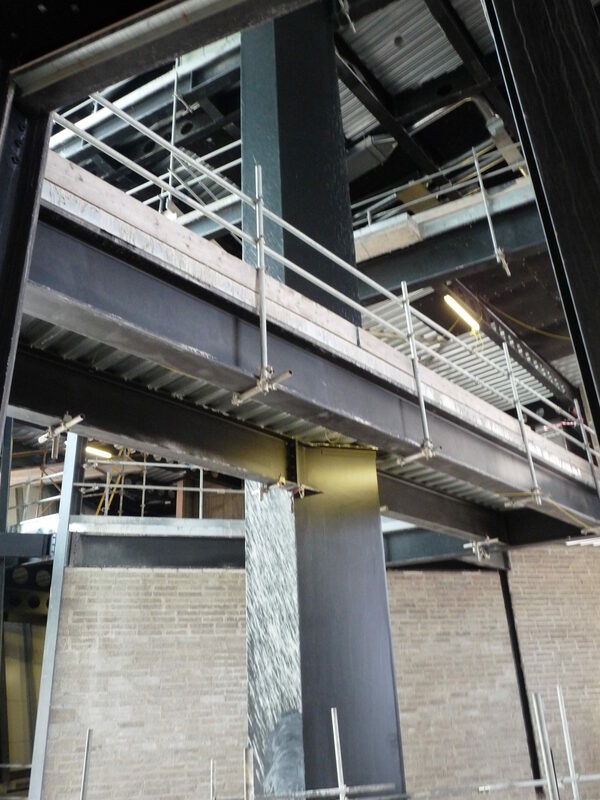 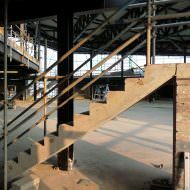 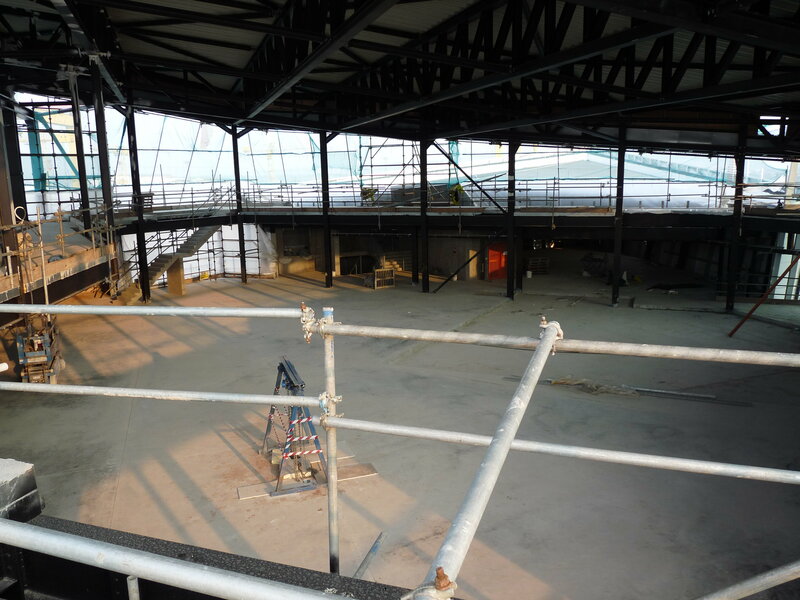 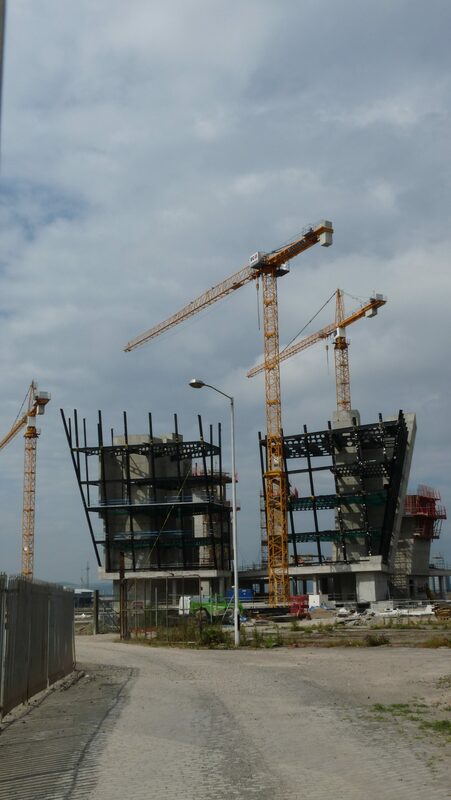 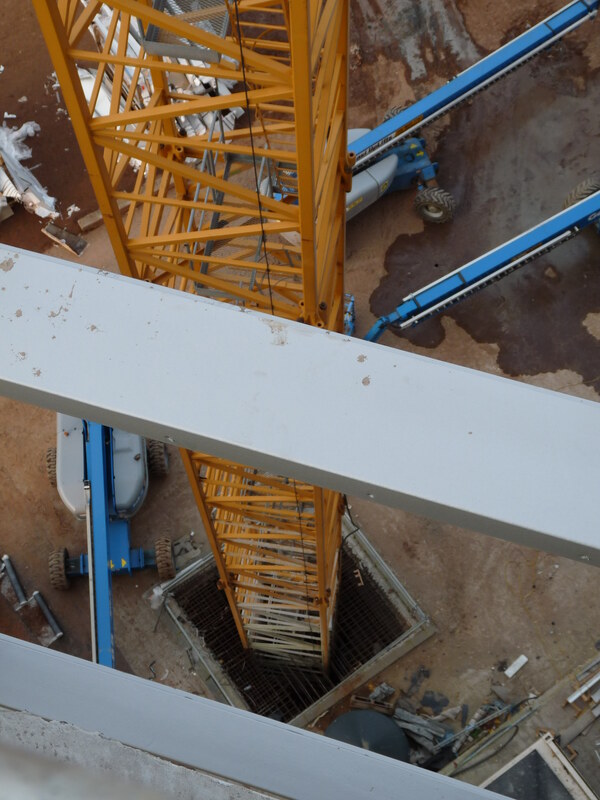 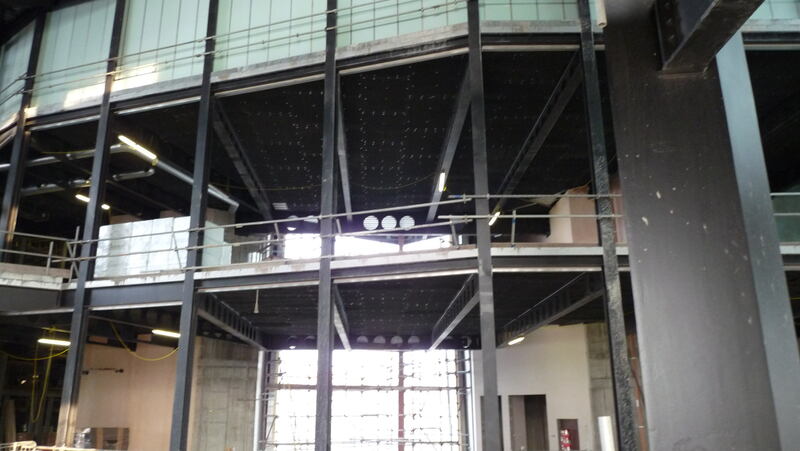 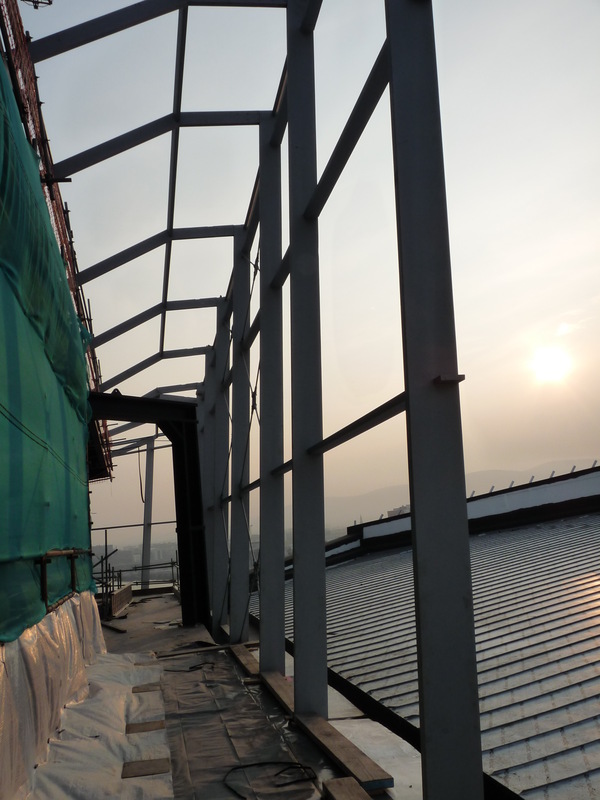 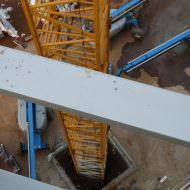 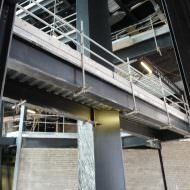 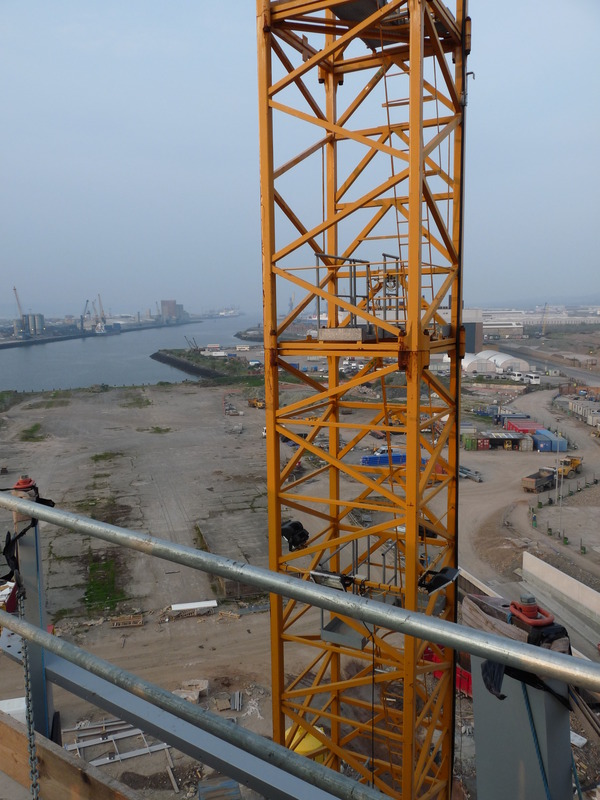 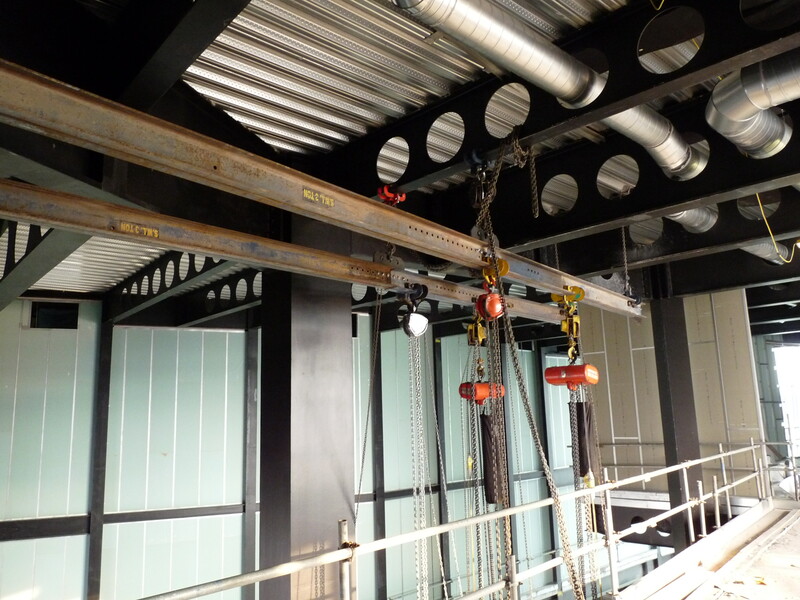 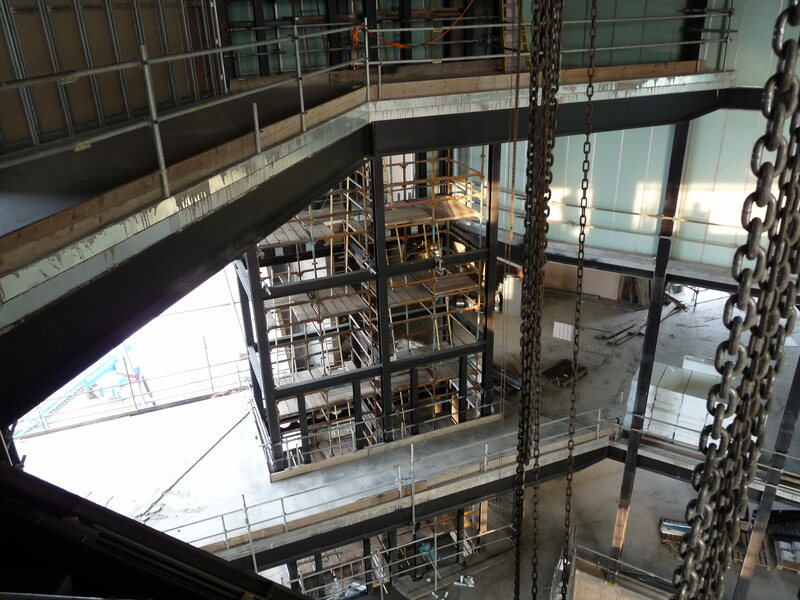 Over 1500 tonnes of structural steelwork was provided and erected by Fisher Engineering during a site programme of 35 weeks that was completed in December 2010. 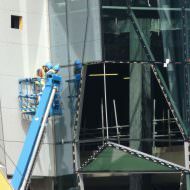 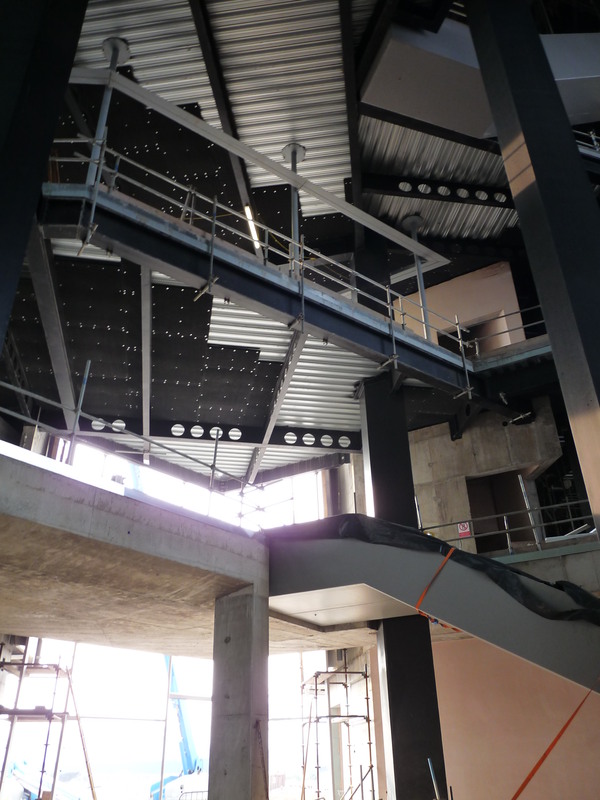 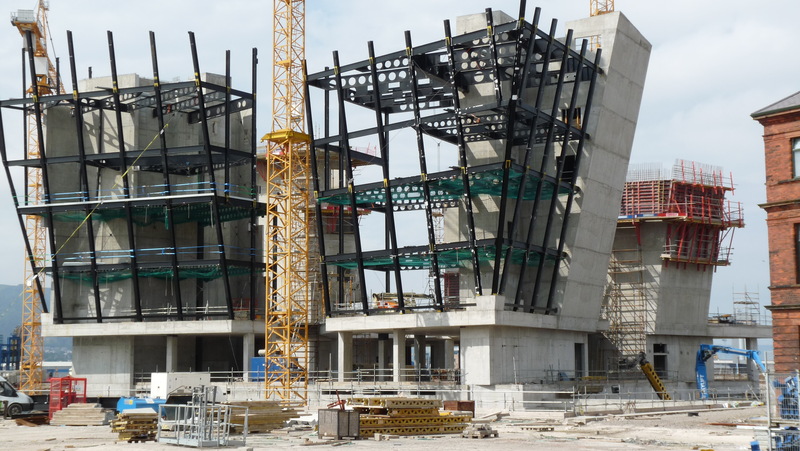 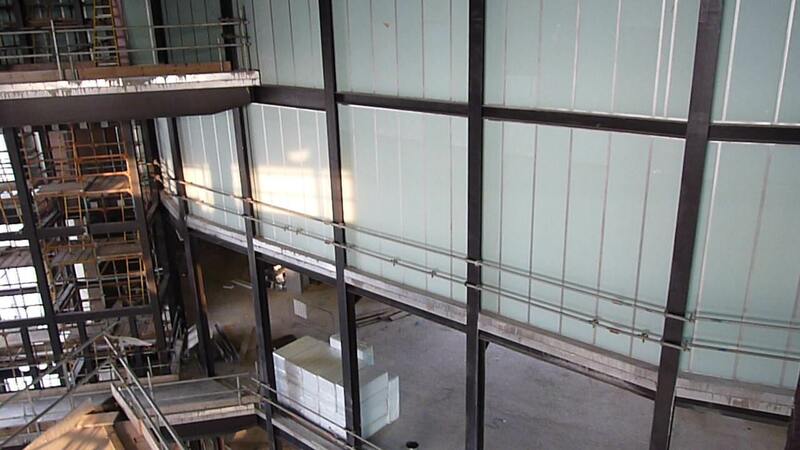 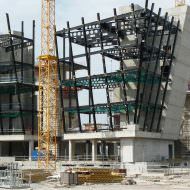 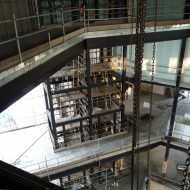 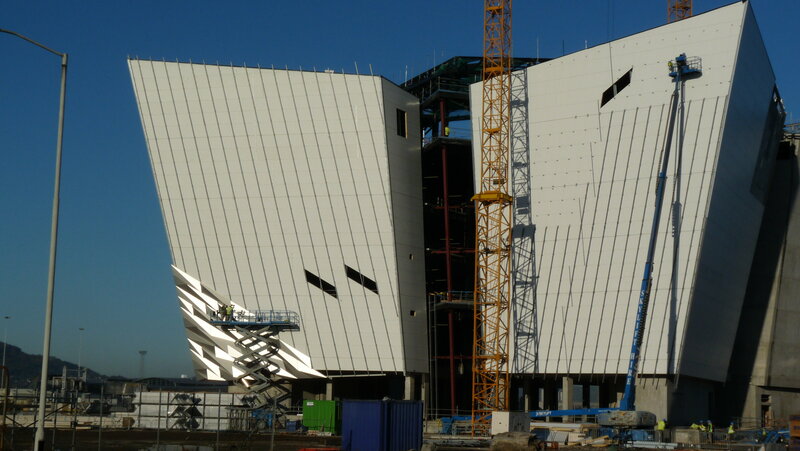 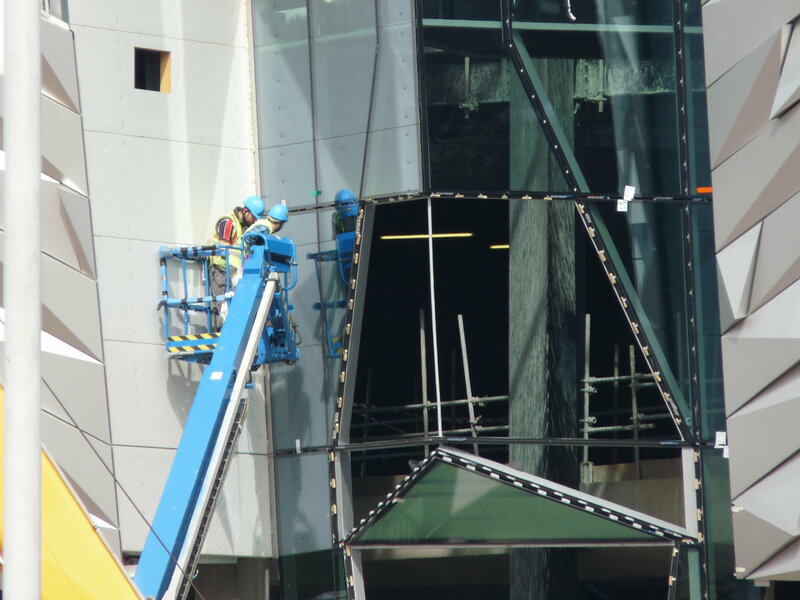 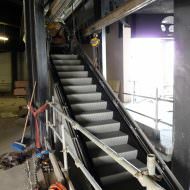 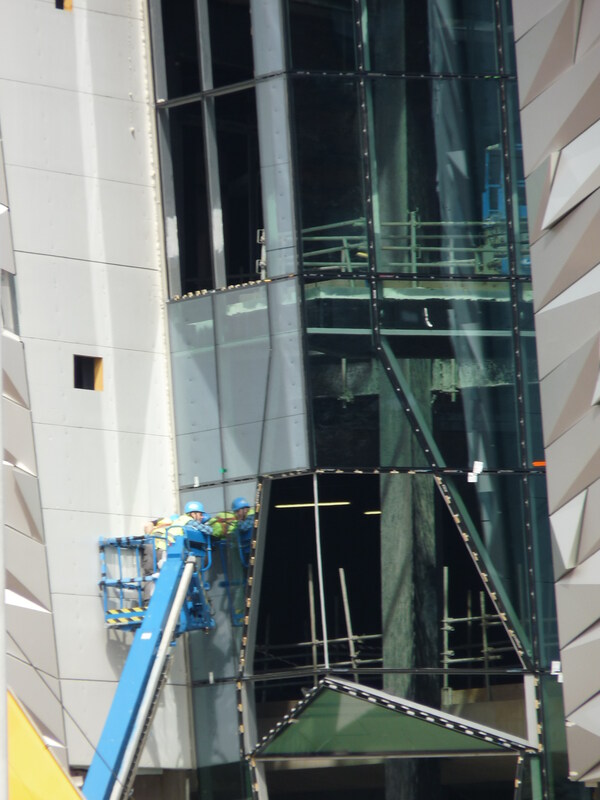 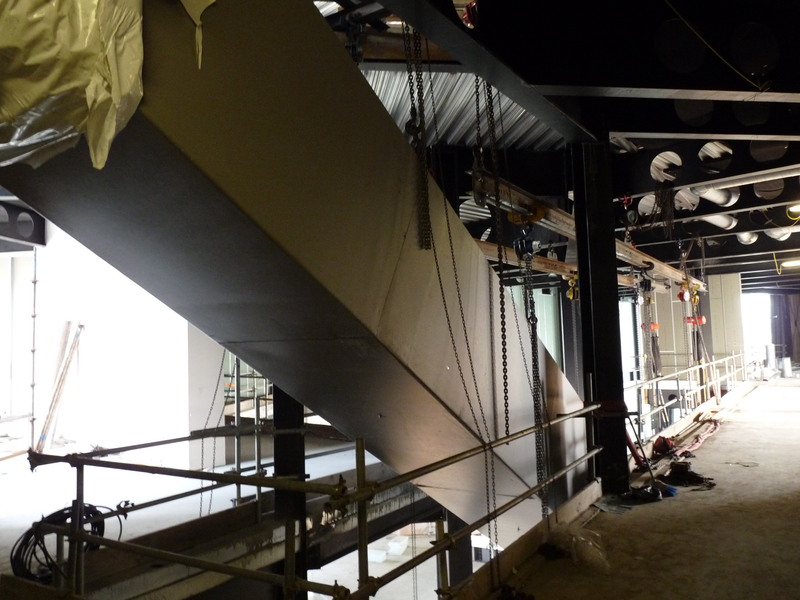 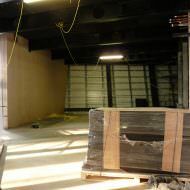 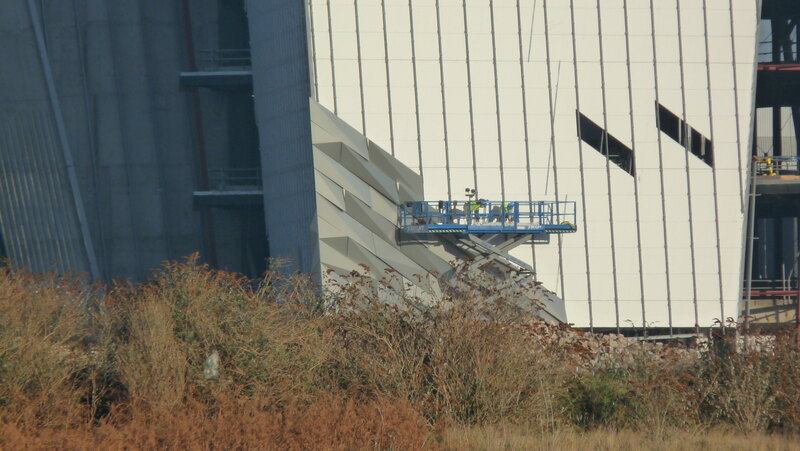 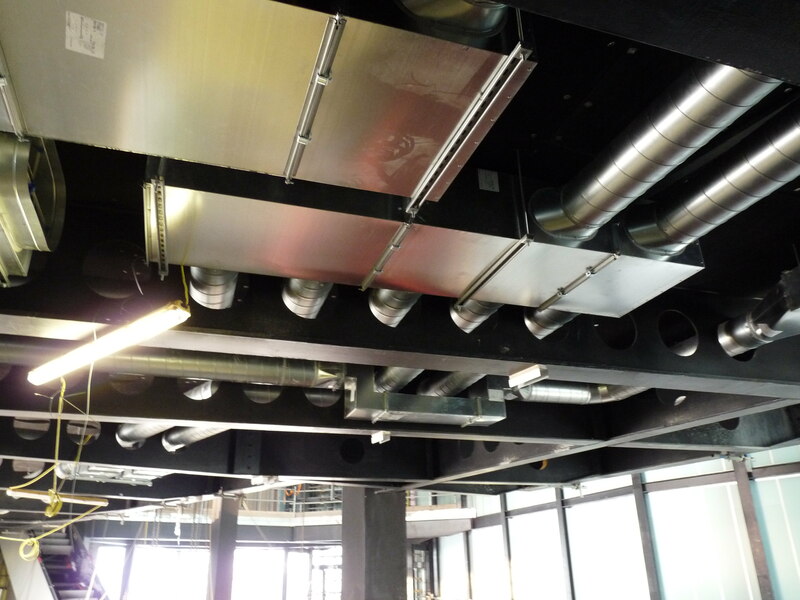 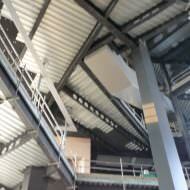 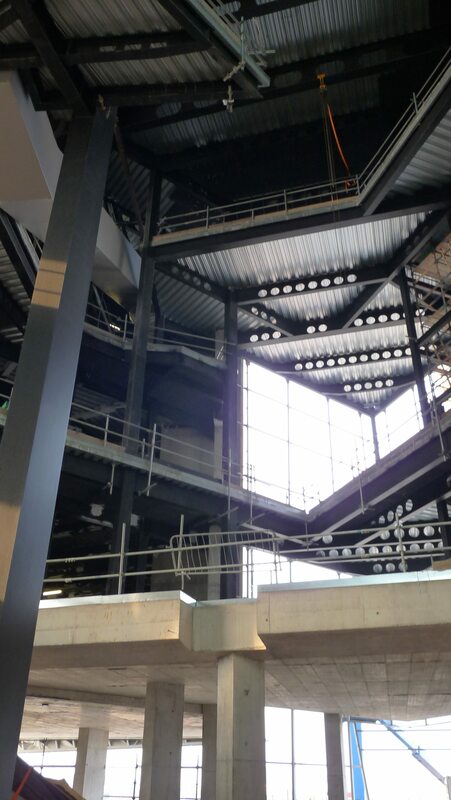 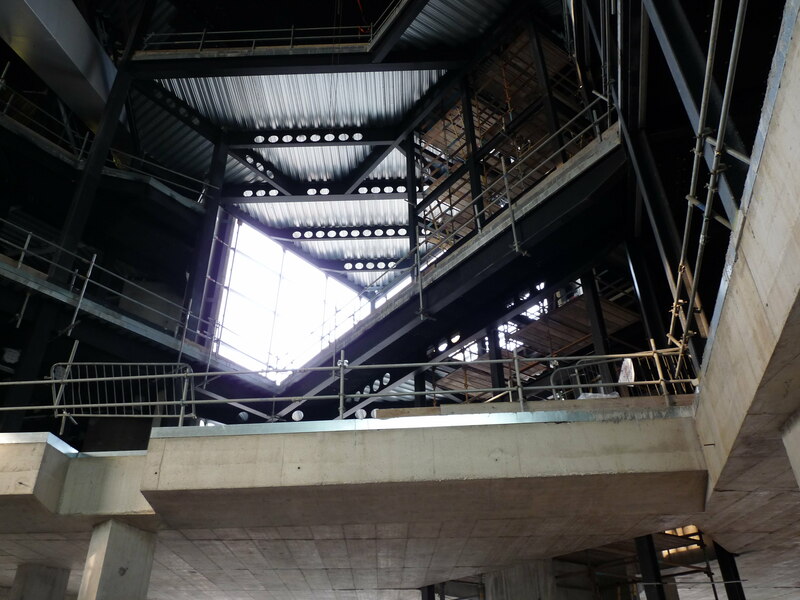 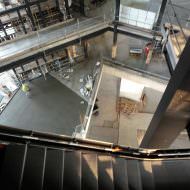 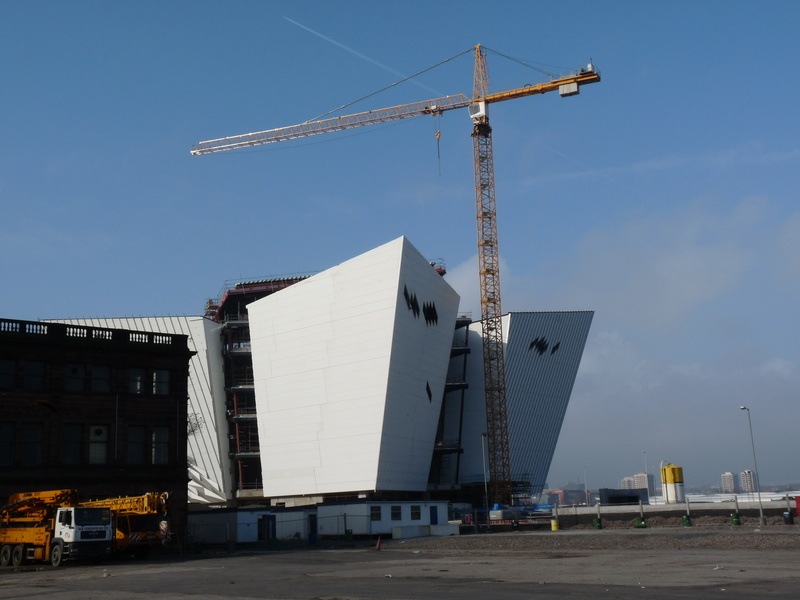 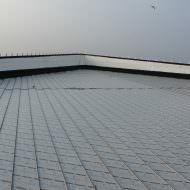 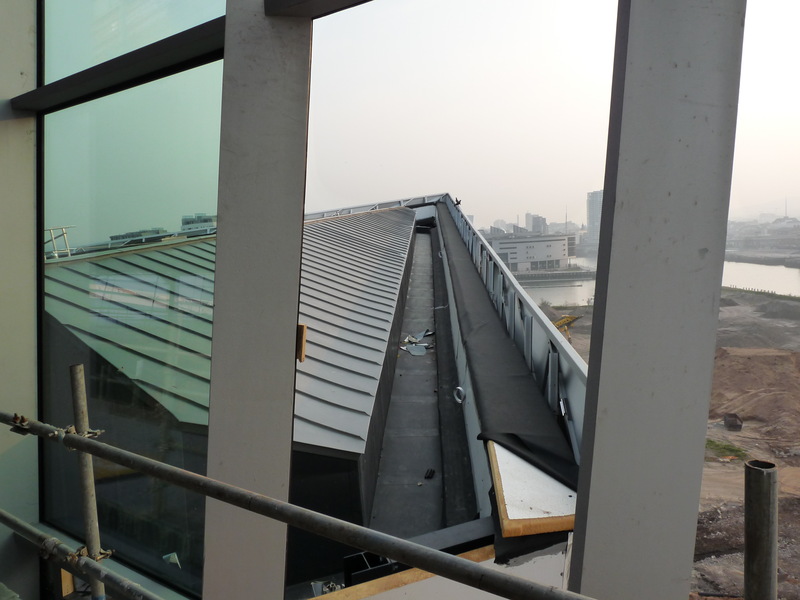 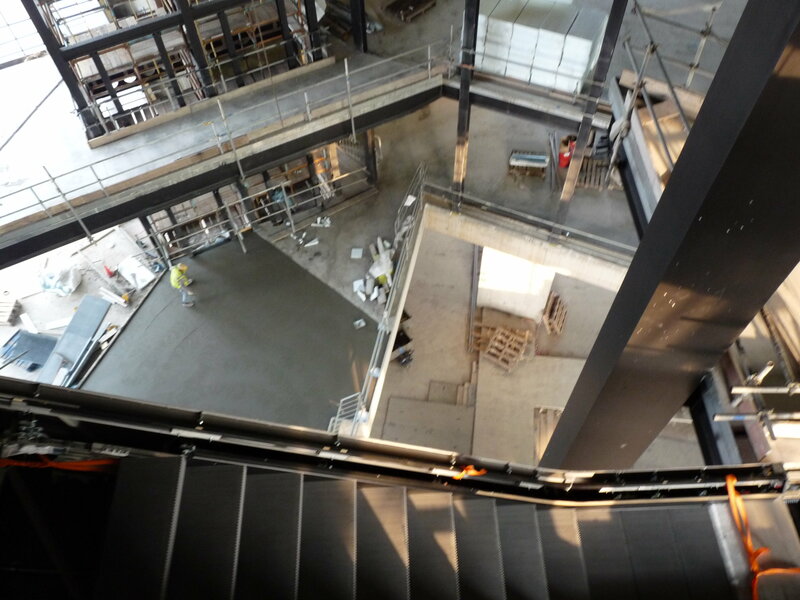 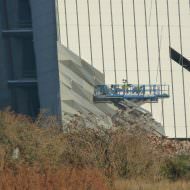 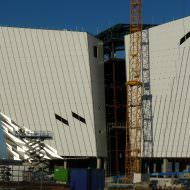 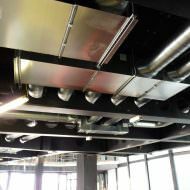 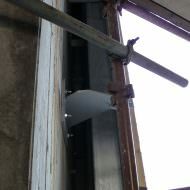 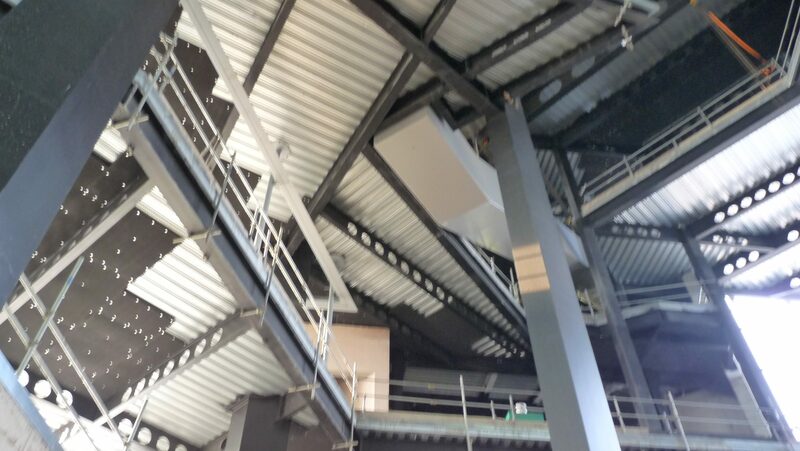 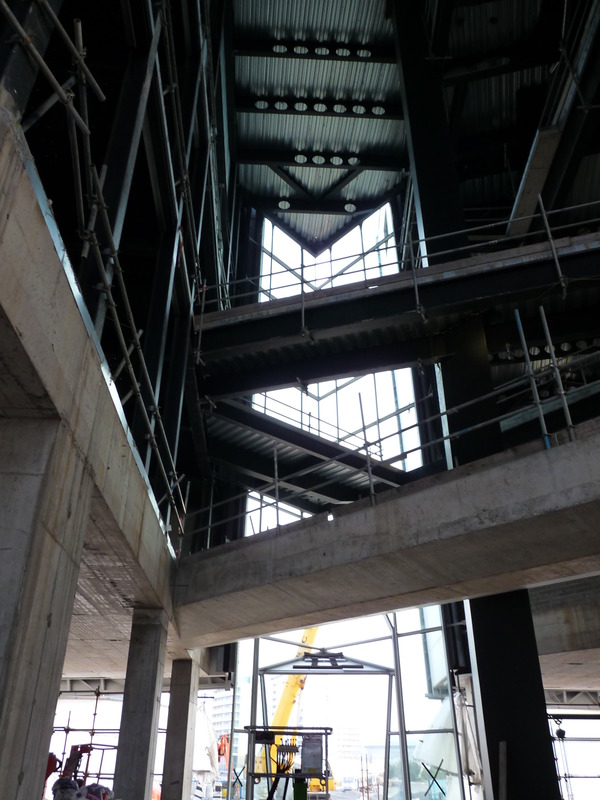 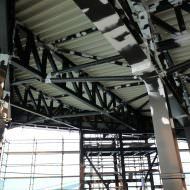 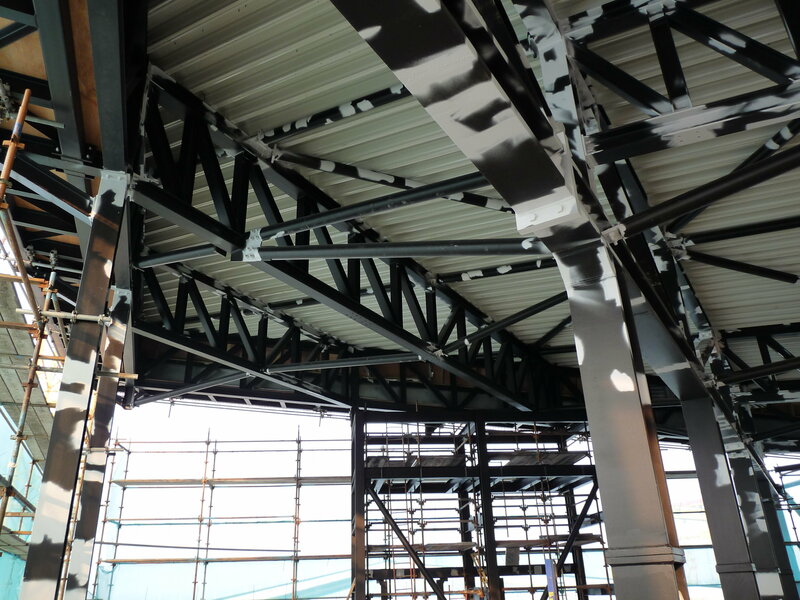 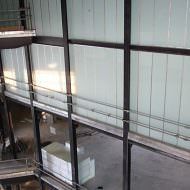 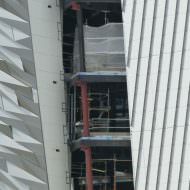 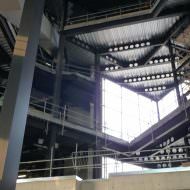 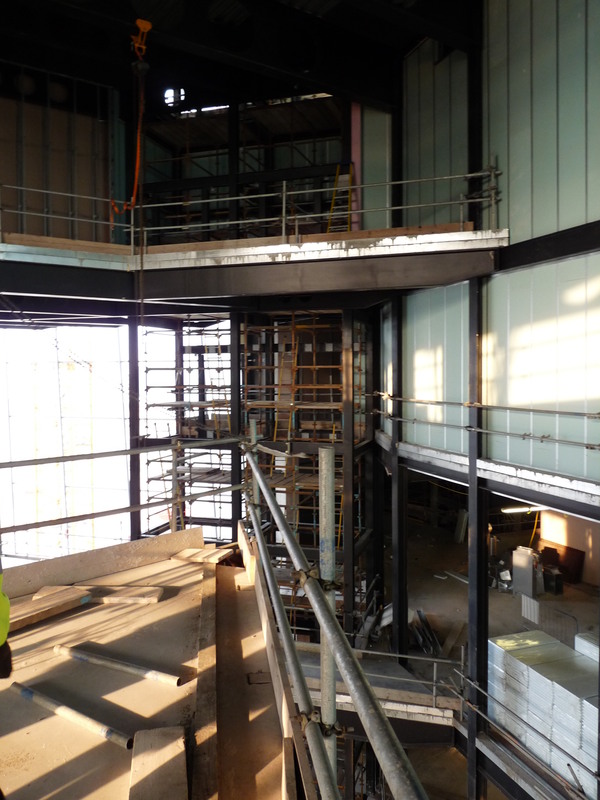 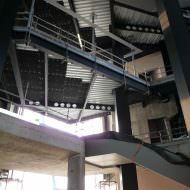 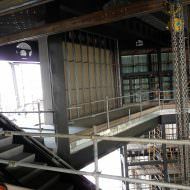 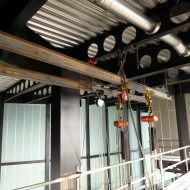 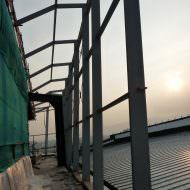 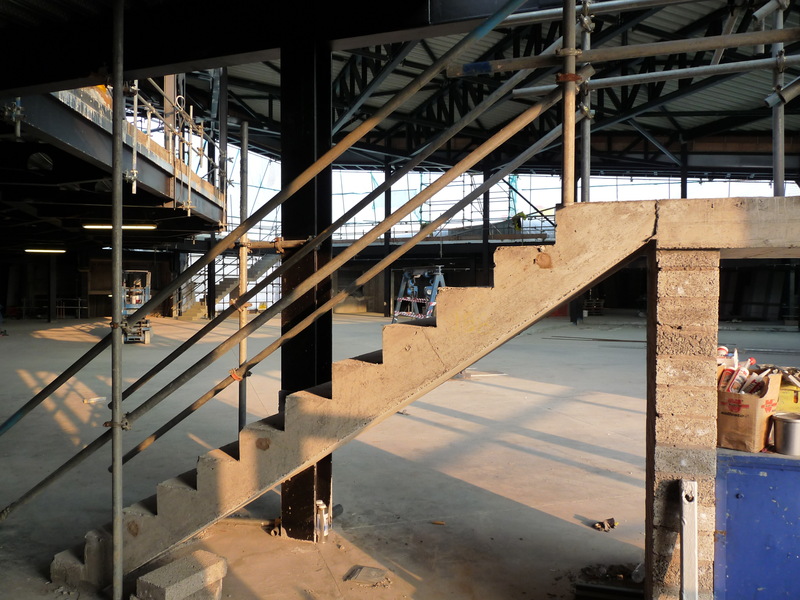 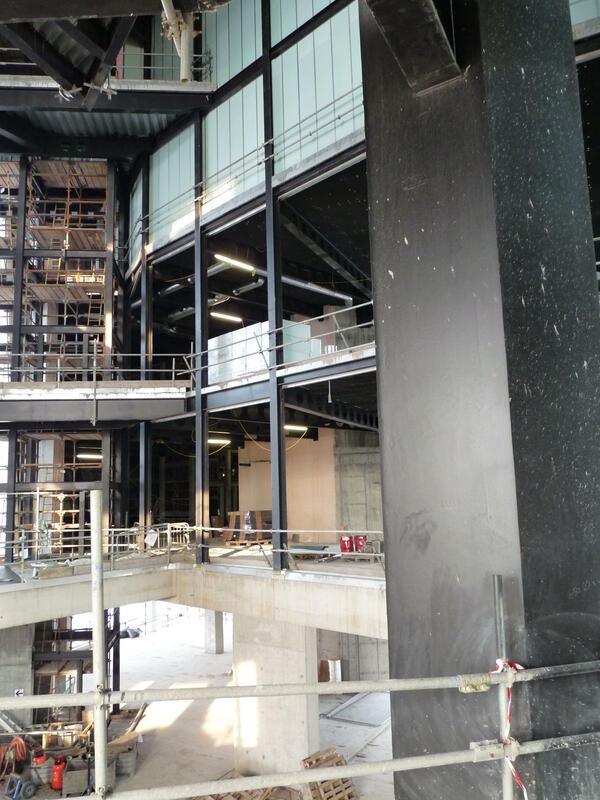 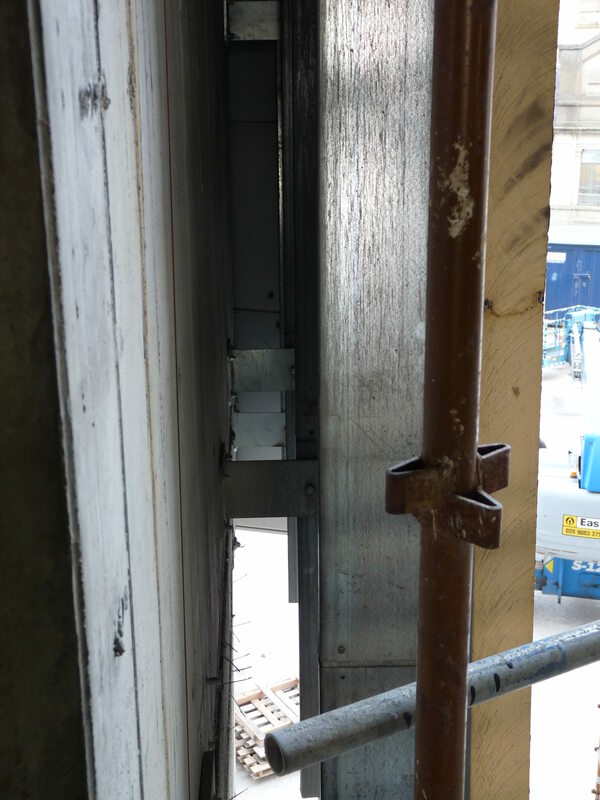 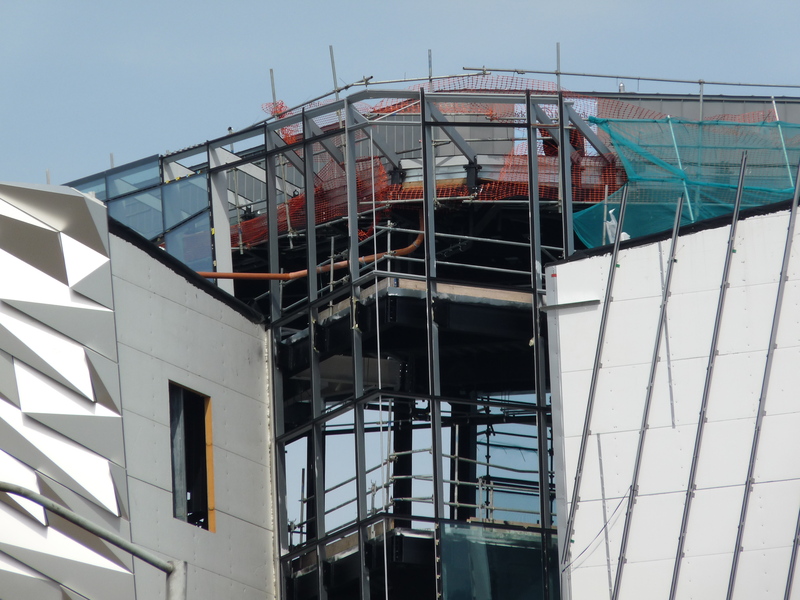 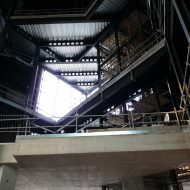 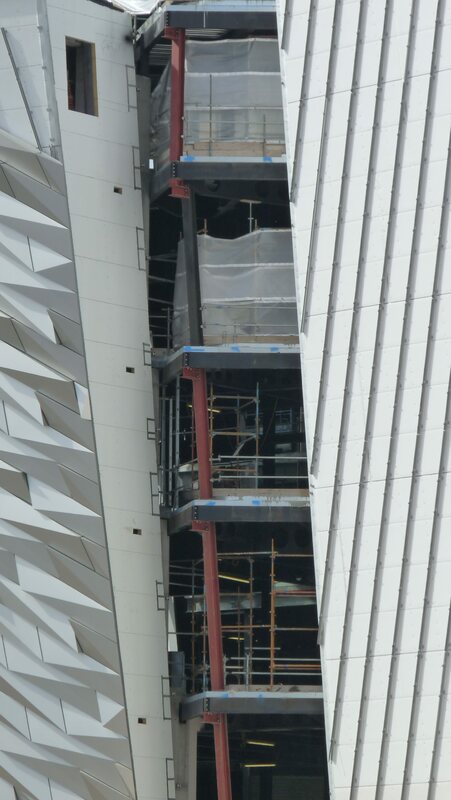 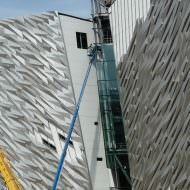 By the end of 2010 mechanical and electrical elements were being installed and the building was almost entirely clad in the first layer of material with the first of the faceted, three-dimensional zinc plates being installed. 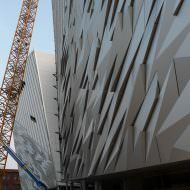 The façade was clad in 3000 three-dimensional aluminium panels, 2000 of which are completely unique in form, whilst none of the other 1000 panels repeat more than twenty times. 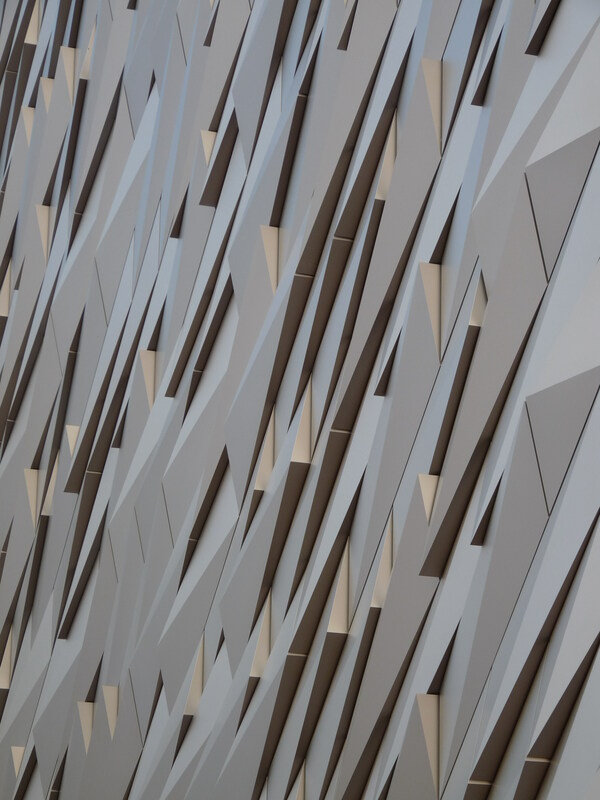 Spanwell worked with the German façade contractor Metalbau Freuh on the £1.5m façade. 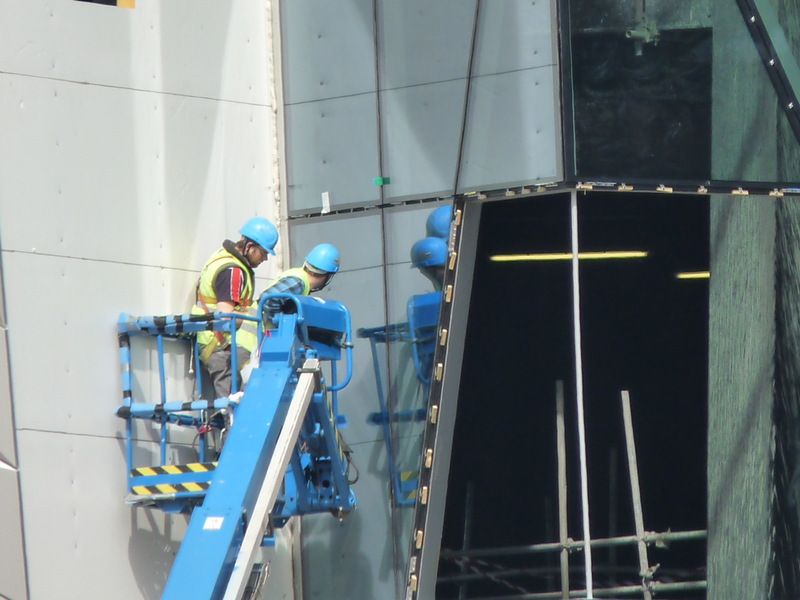 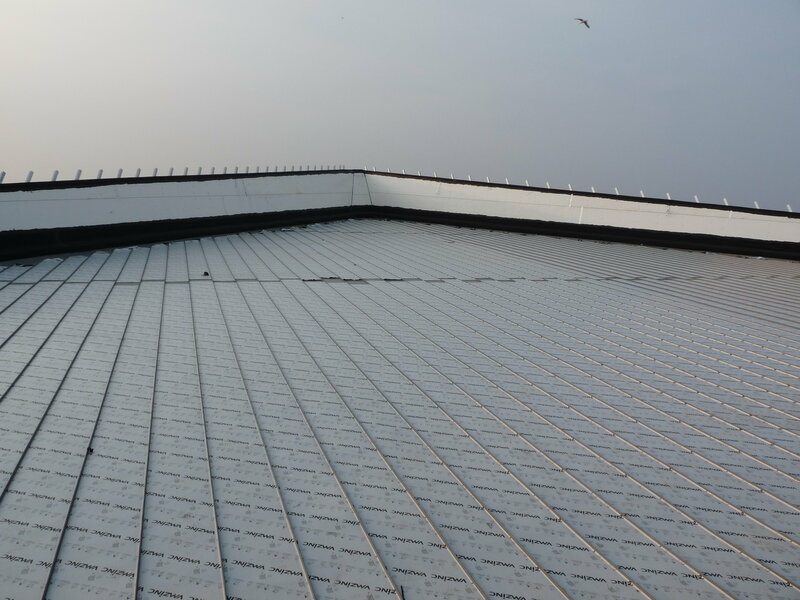 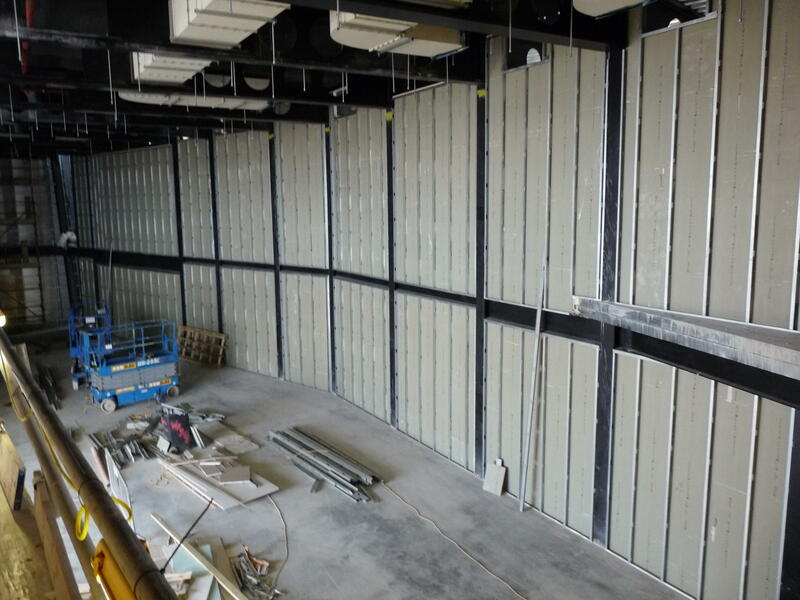 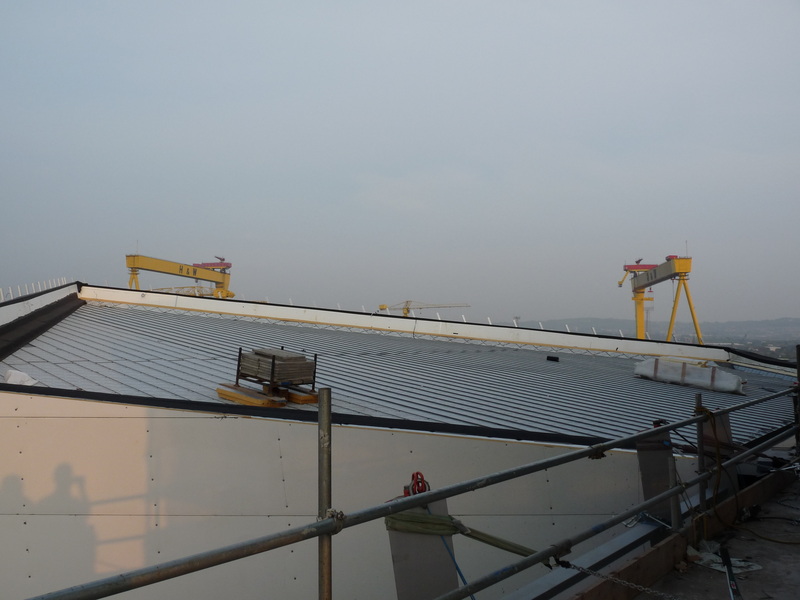 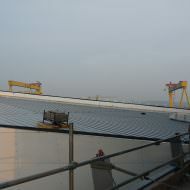 Spanwell manufactured 6200 sq m of rainscreening and the 3000 aluminium anodized panels at its factory in Carryduff. 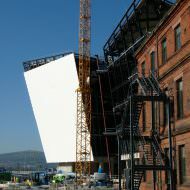 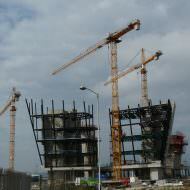 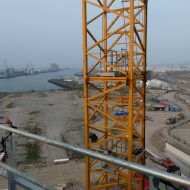 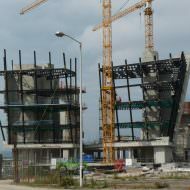 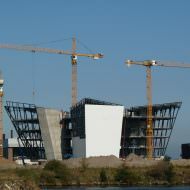 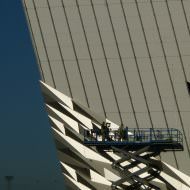 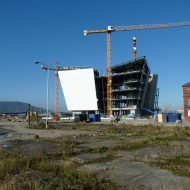 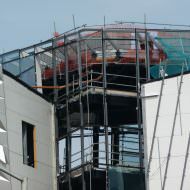 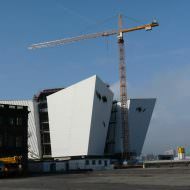 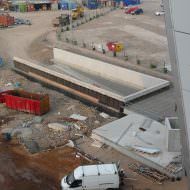 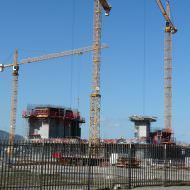 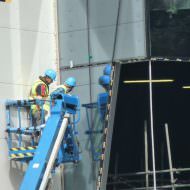 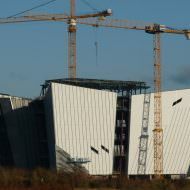 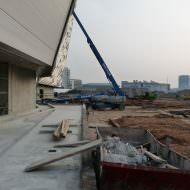 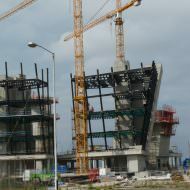 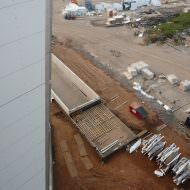 The last of the 3000 panels was lifted into place in August 2011. 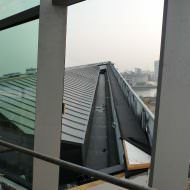 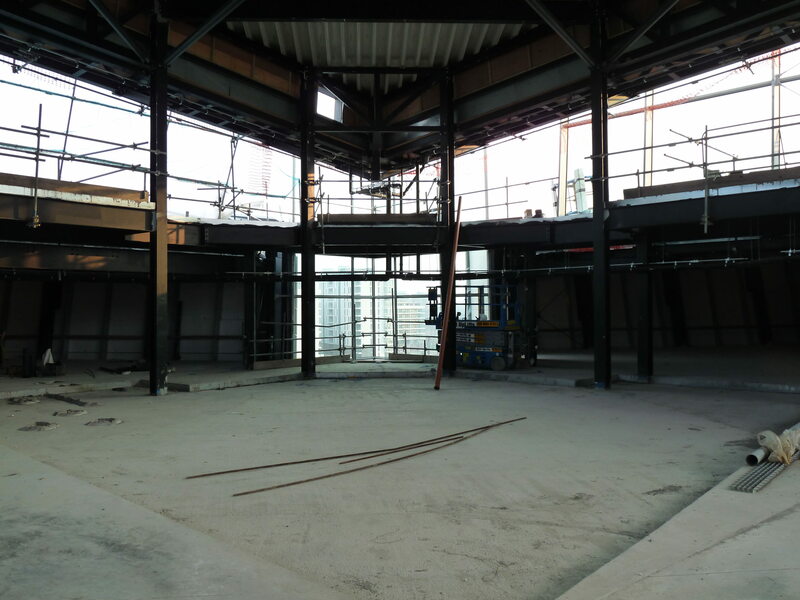 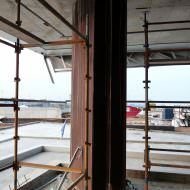 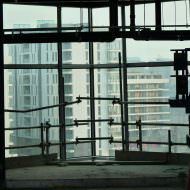 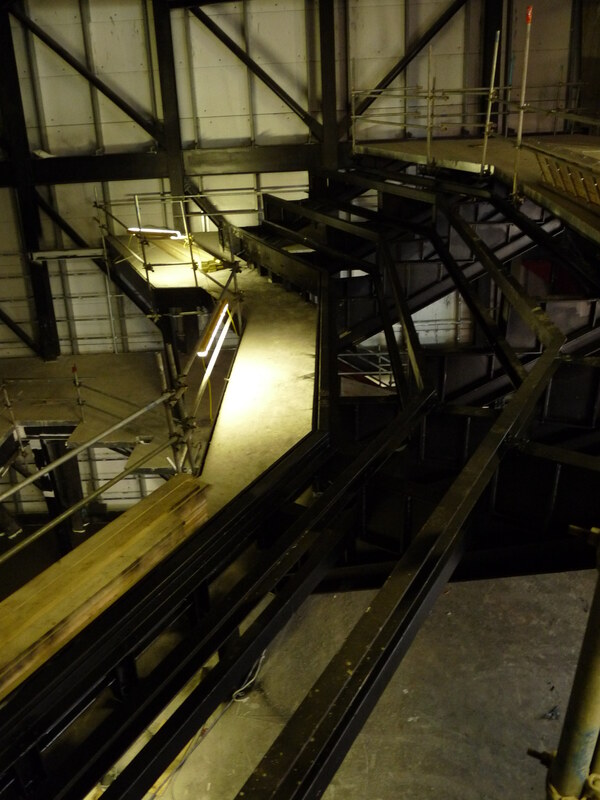 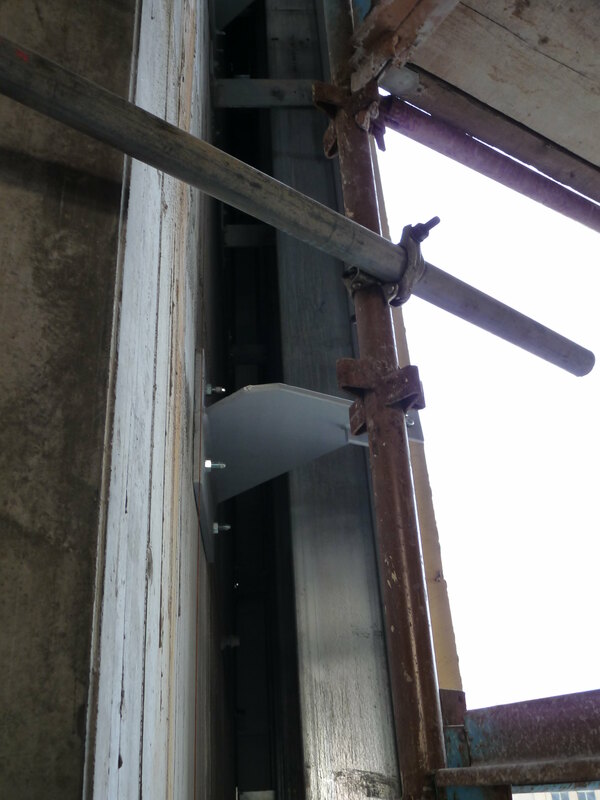 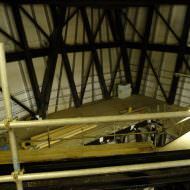 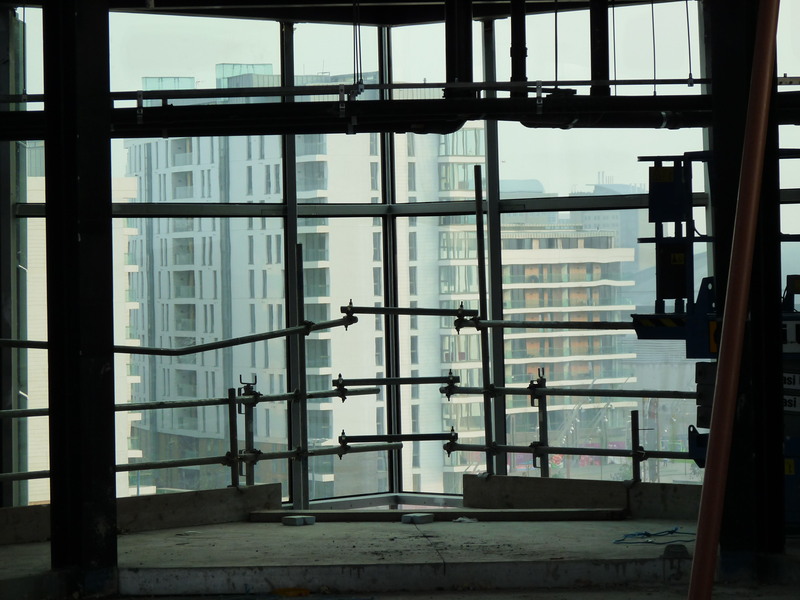 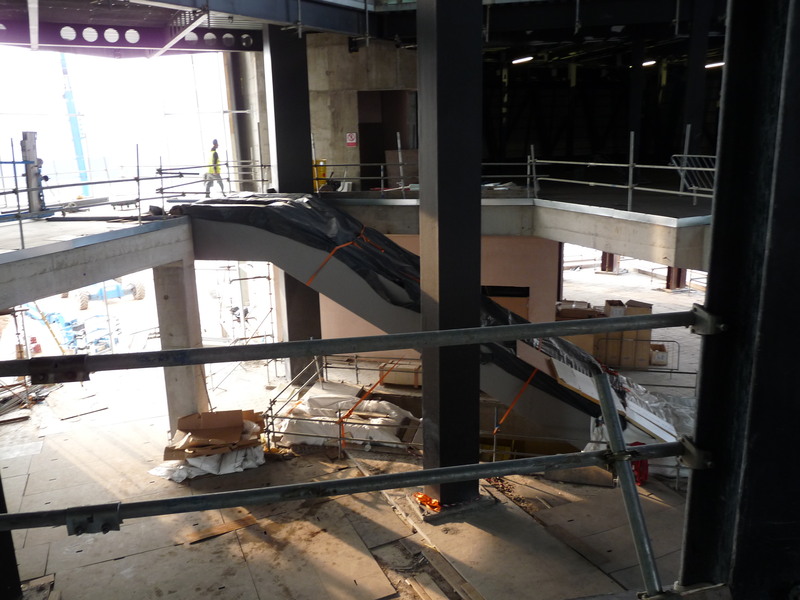 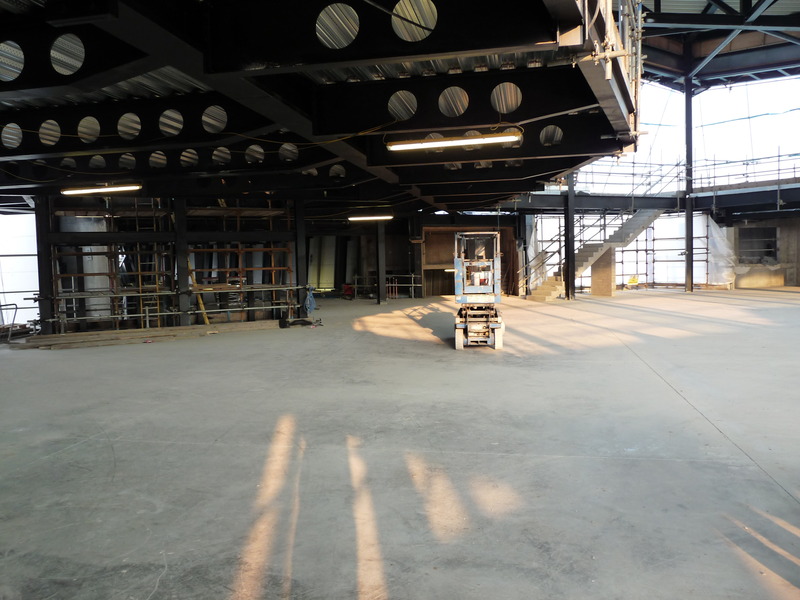 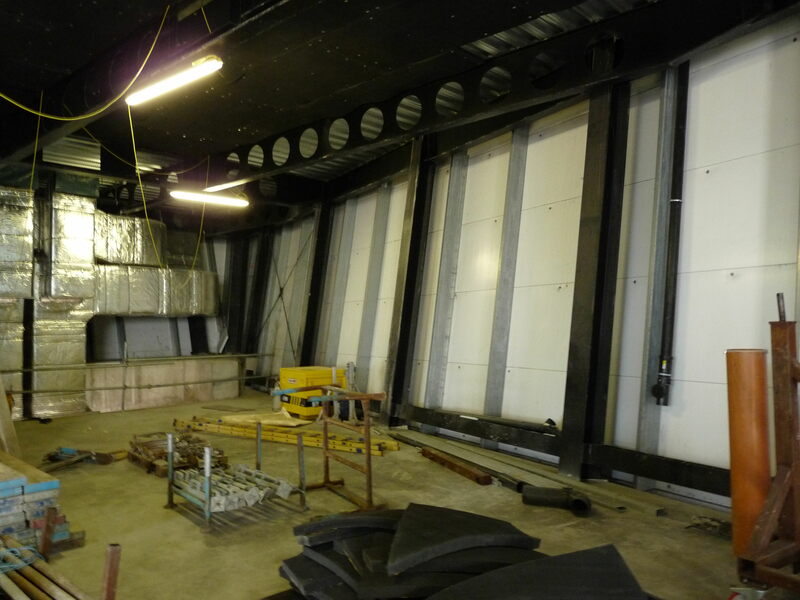 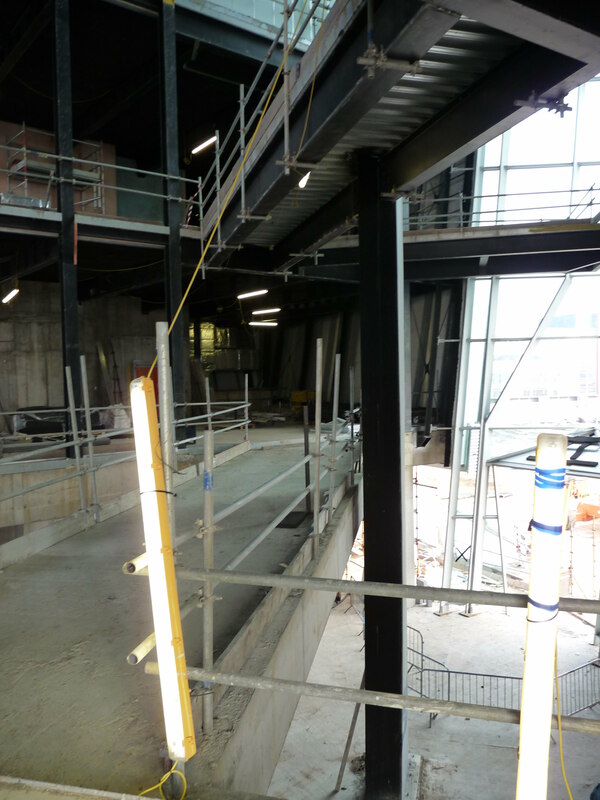 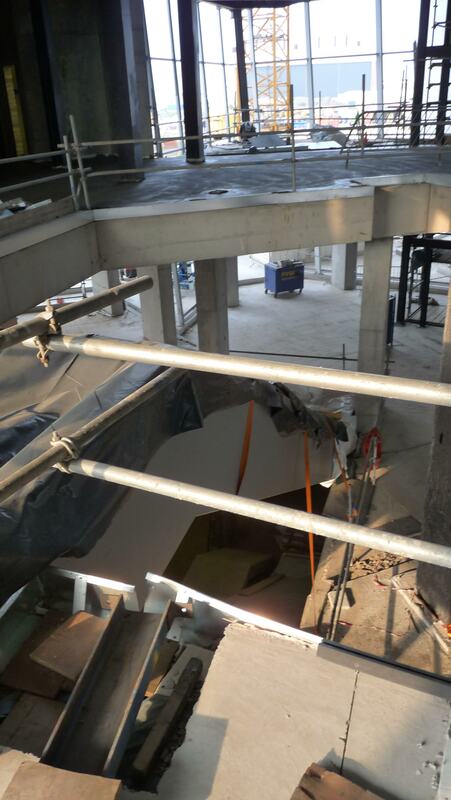 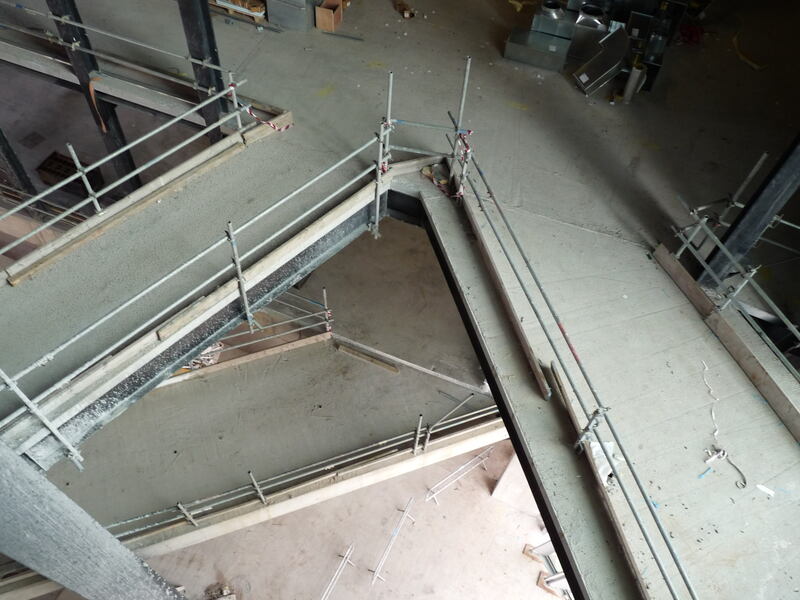 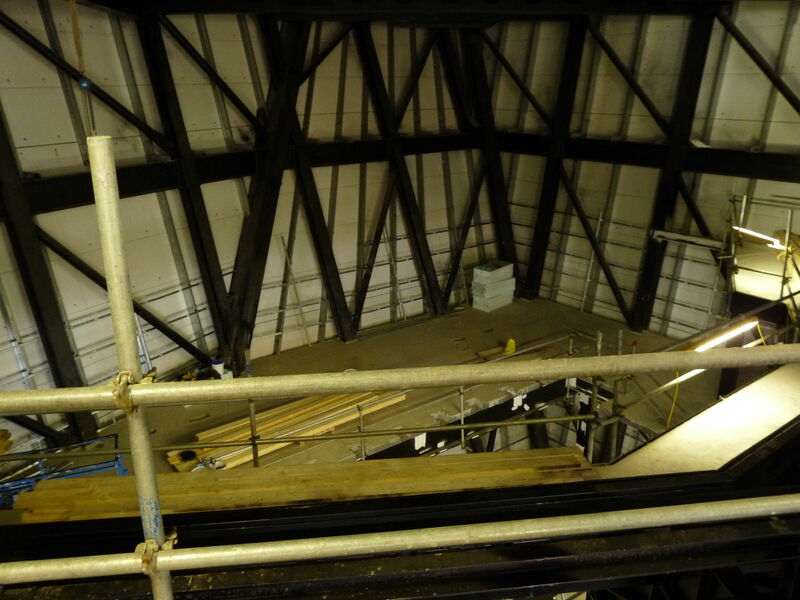 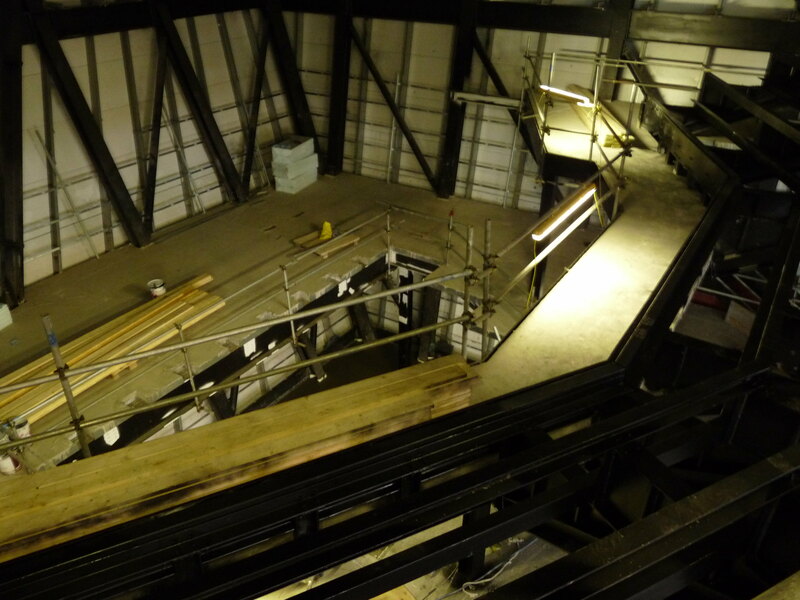 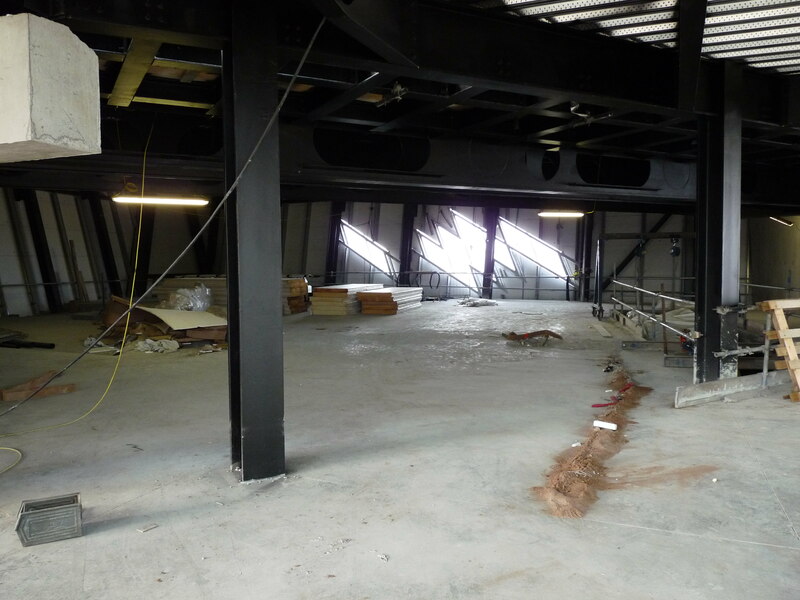 Each of the four ‘bows’ lean out at angles of up to 25 degrees creating larger floor plates on the upper floors. 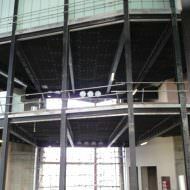 In the central atrium a number of glass escalators, each in excess of 20 metres long, stretch up through a central void and the largest of which is the the longest free standing escalator in Ireland. 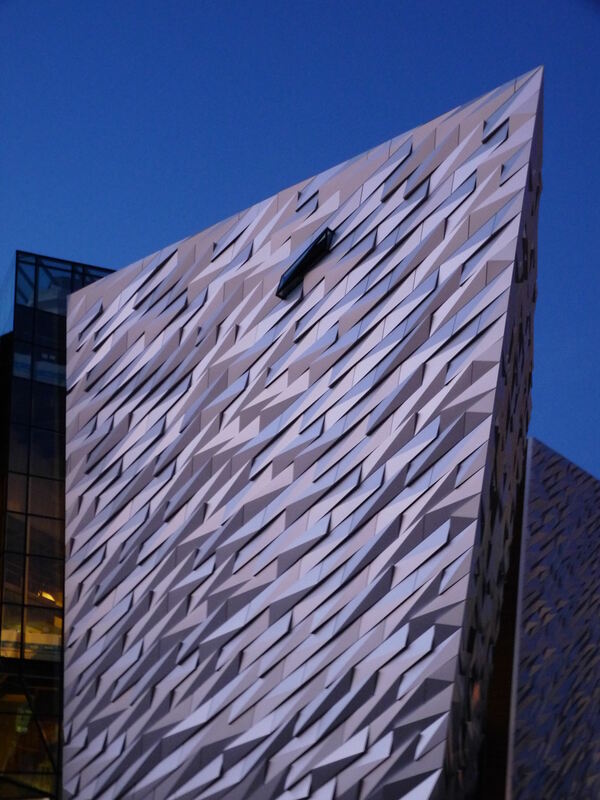 The sculptural ‘Titanic’ sign located outside Titanic Belfast at Titanic Plaza was constructed by BSK Engineering and transported from Co. Tyrone to be installed in February 2012. 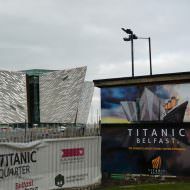 The 14.5m long sign was laser cut to the same dimensions – 4.5m tall and 14.5m long – as the private promenades available for Titanic’s First Class Parlour Suites and is the same weight as the Titanic’s main anchor. 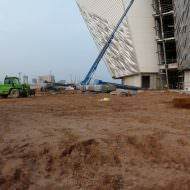 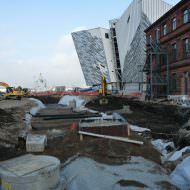 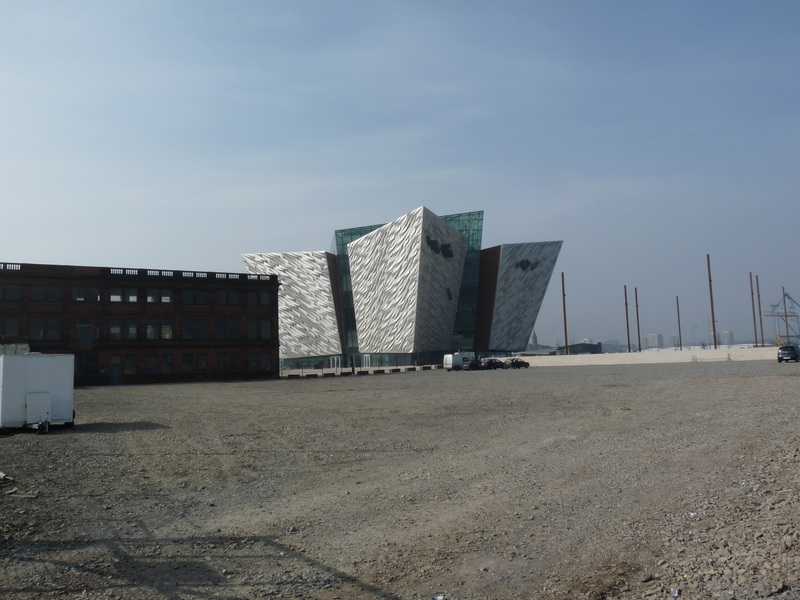 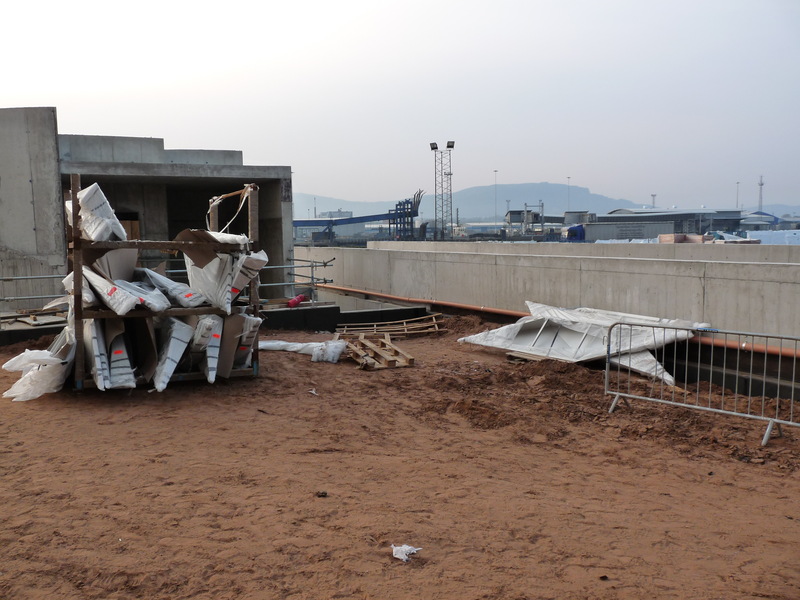 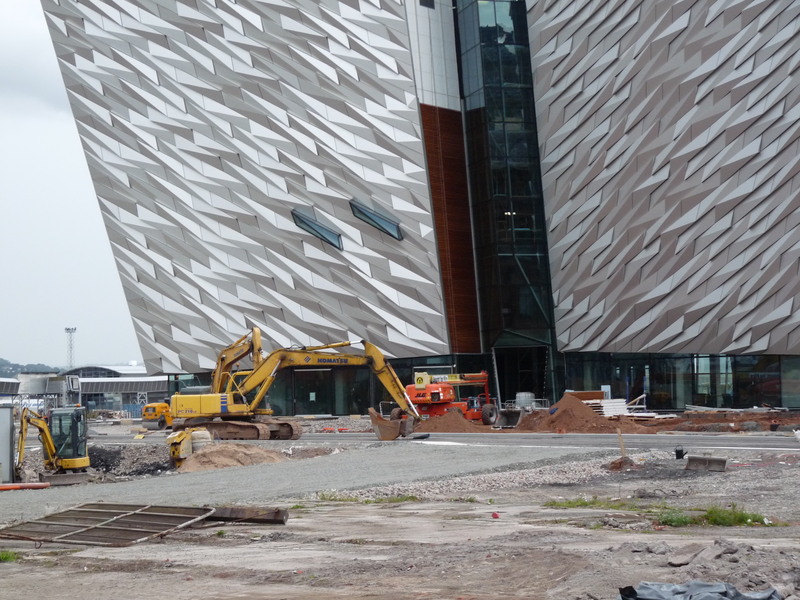 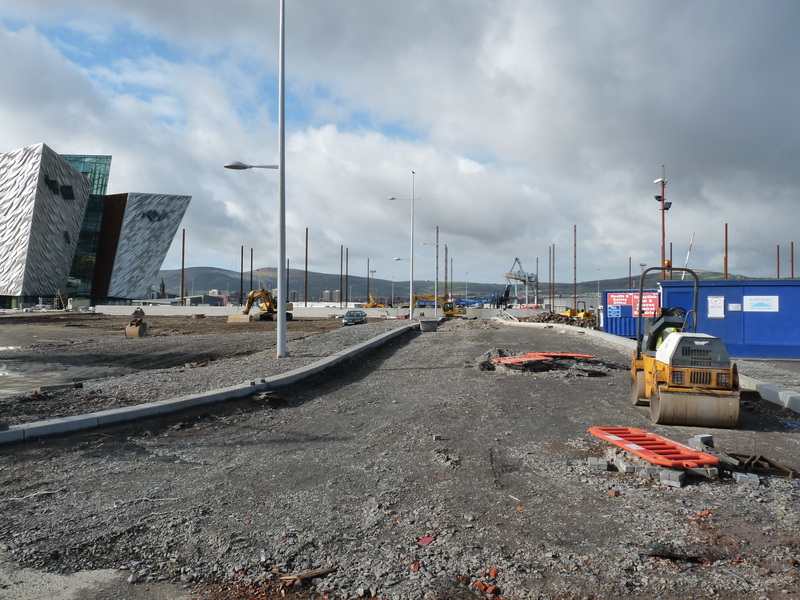 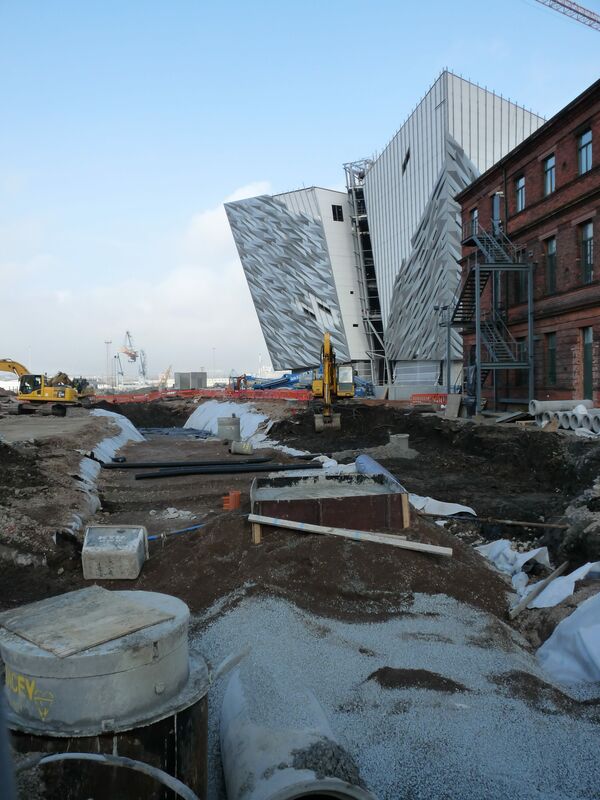 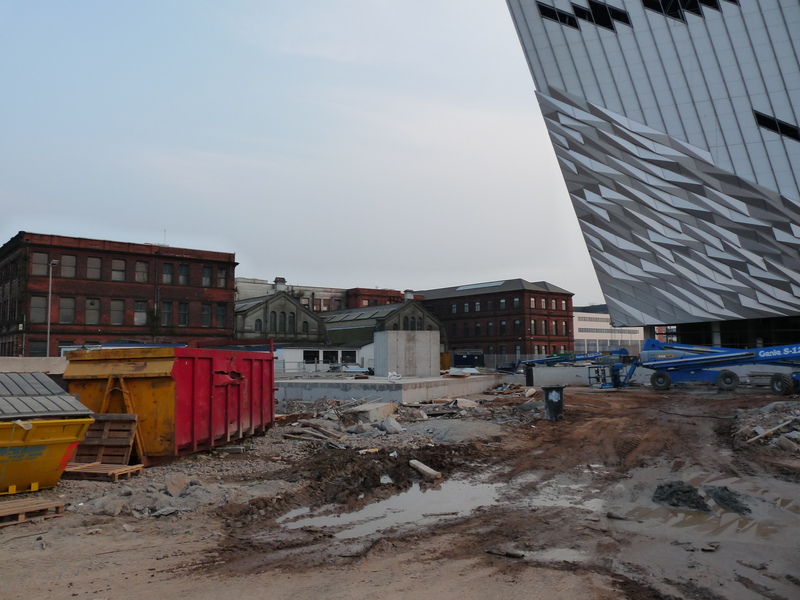 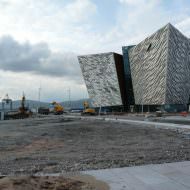 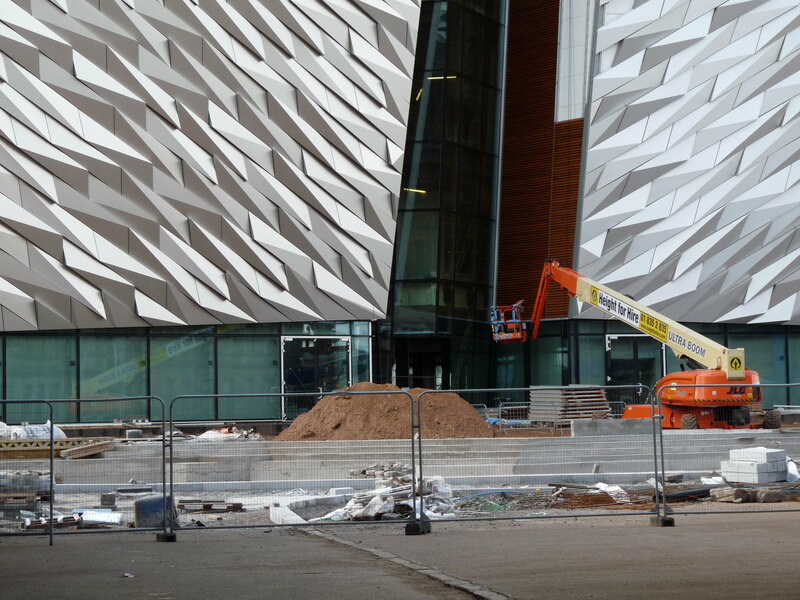 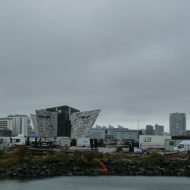 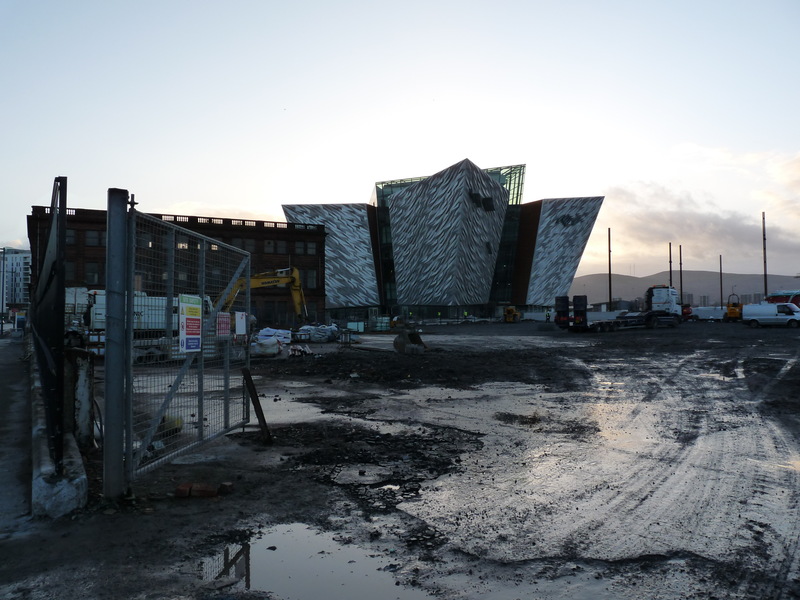 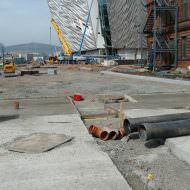 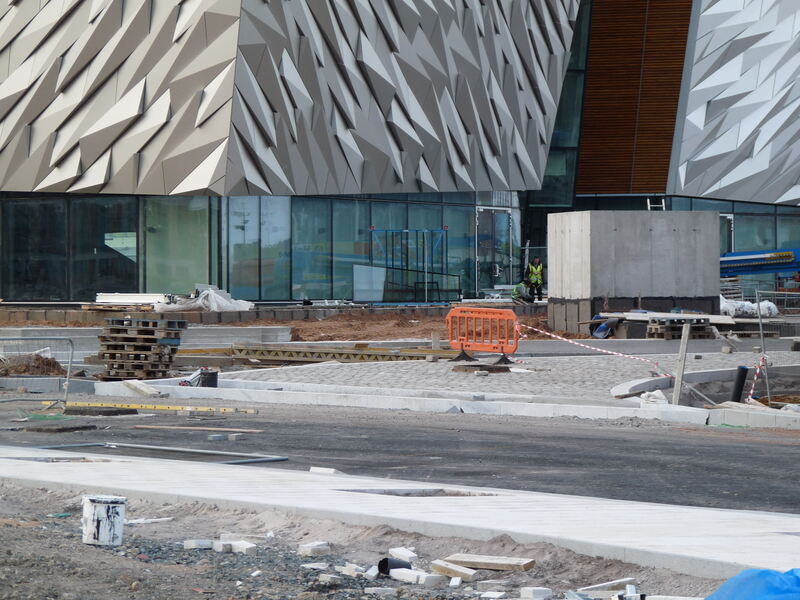 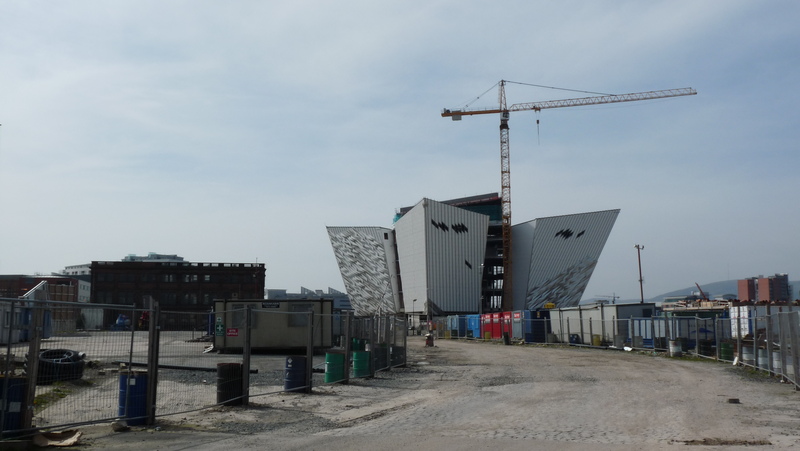 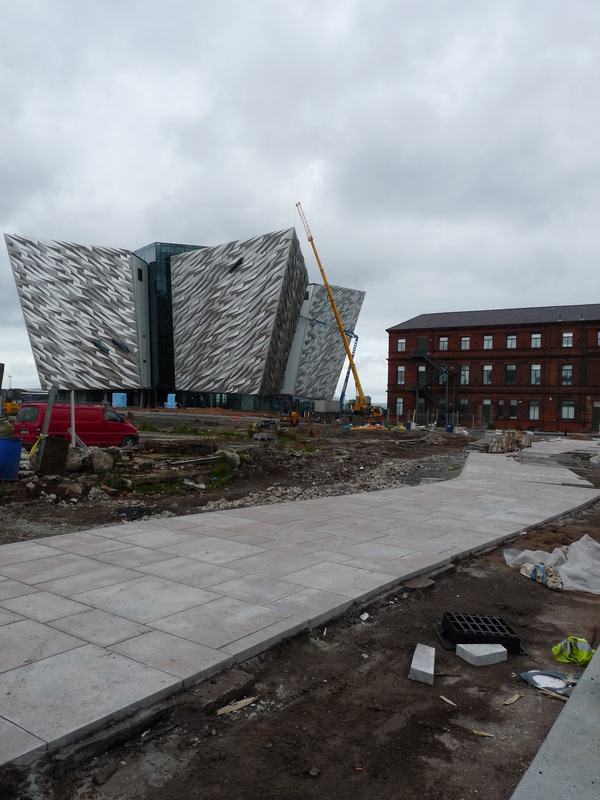 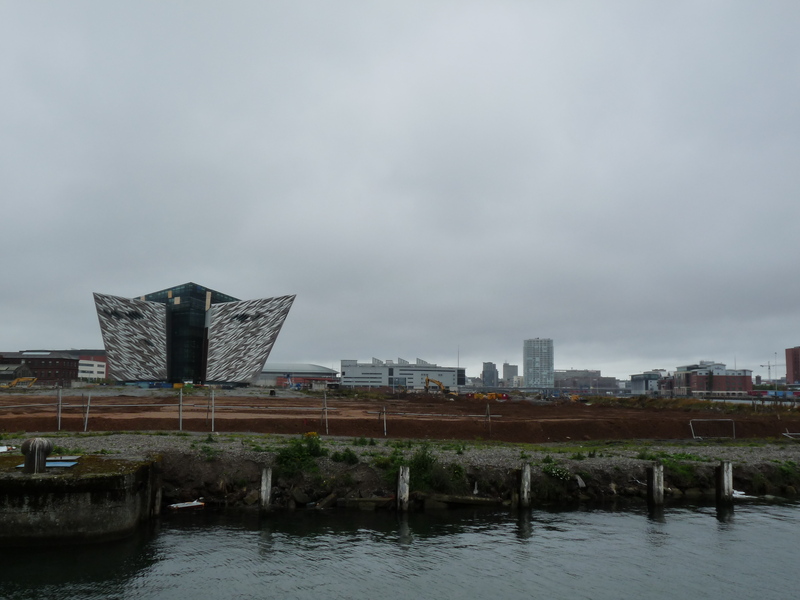 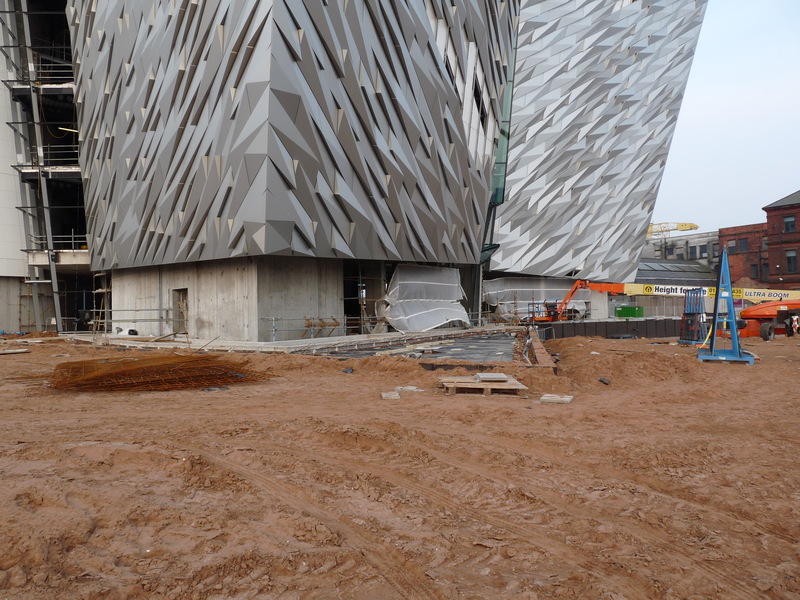 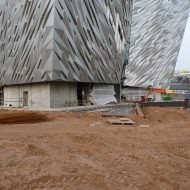 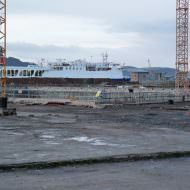 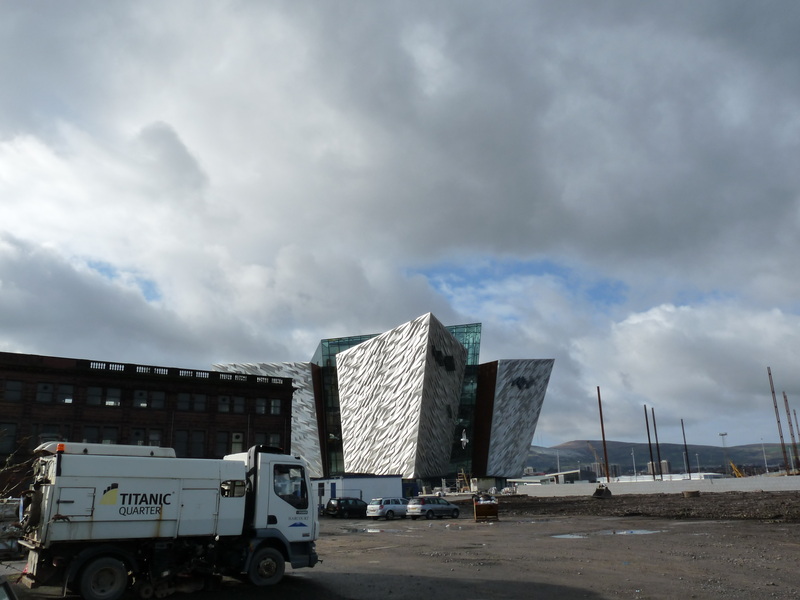 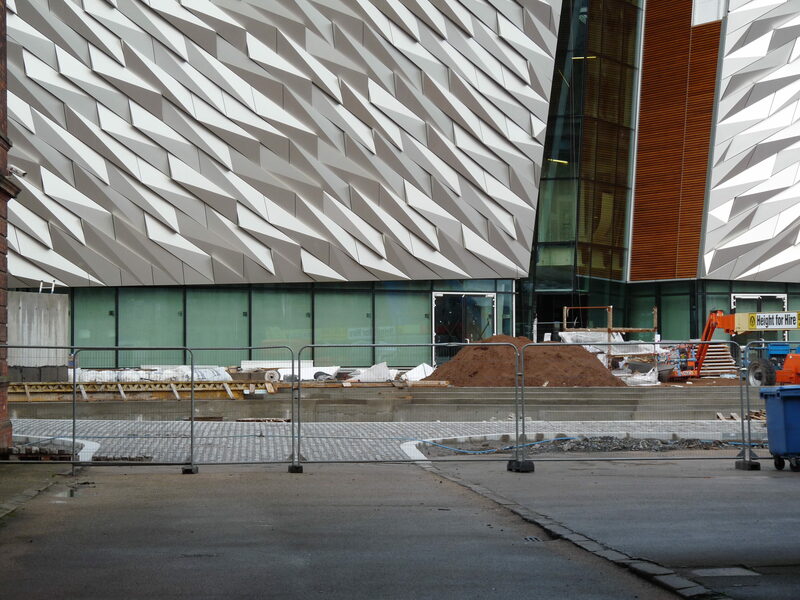 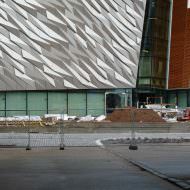 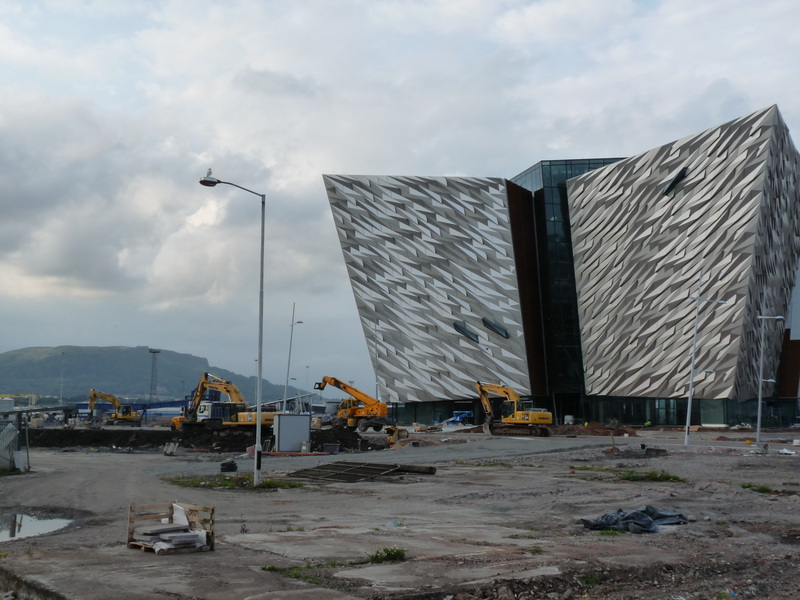 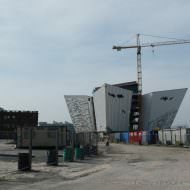 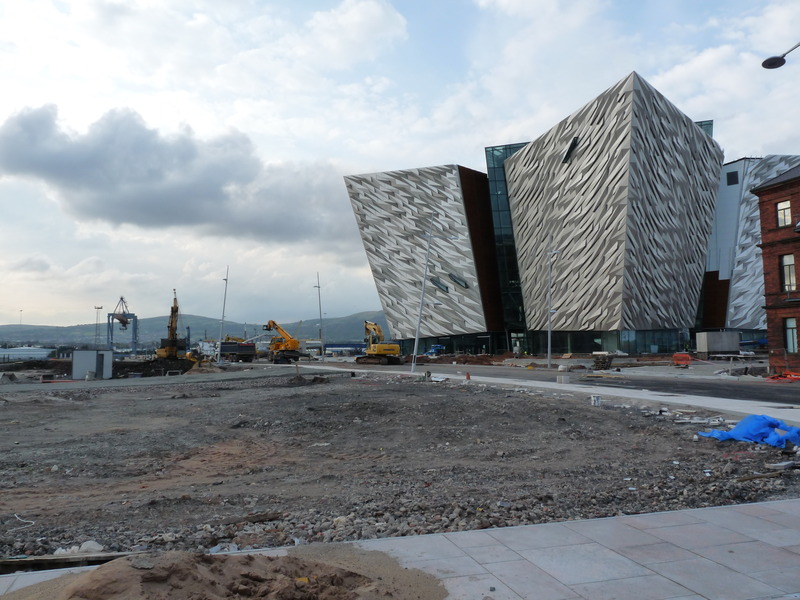 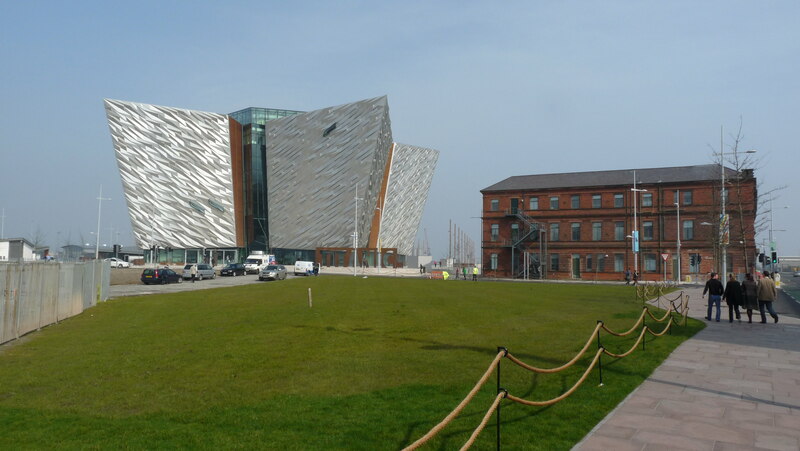 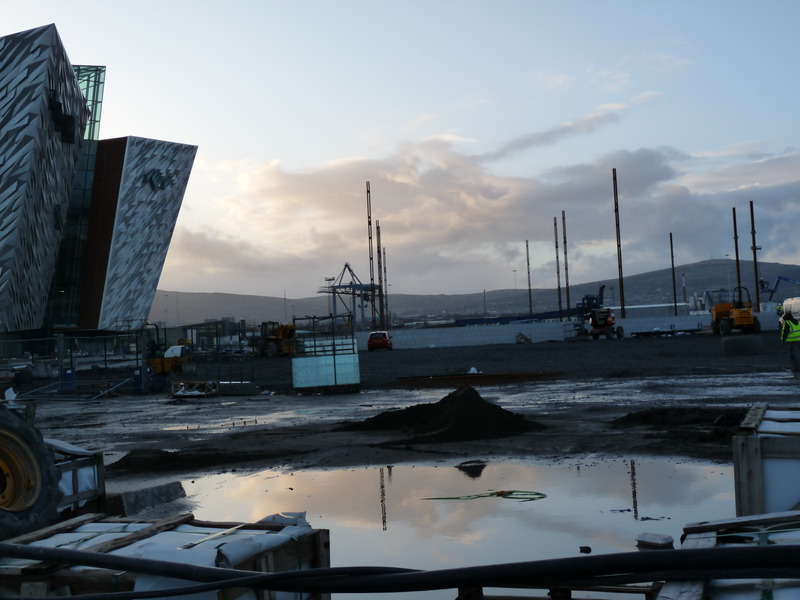 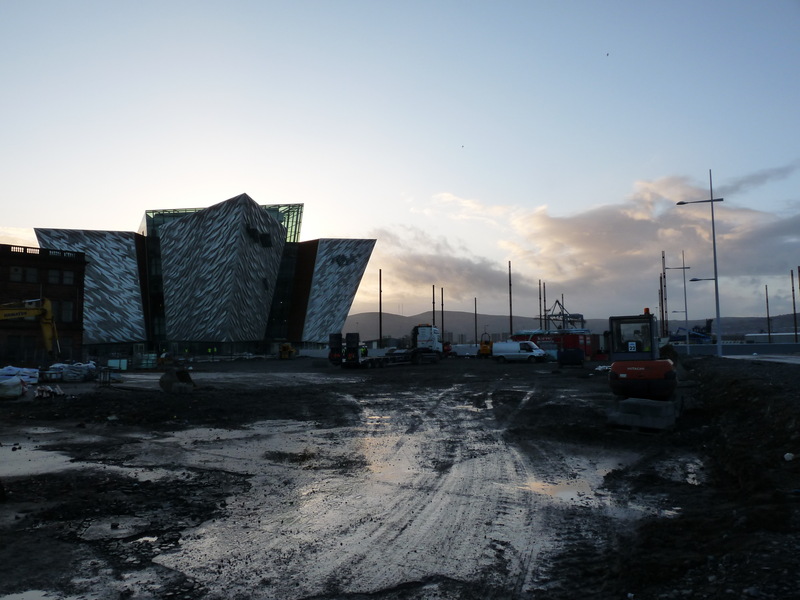 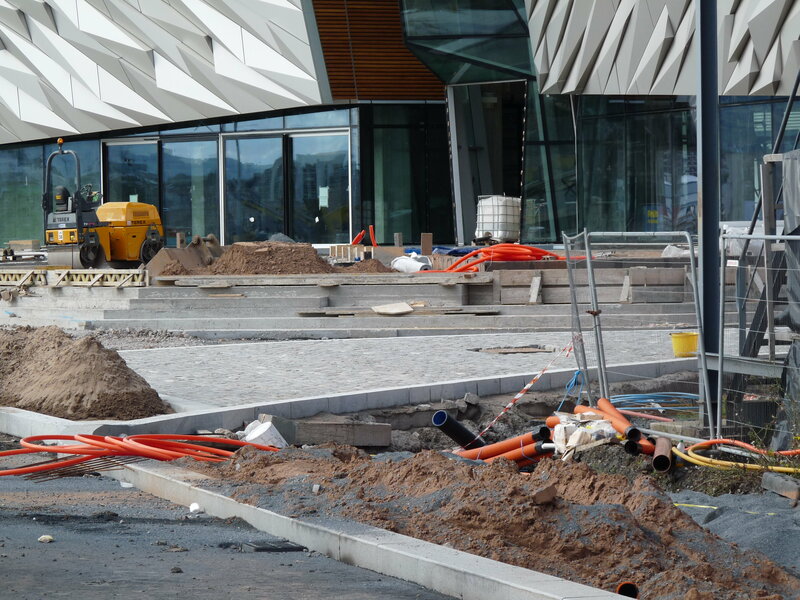 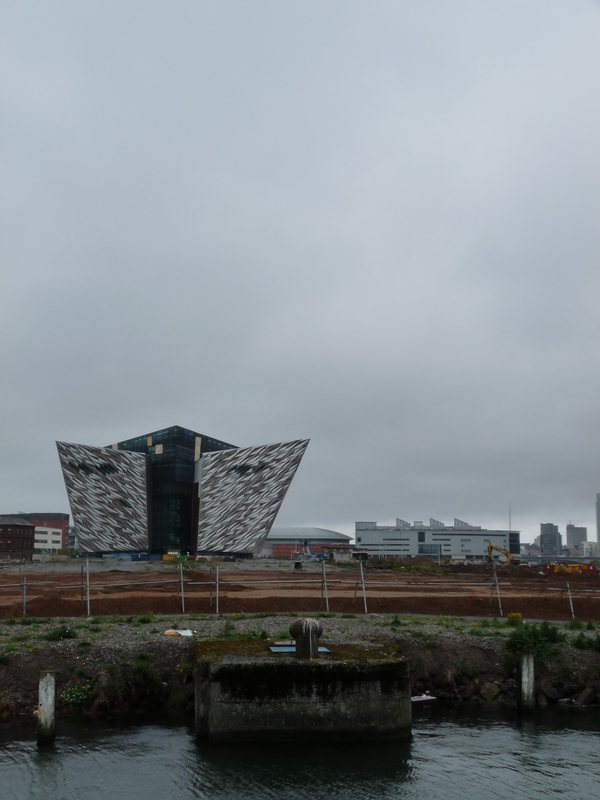 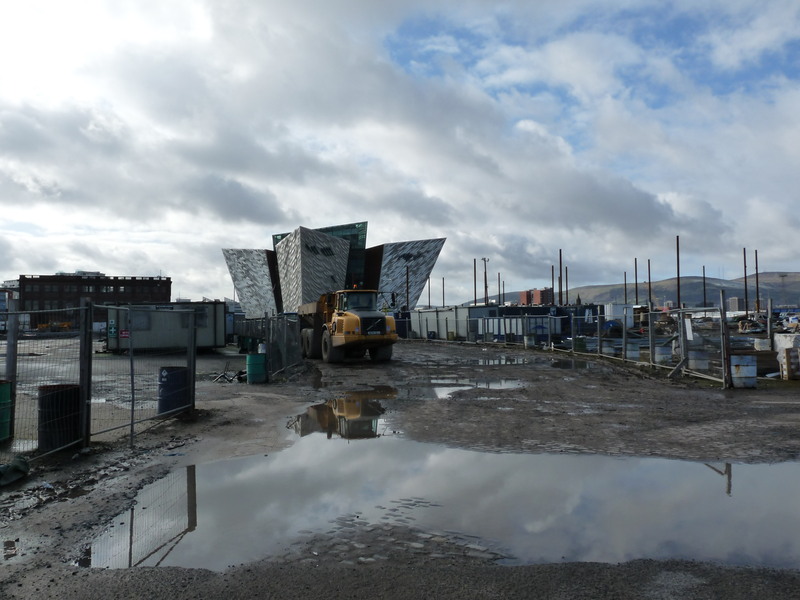 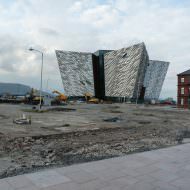 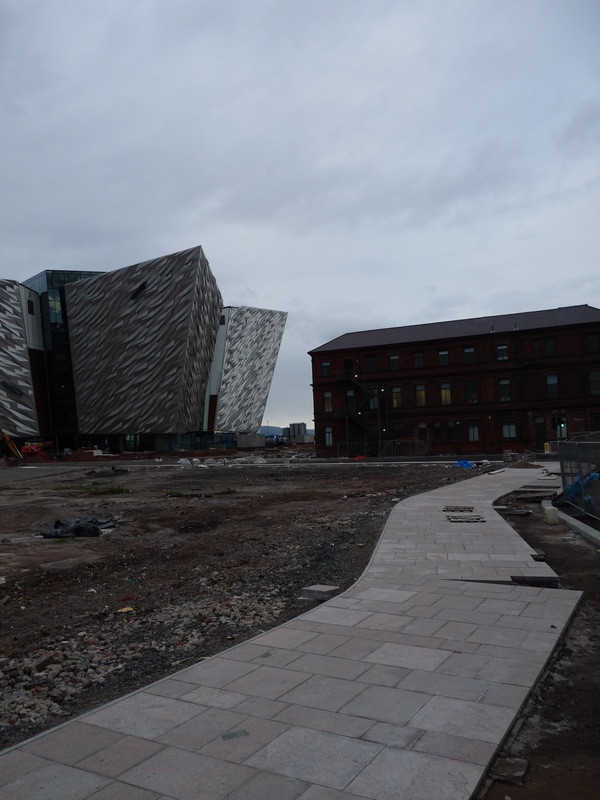 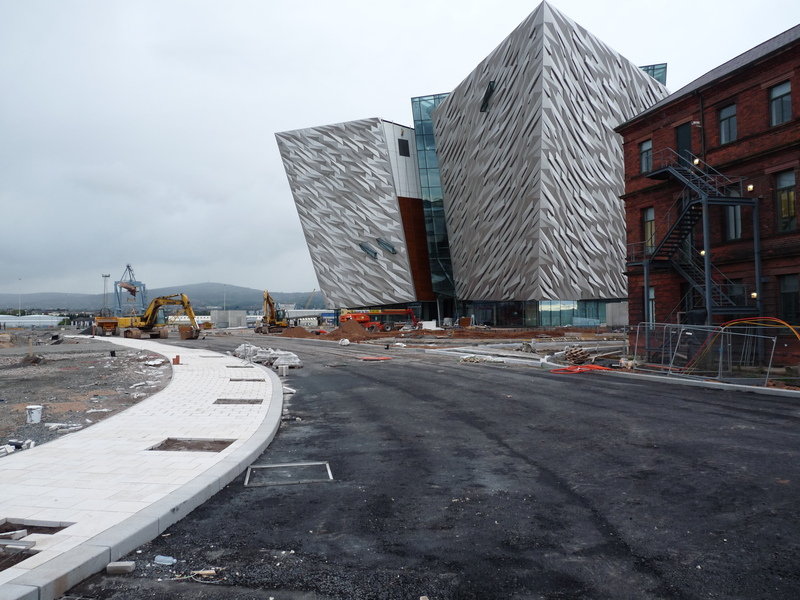 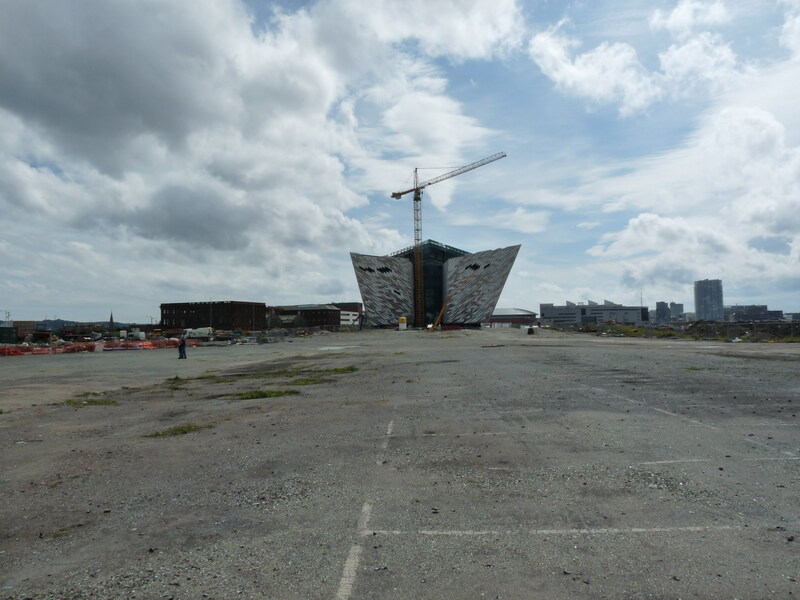 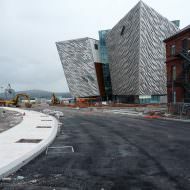 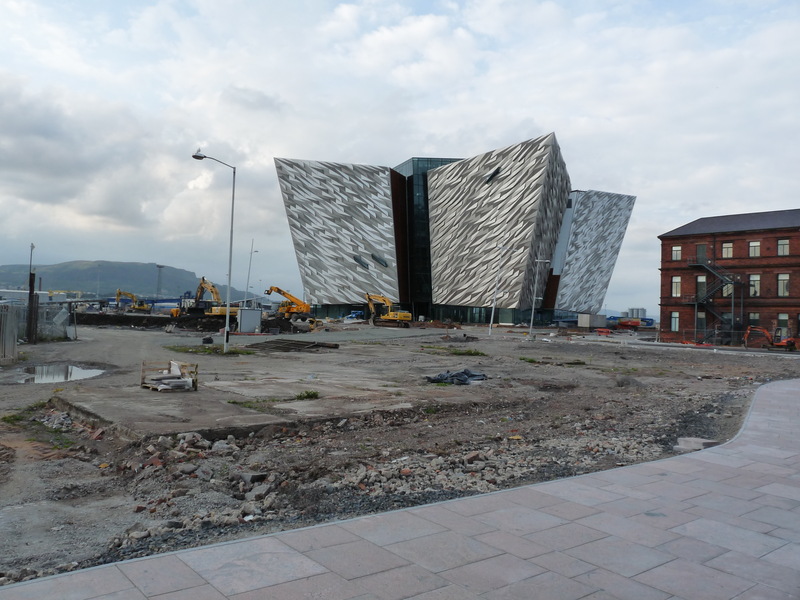 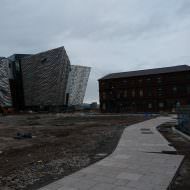 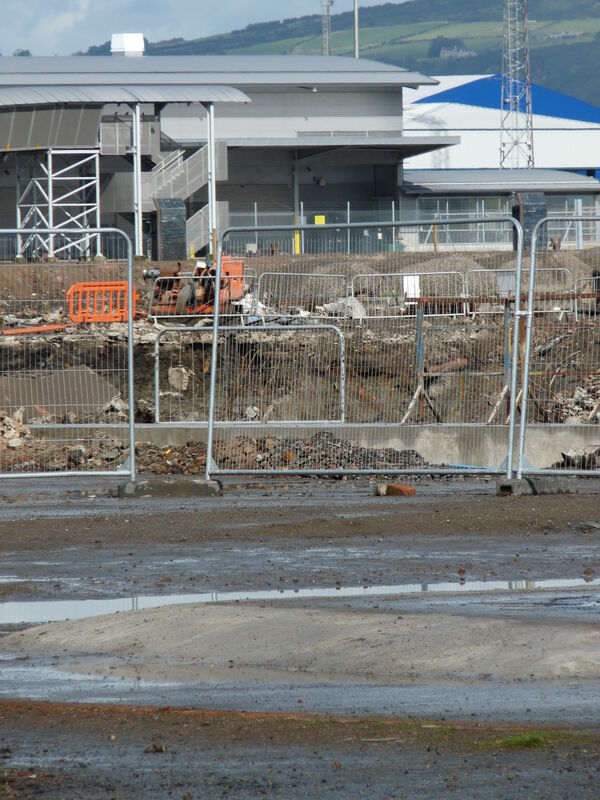 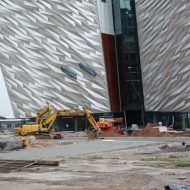 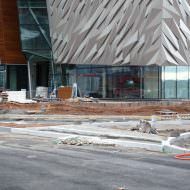 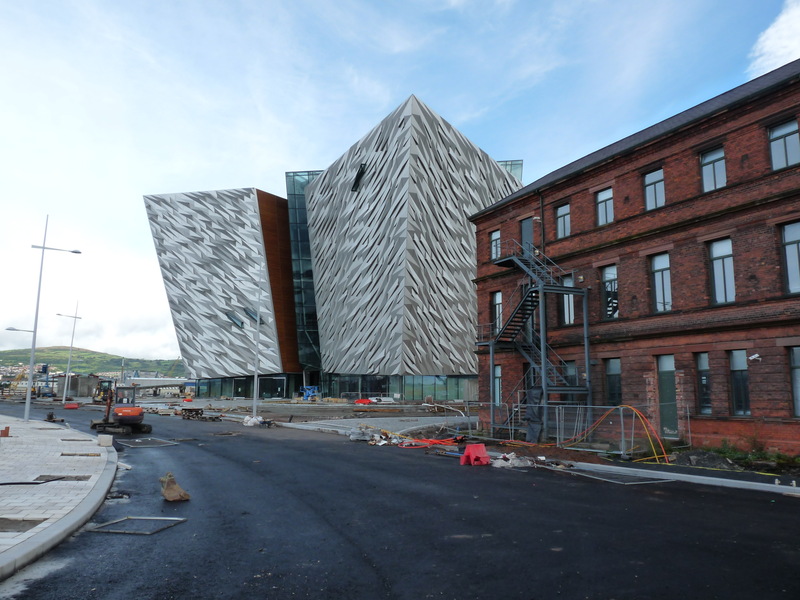 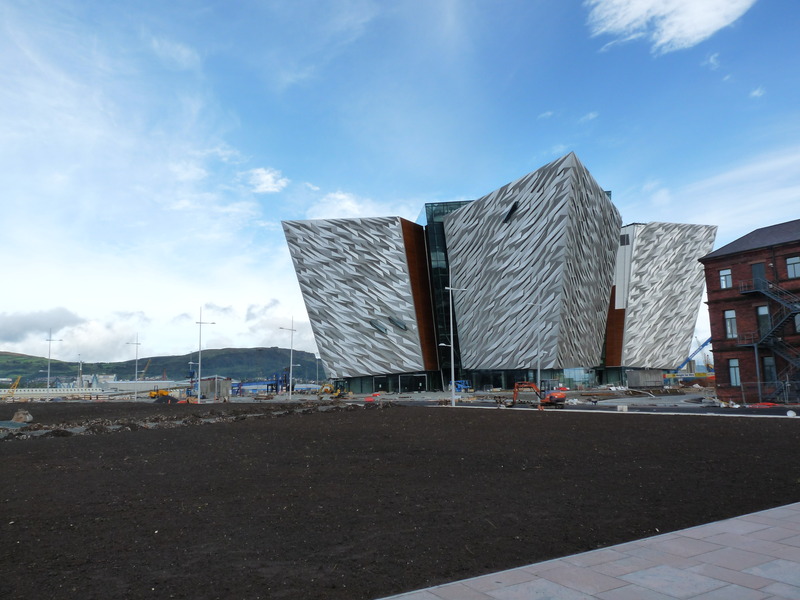 In March 2011 with one year until the scheduled opening of Titanic Belfast the Northern Ireland Tourist Board expressed concern that the £10m Slipways Park would not be built before April 2012. 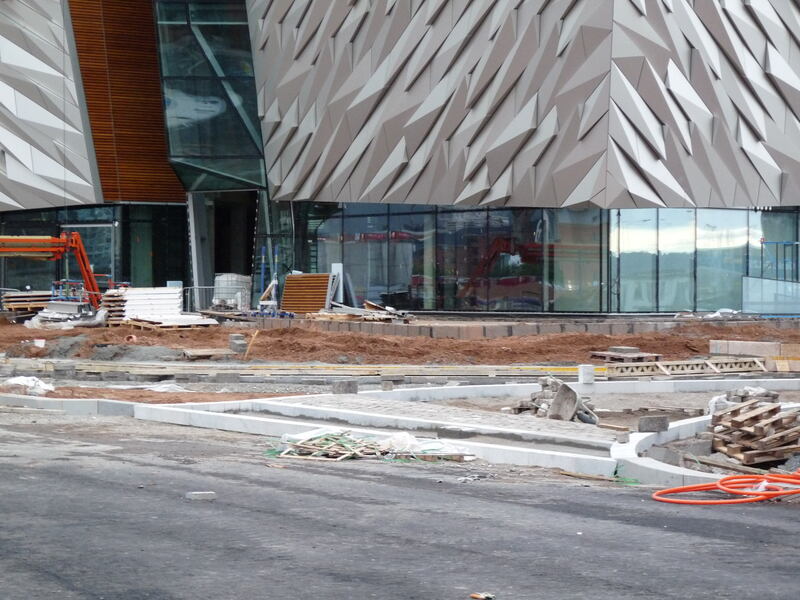 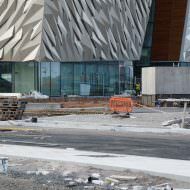 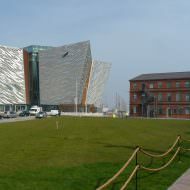 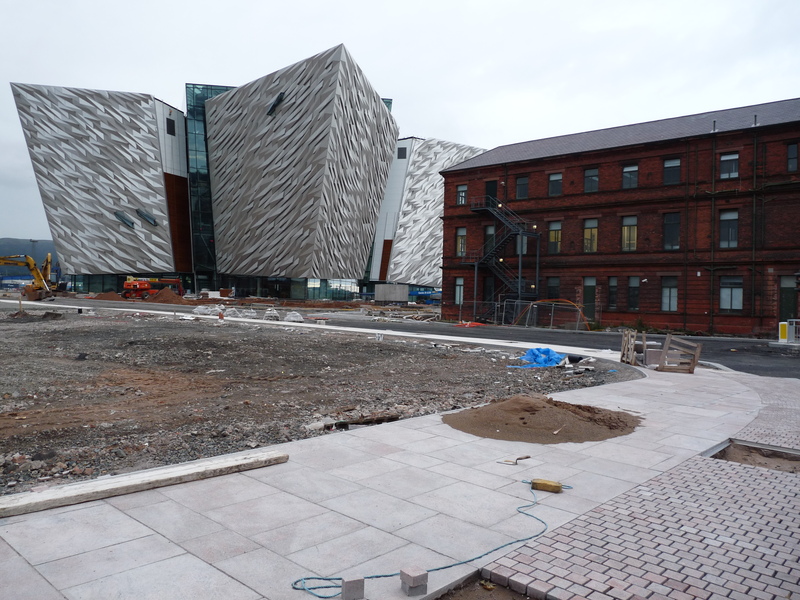 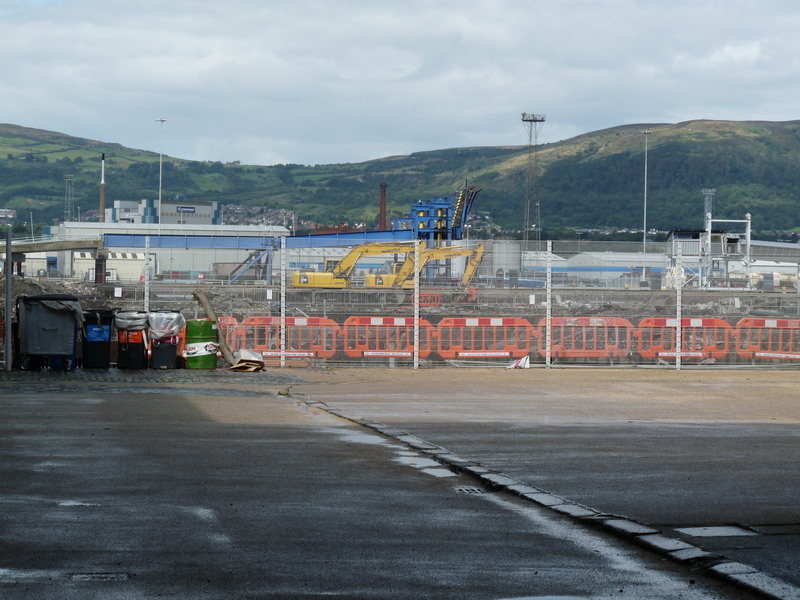 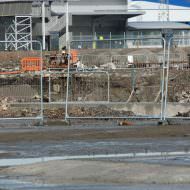 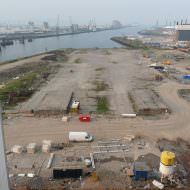 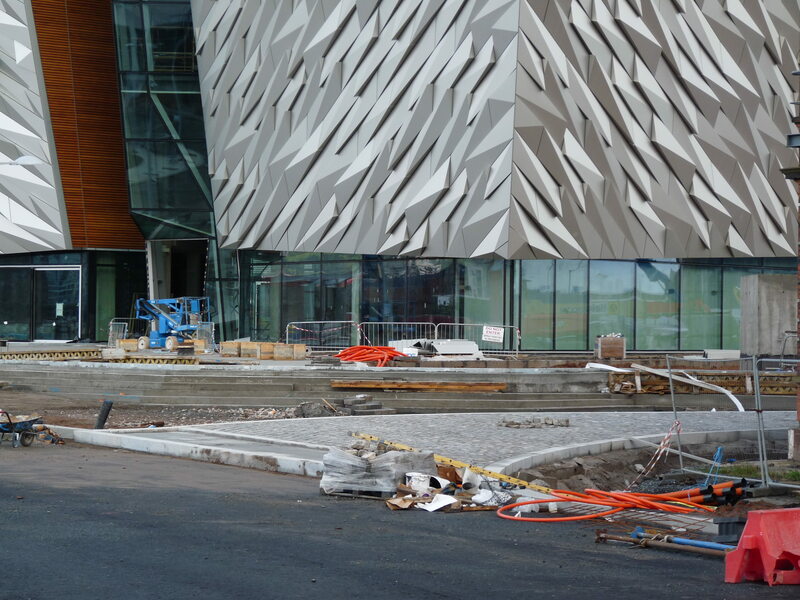 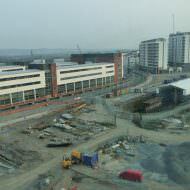 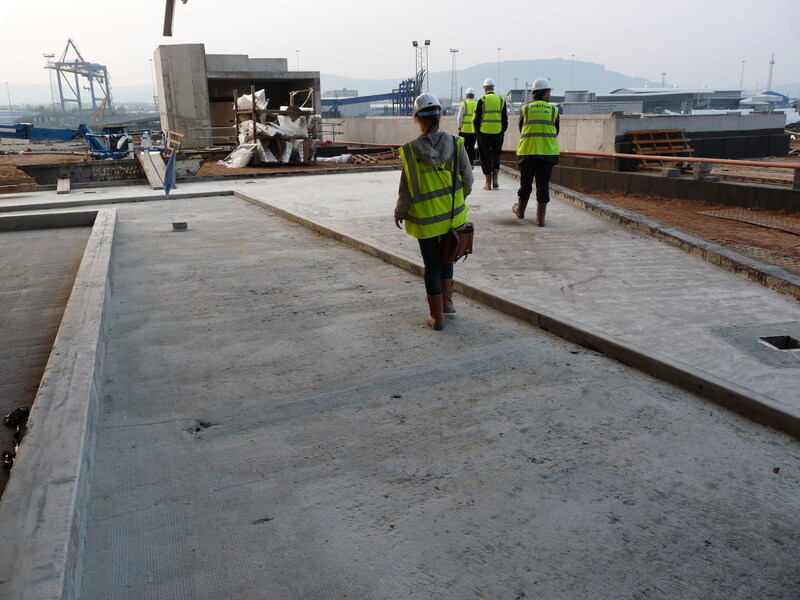 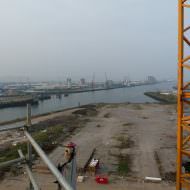 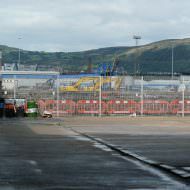 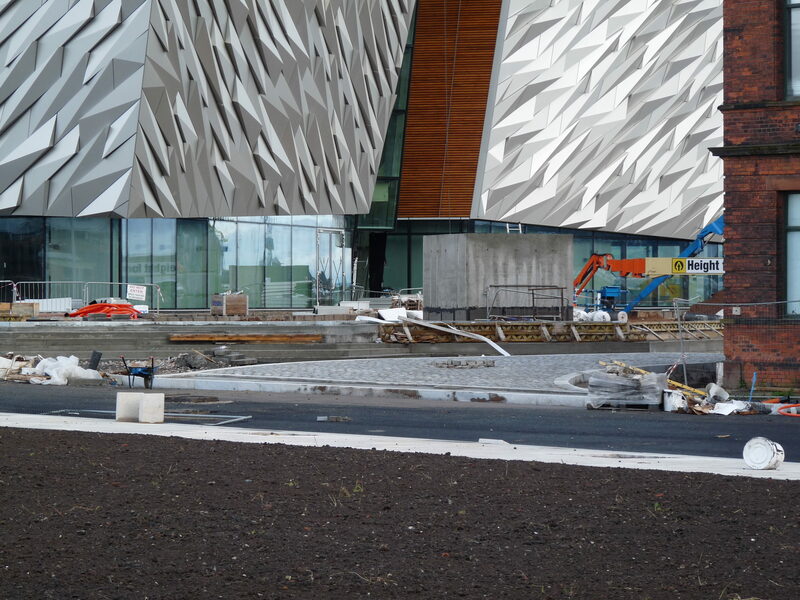 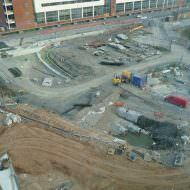 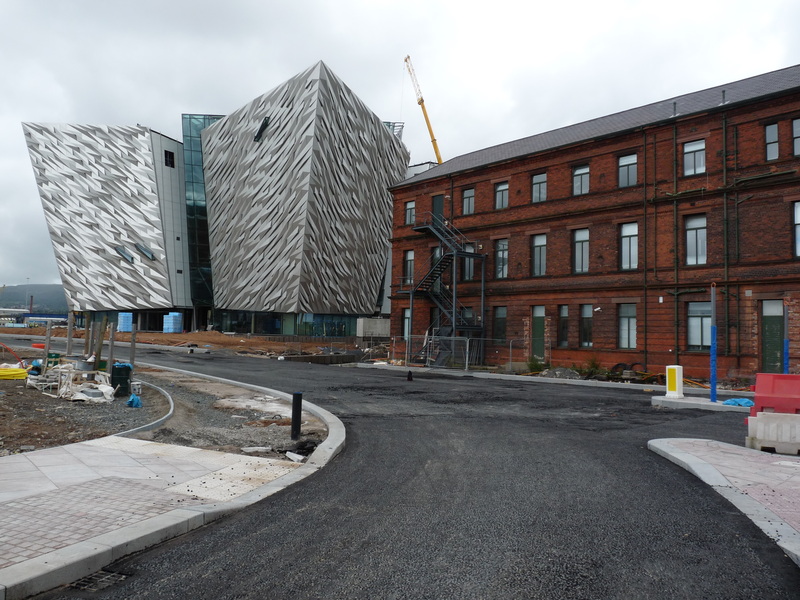 The Slipways were landscaped and completed for March 2012. 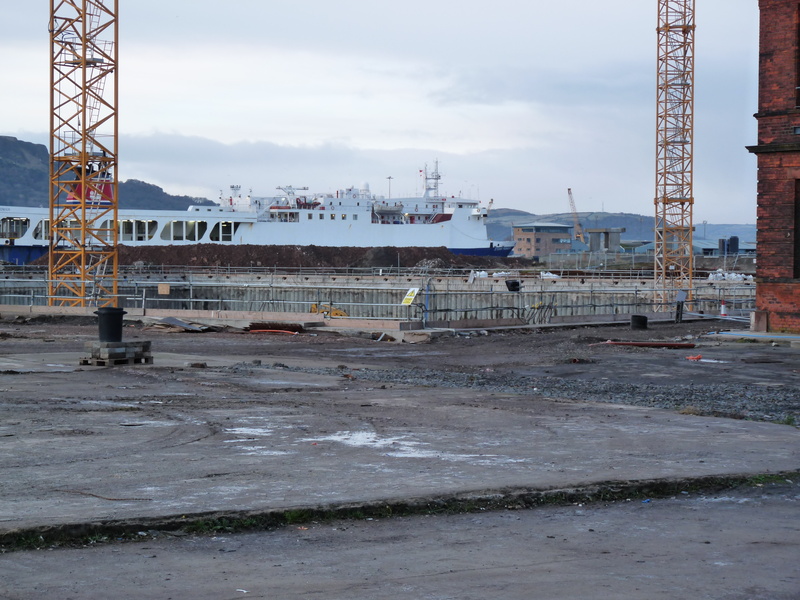 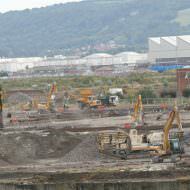 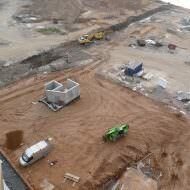 More details about Slipways Park can be found at this link. 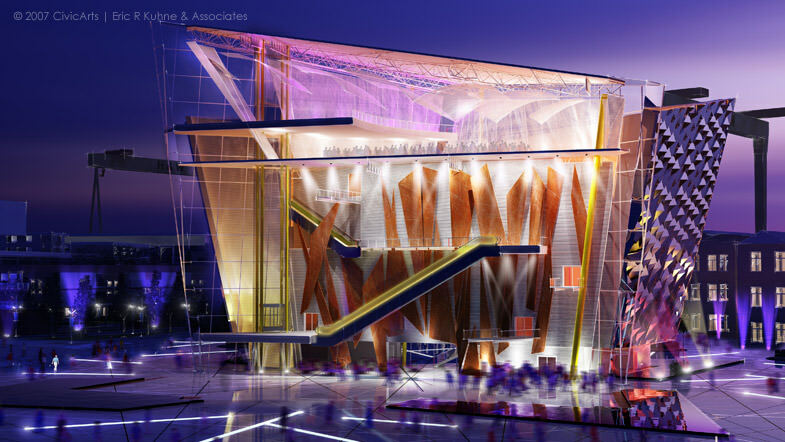 As the design of the overall project and operating contract progressed, a number of drawbacks of the Flying Theatre became apparent. 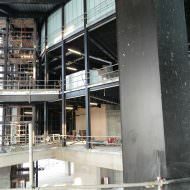 There were issues surrounding a possible lack of interest from older people, height restrictions affecting younger children and family groups and the cost of refreshing the film experience. 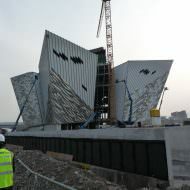 Due to these concerns and following discussions between Harcourt Construction and Professor Ballard [who first located the remains of Titanic] proposals for the Immersive Theatre developed. 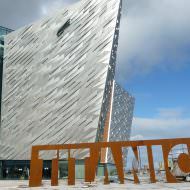 Discussions were largely confidential until early in 2010 when wider stakeholders became aware of the concept at the Titanic Storyline Group which developed the details of how the Titanic story would be told. 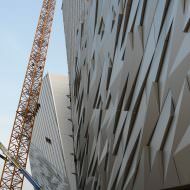 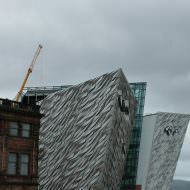 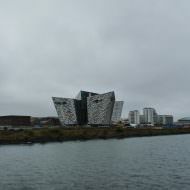 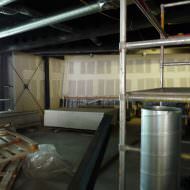 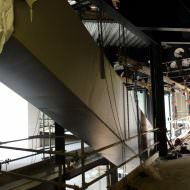 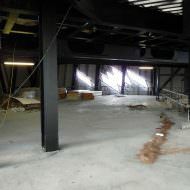 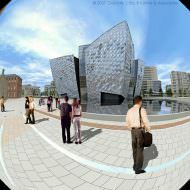 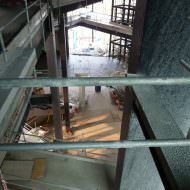 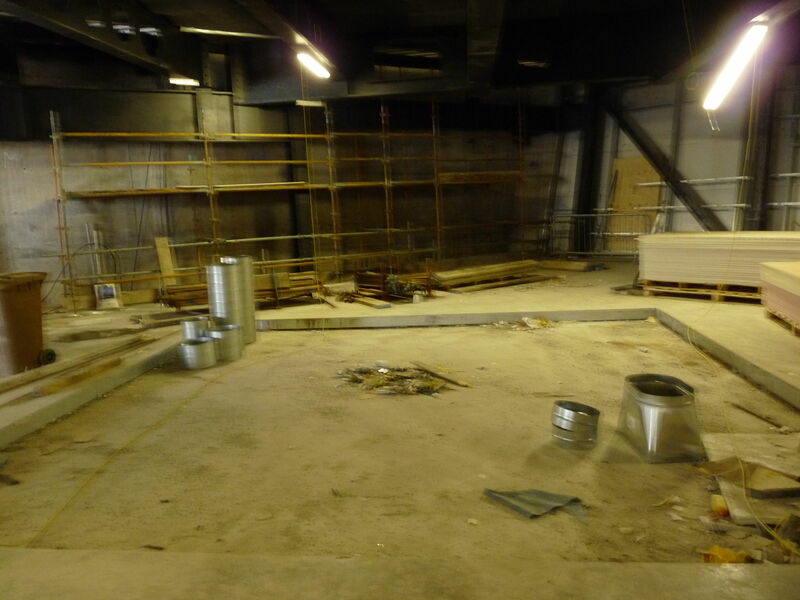 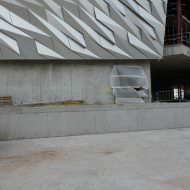 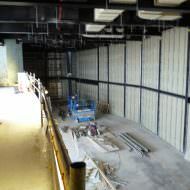 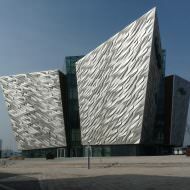 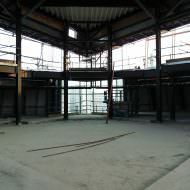 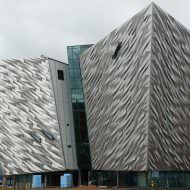 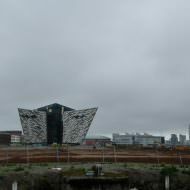 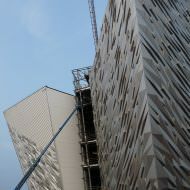 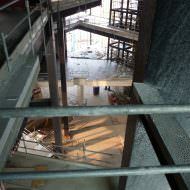 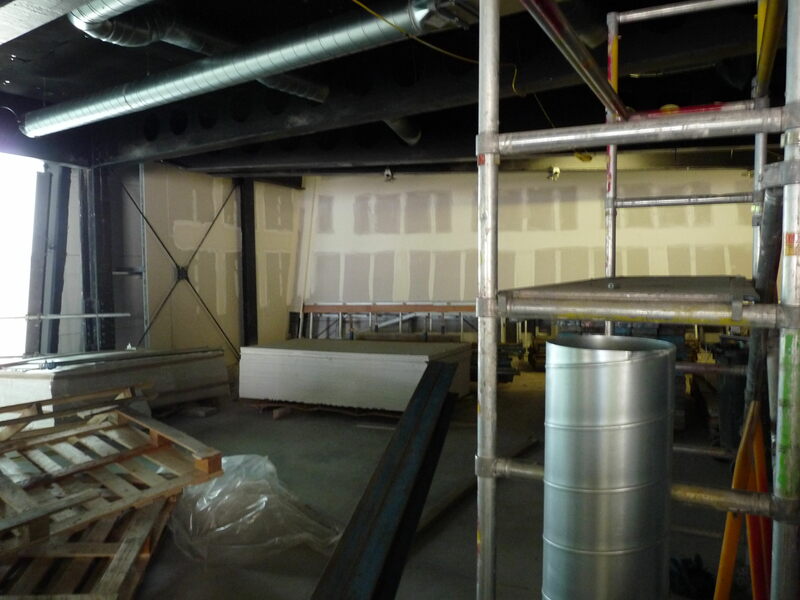 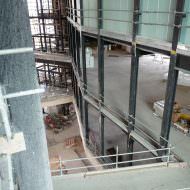 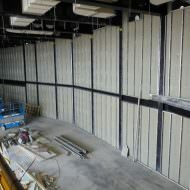 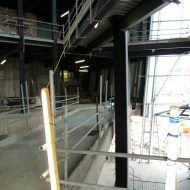 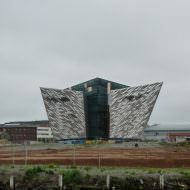 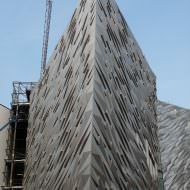 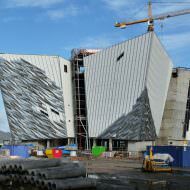 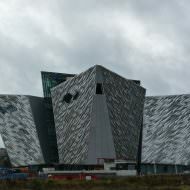 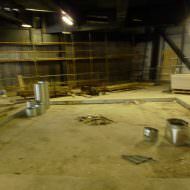 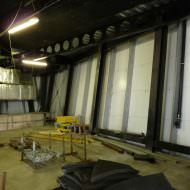 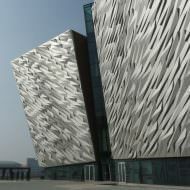 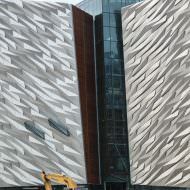 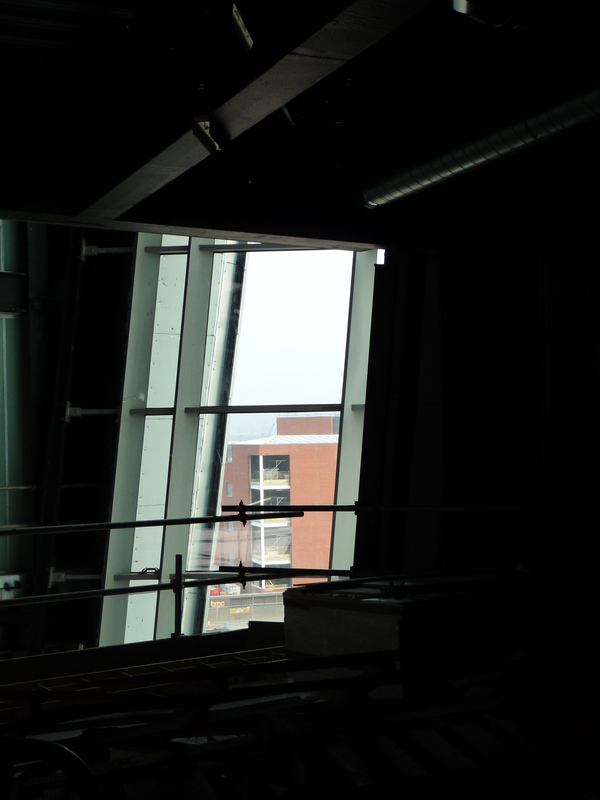 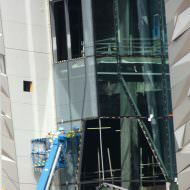 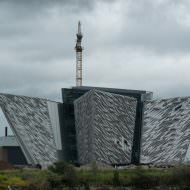 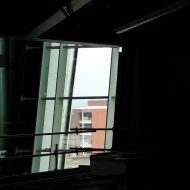 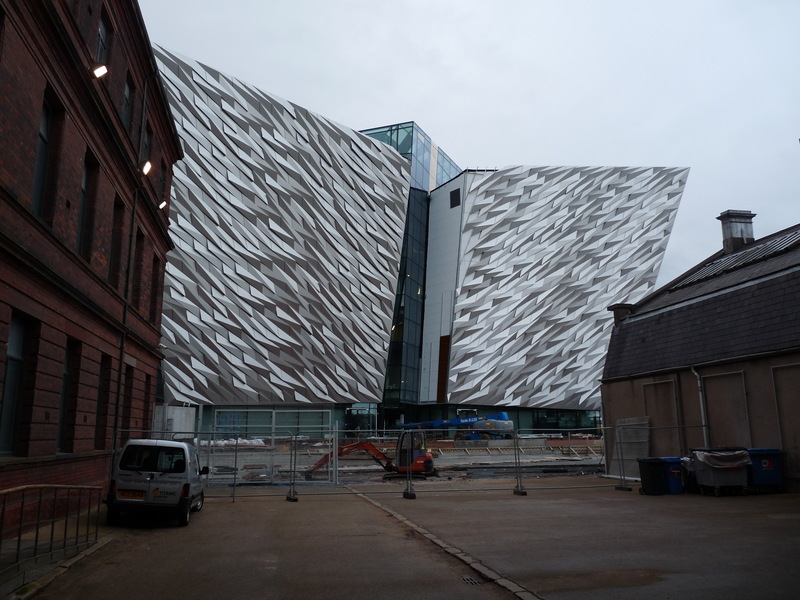 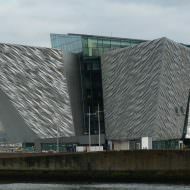 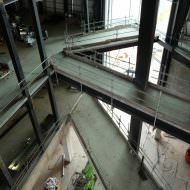 This element became Gallery 9 of Titanic Belfast.